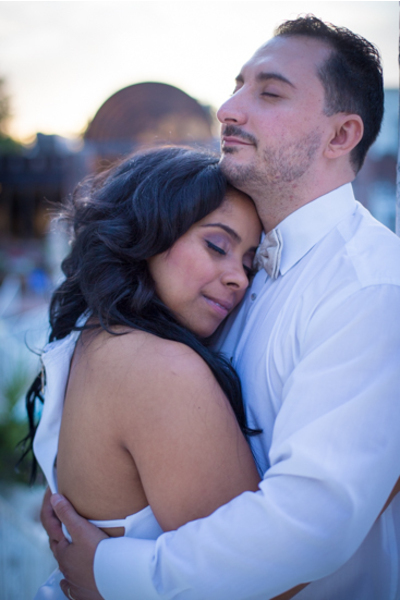 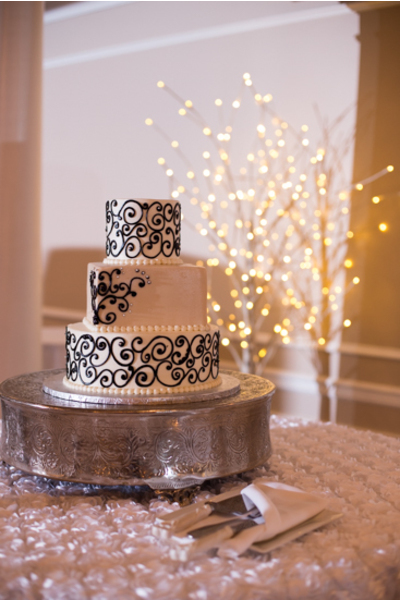 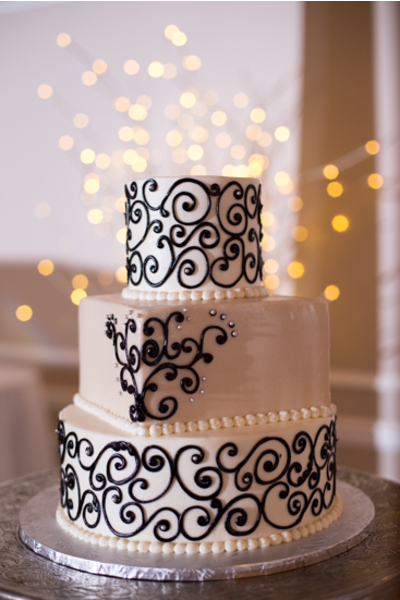 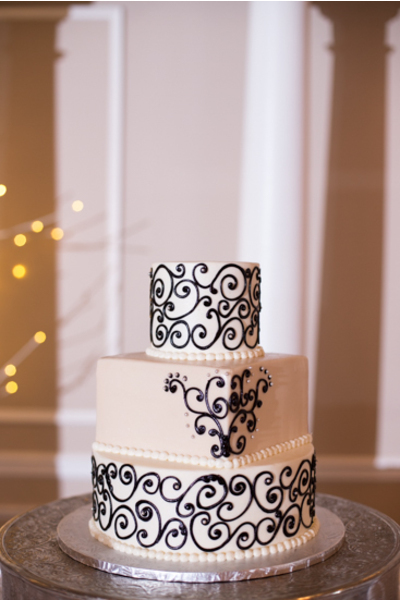 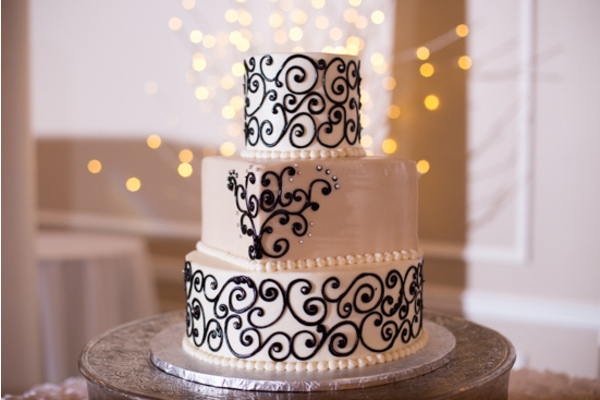 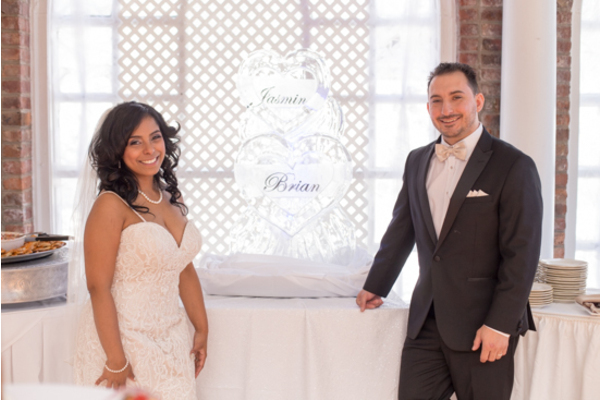 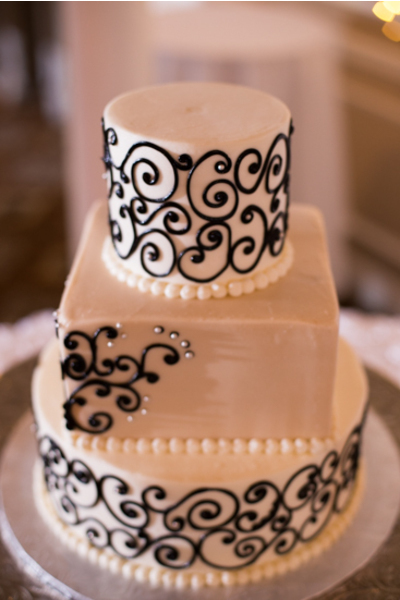 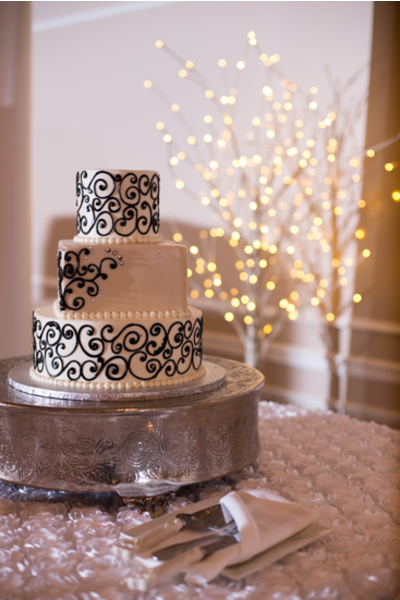 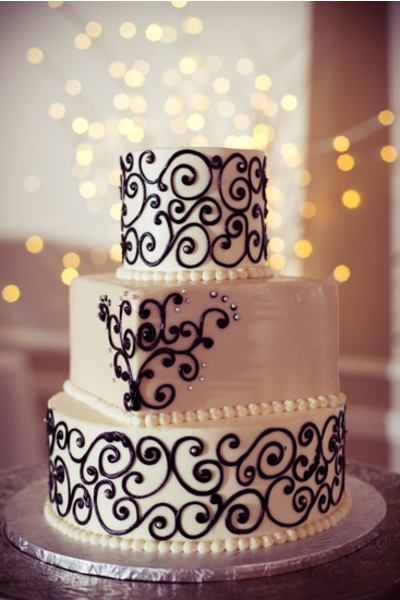 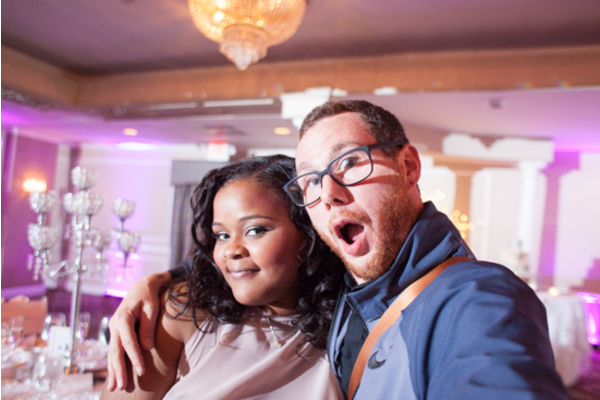 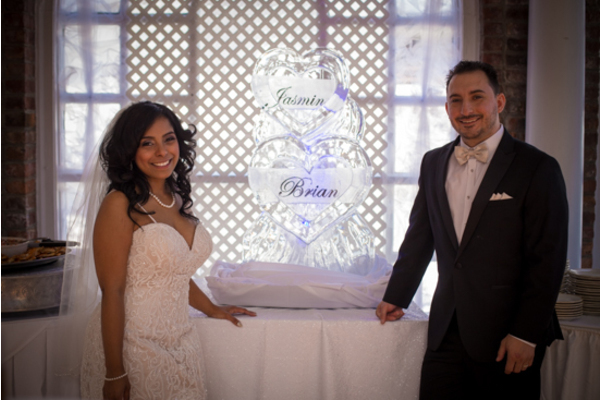 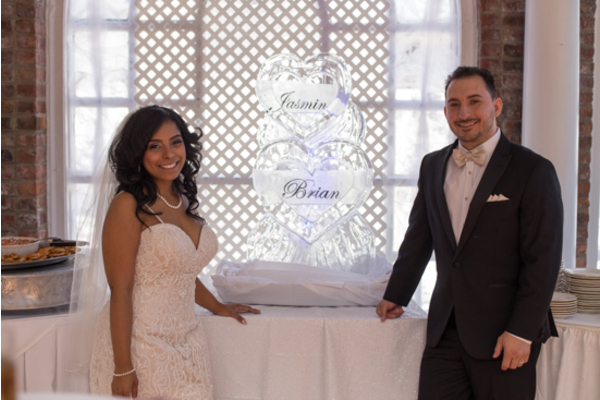 Congratulations to Jasmine and Brian on their recent marriage! 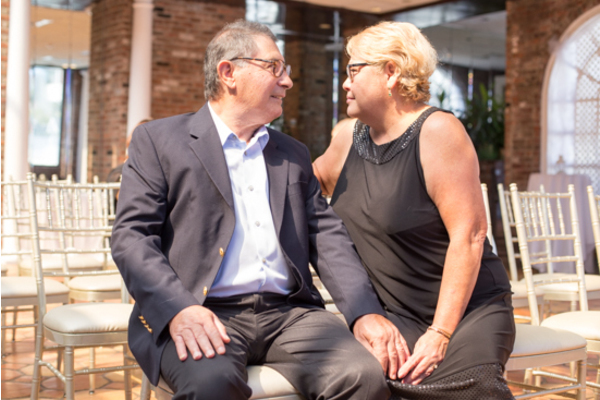 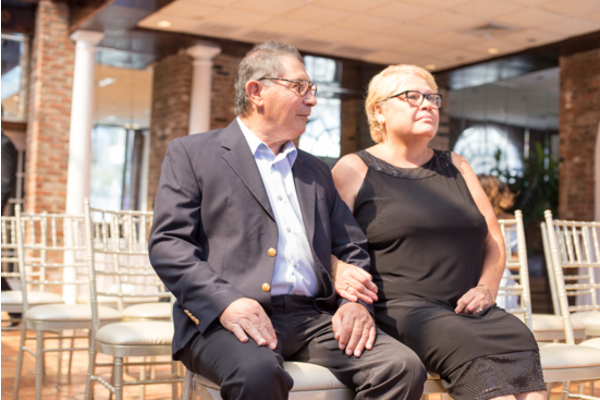 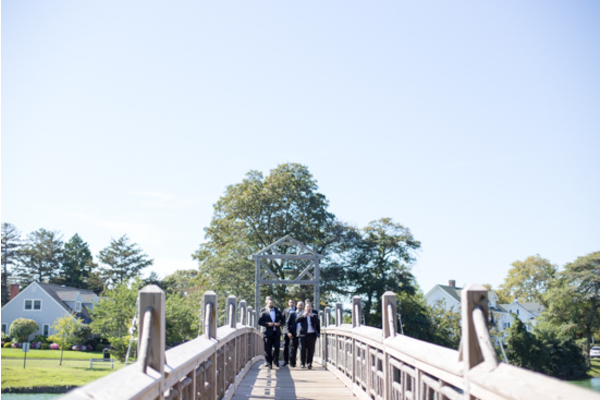 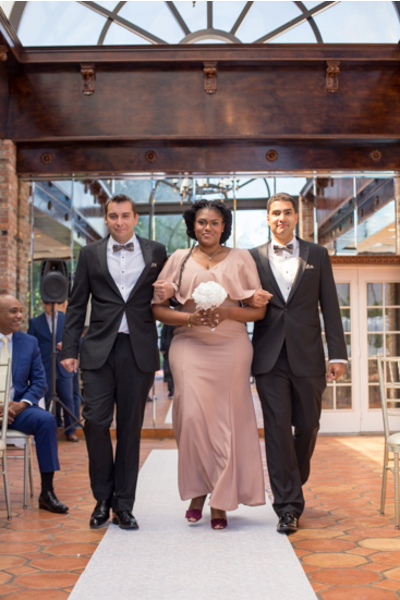 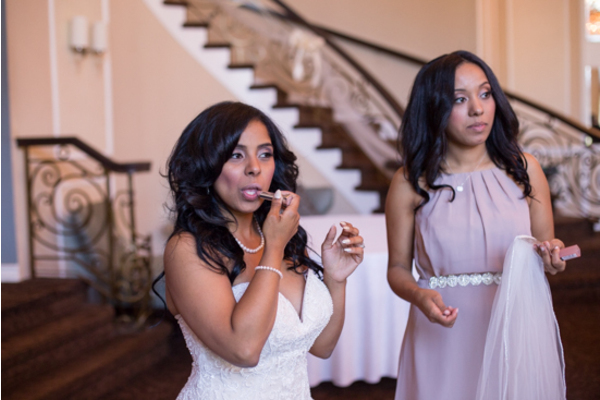 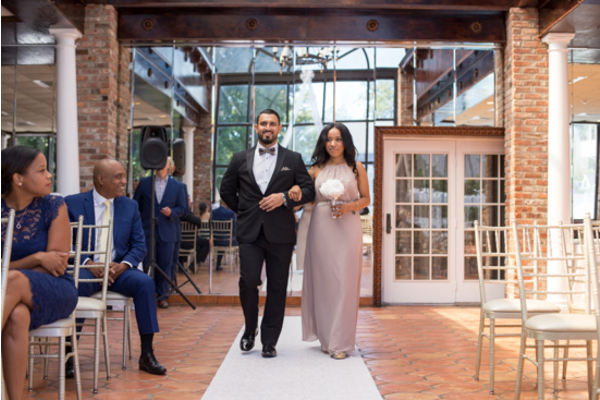 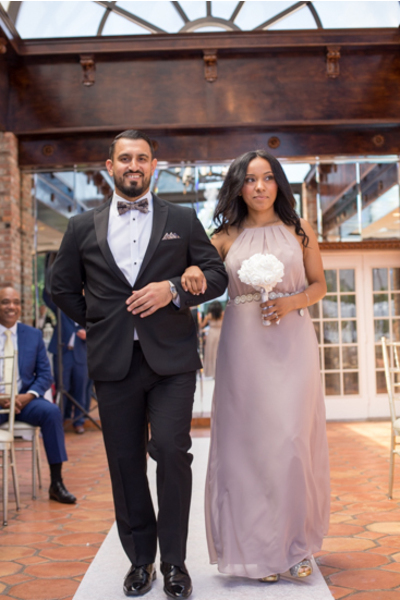 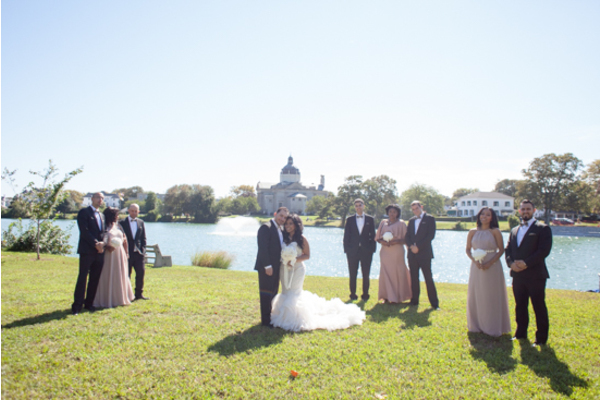 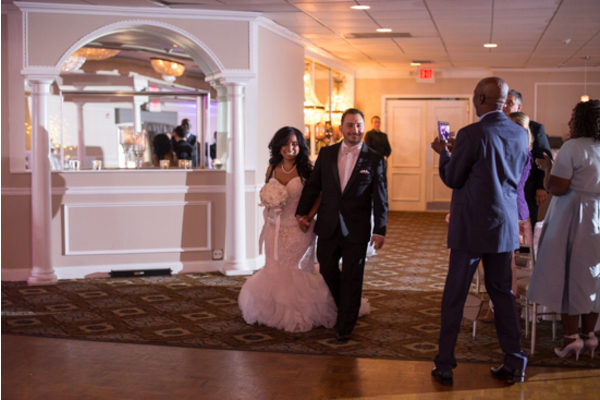 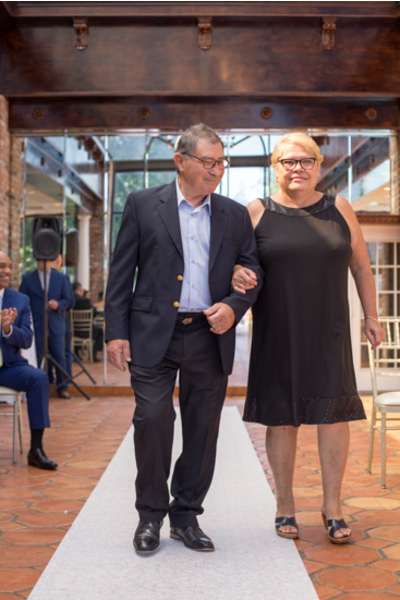 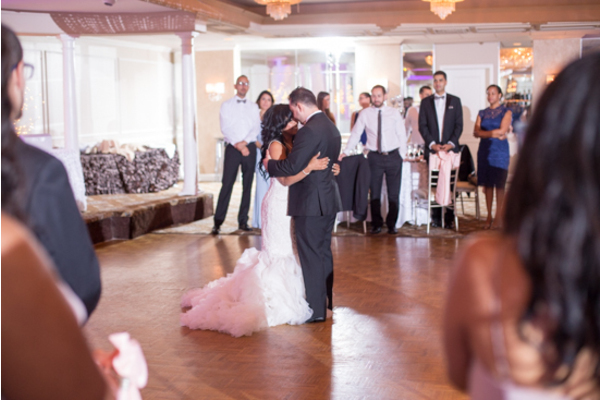 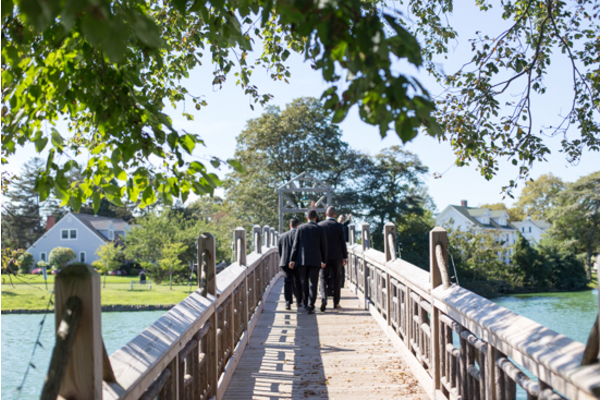 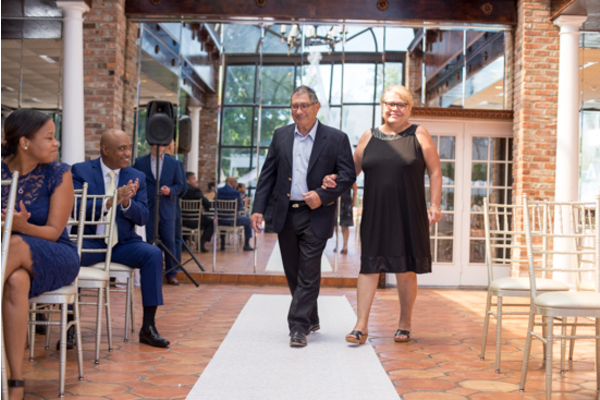 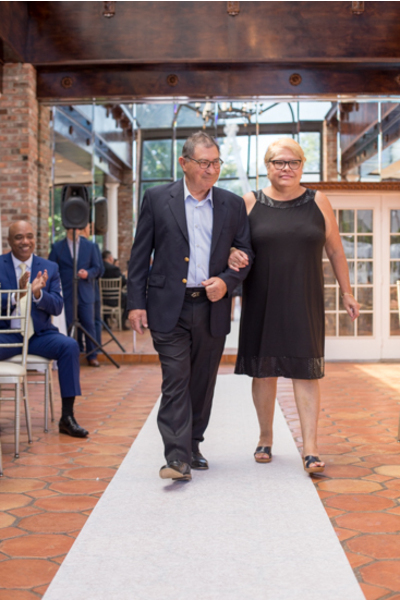 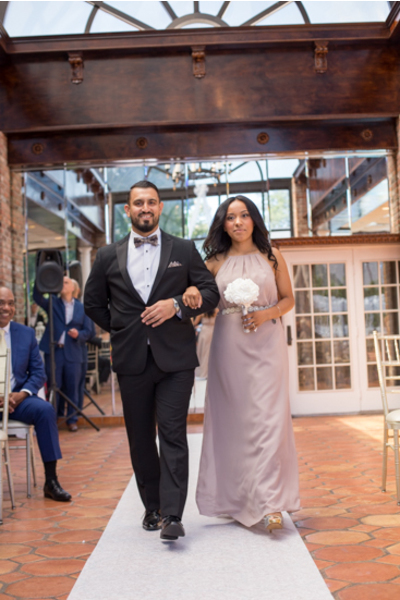 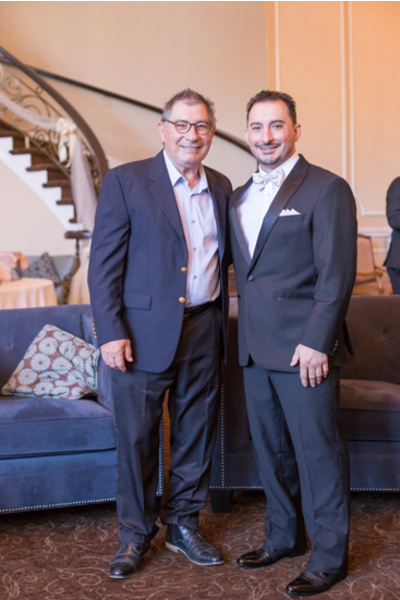 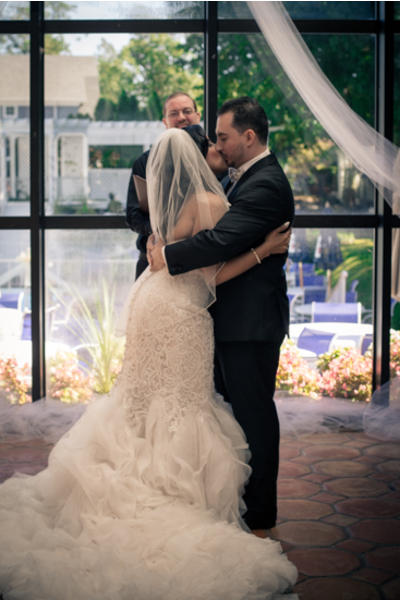 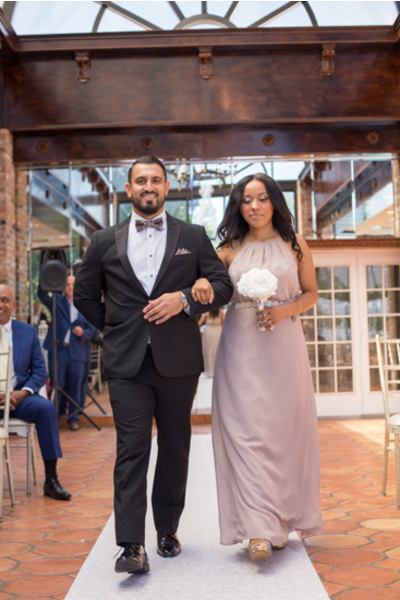 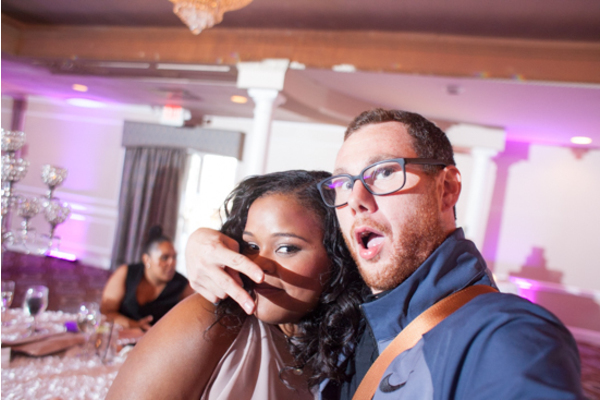 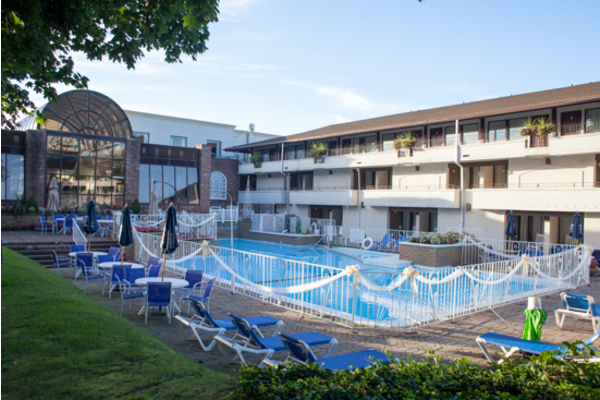 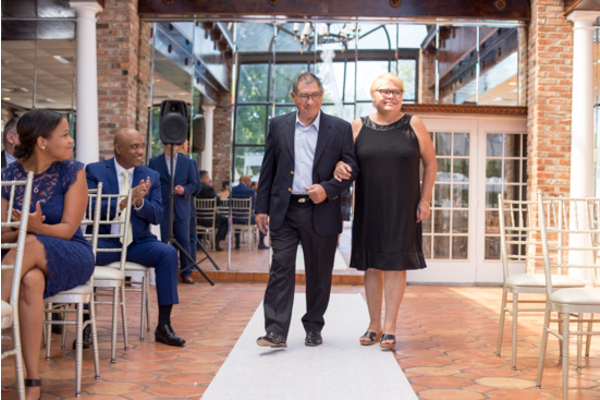 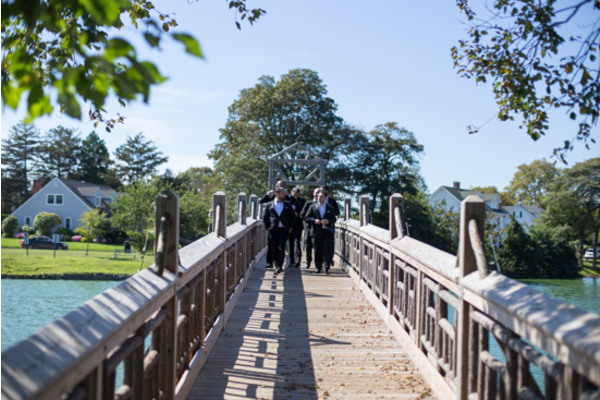 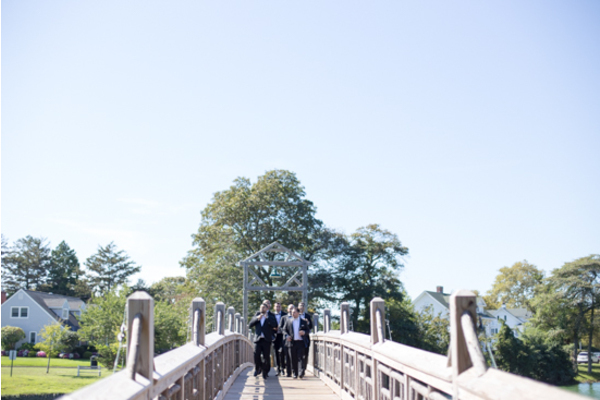 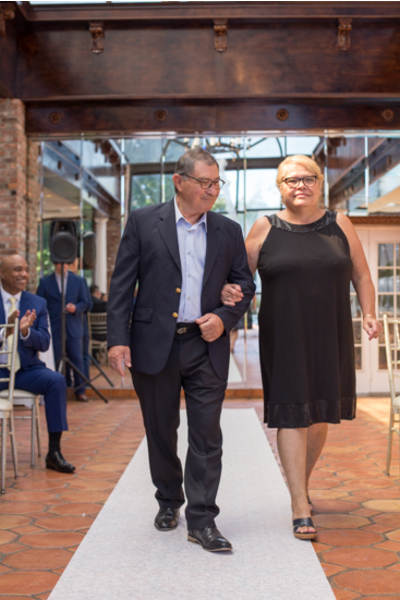 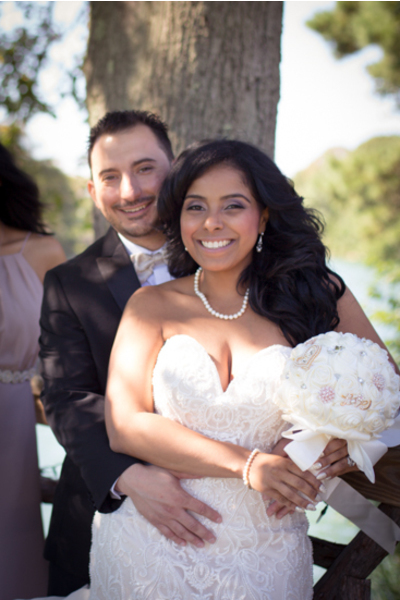 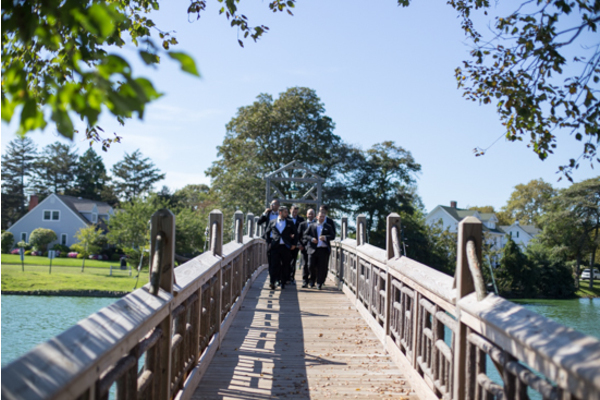 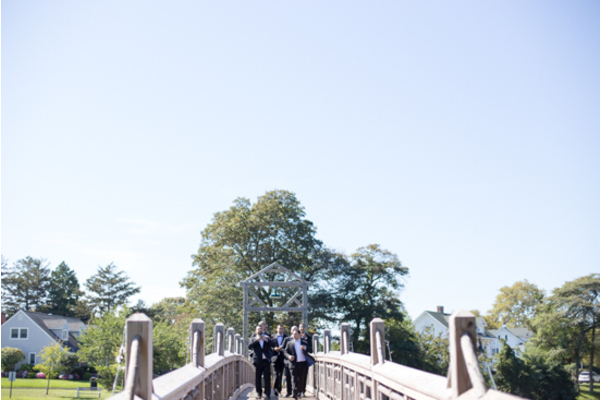 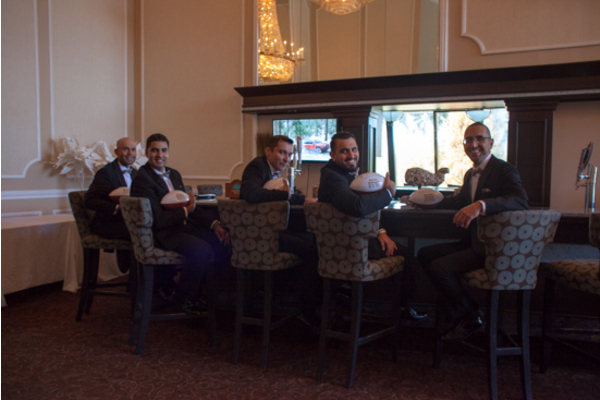 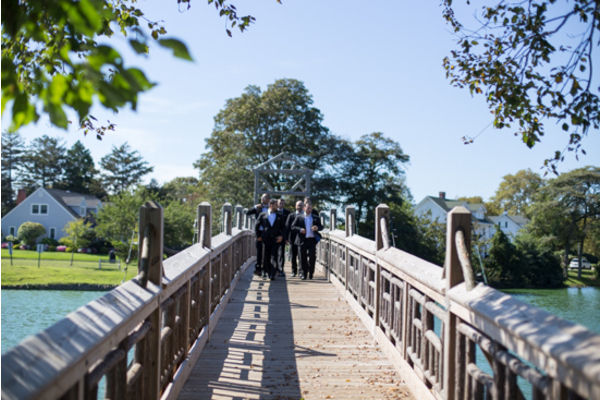 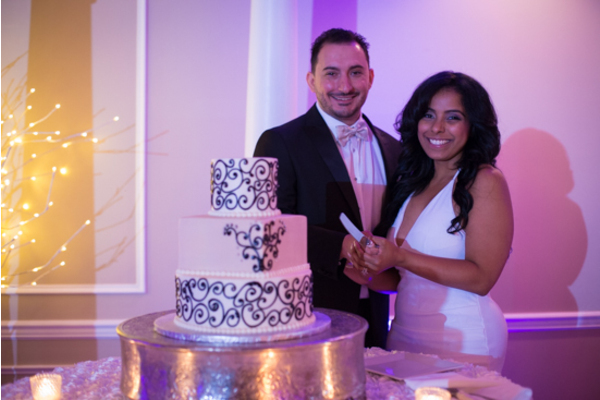 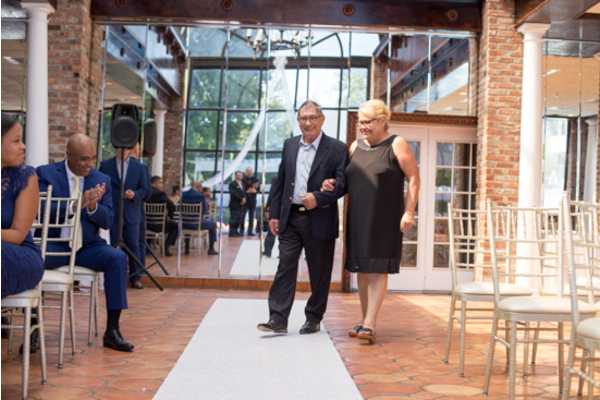 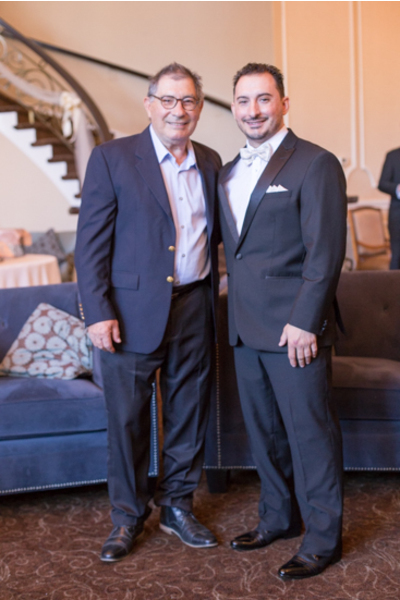 These two tied the knot this September at Doolan’s Shore Club in Spring Lake, NJ. 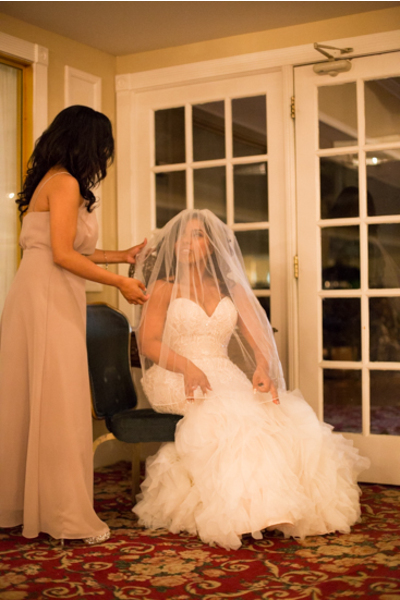 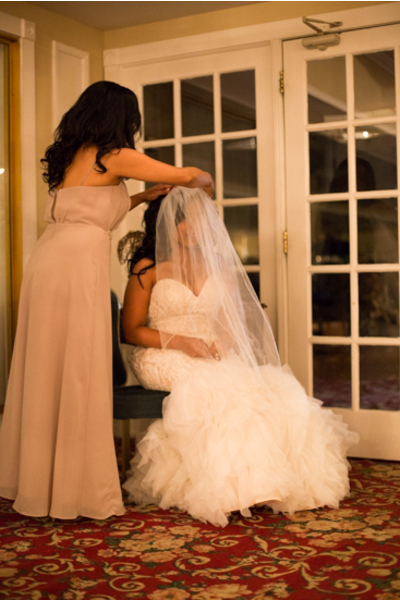 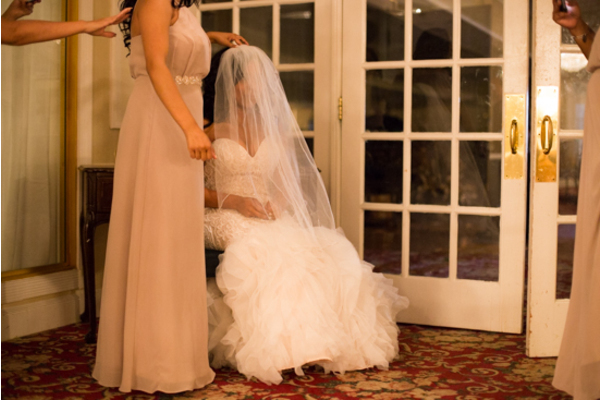 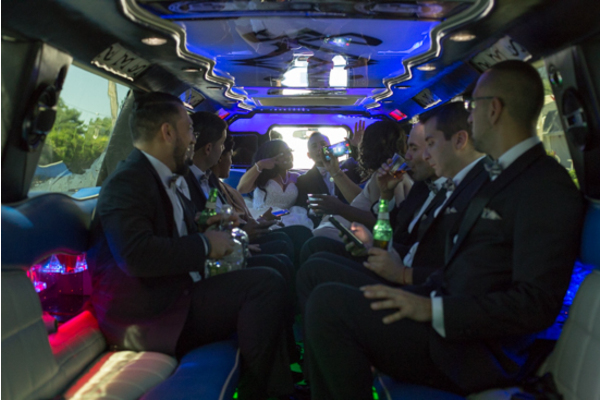 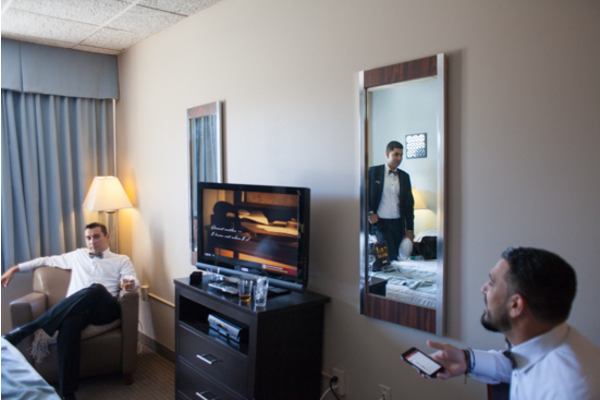 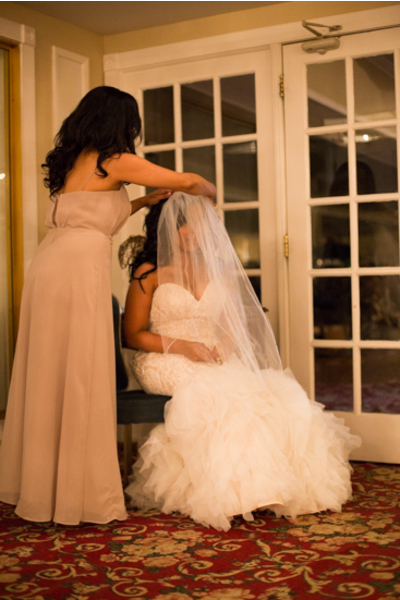 During the early hours of the day, the bride was pampered for the special occasion! 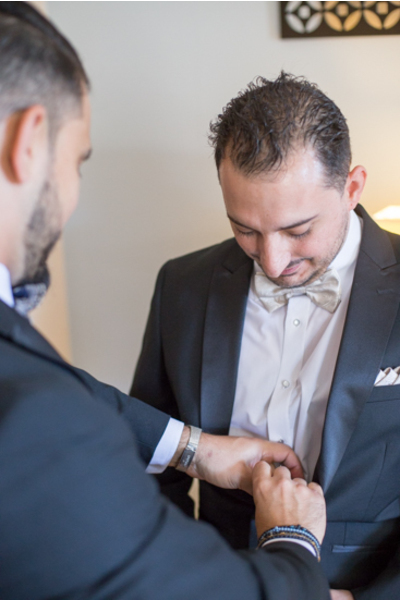 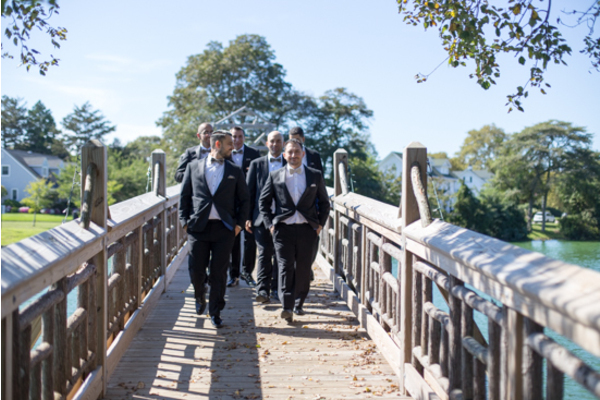 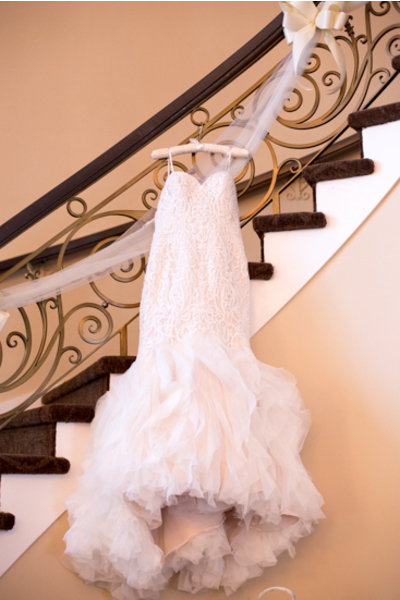 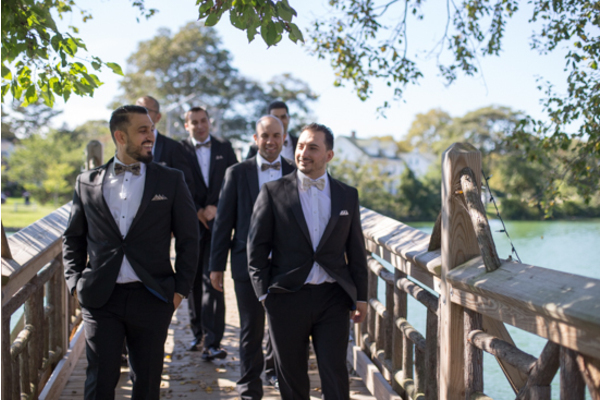 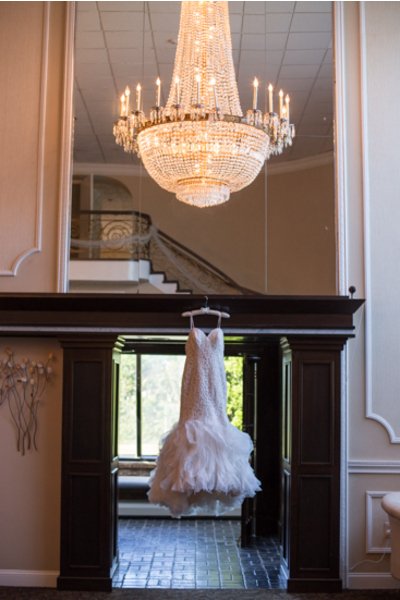 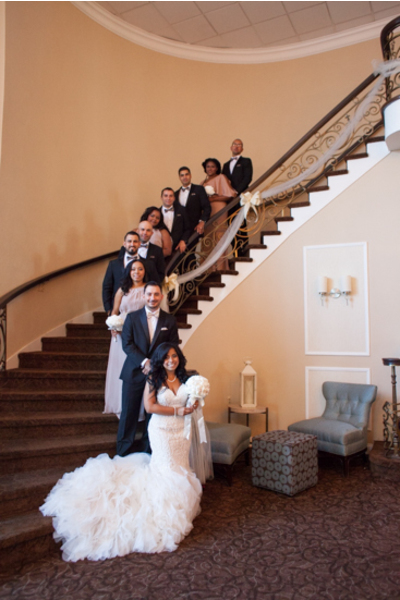 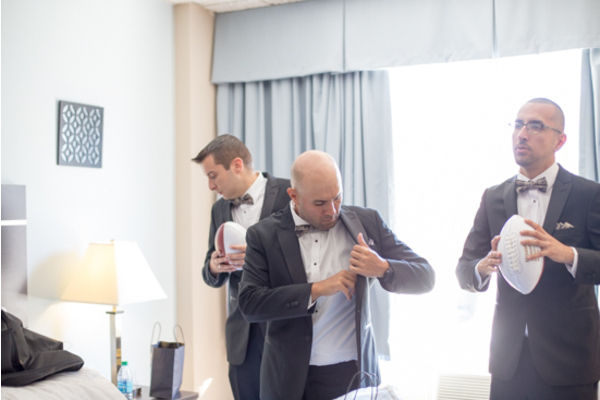 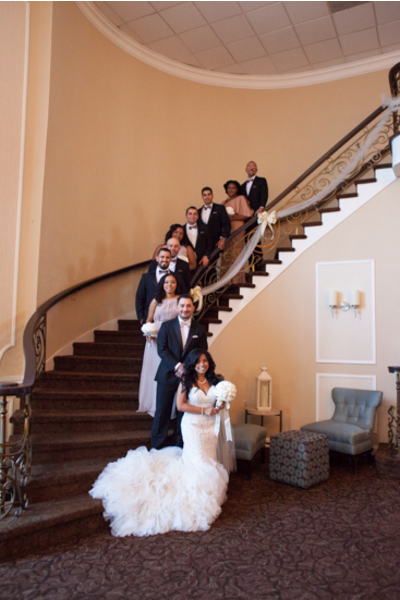 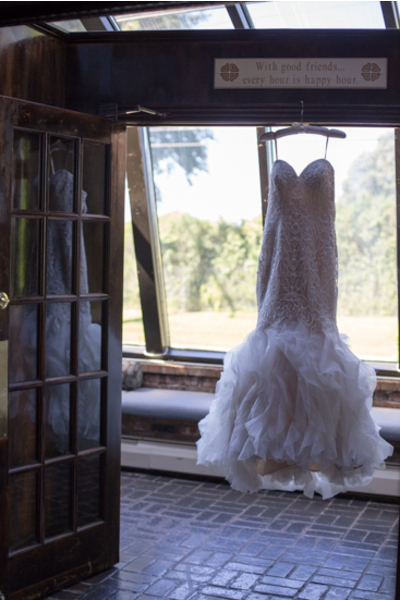 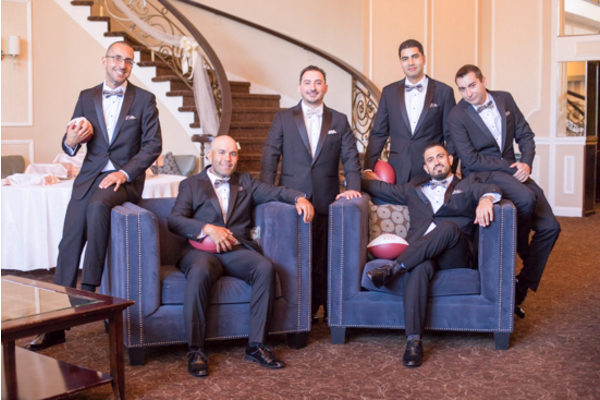 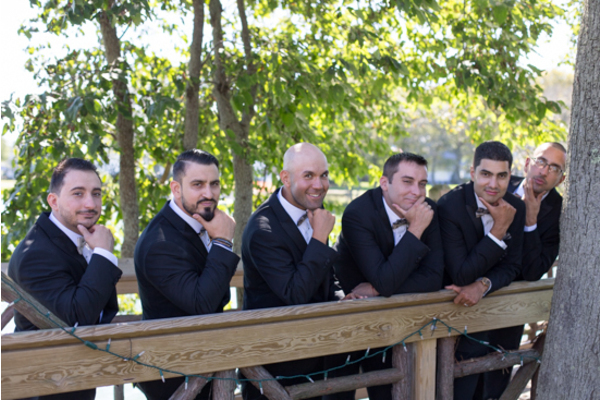 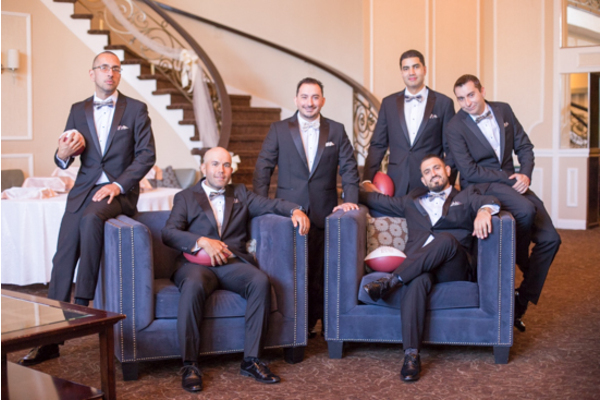 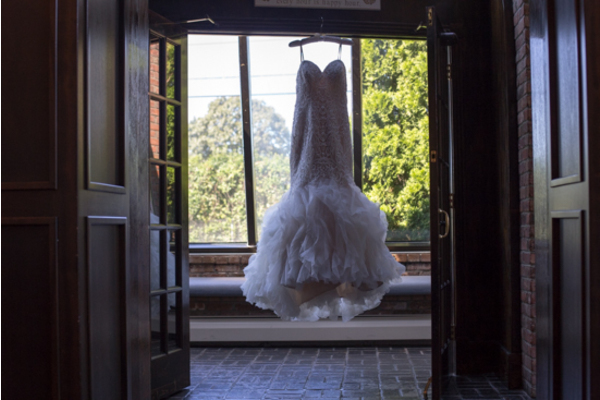 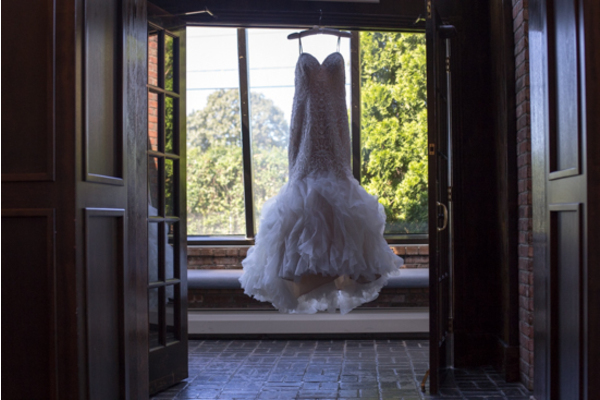 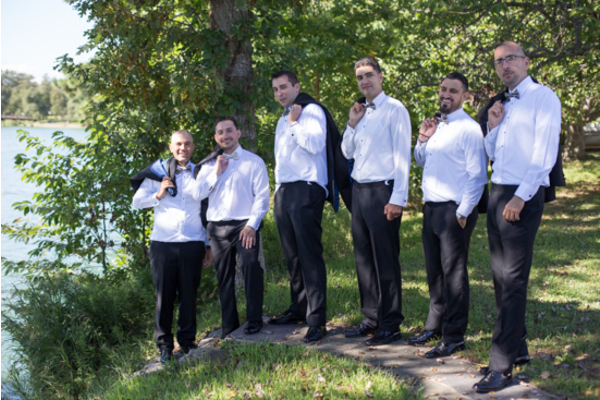 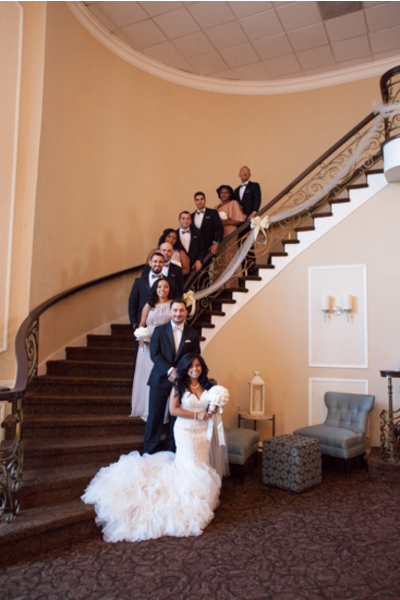 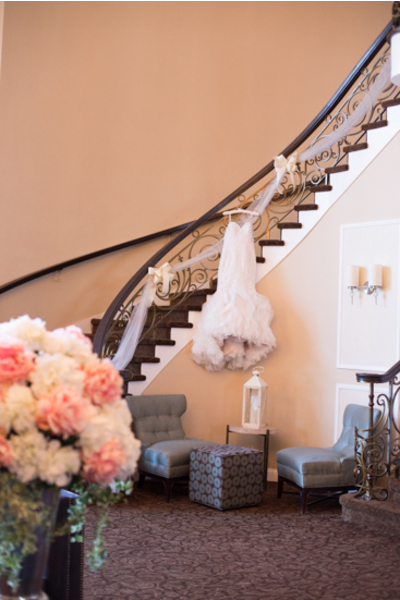 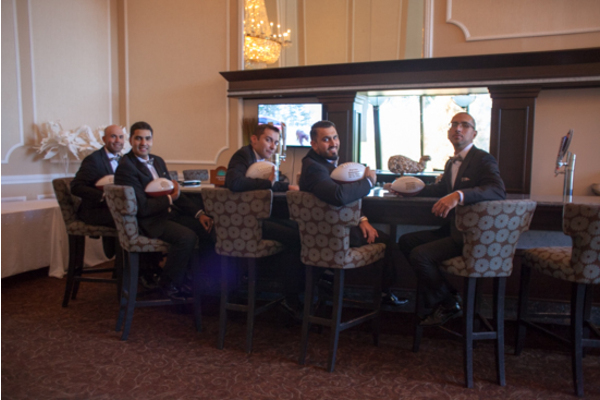 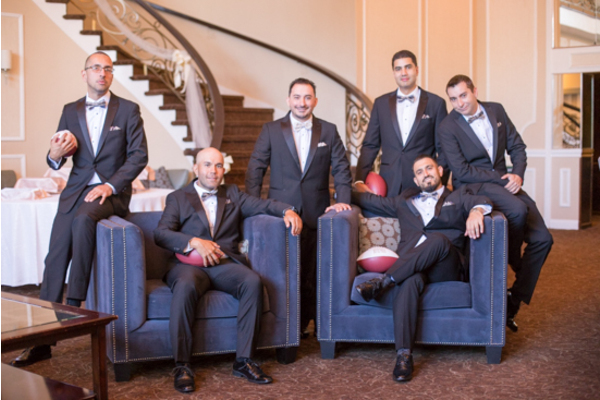 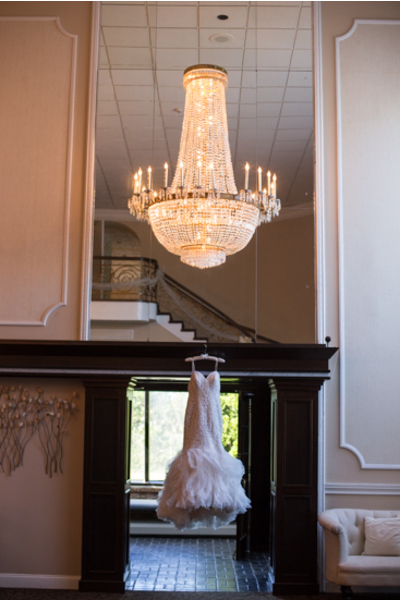 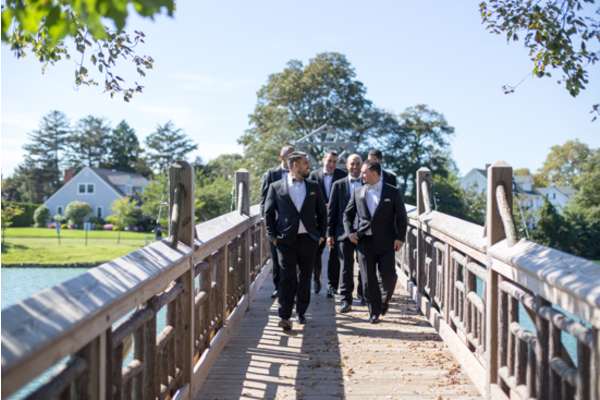 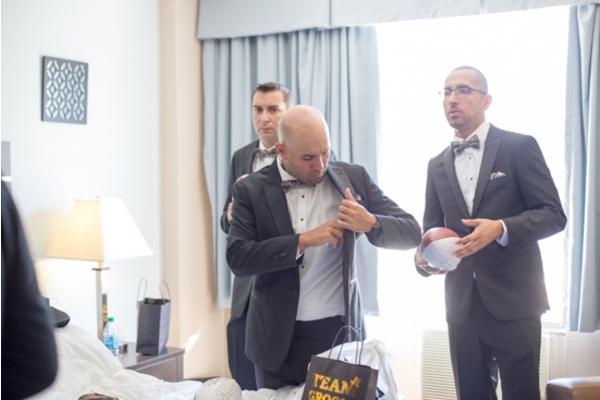 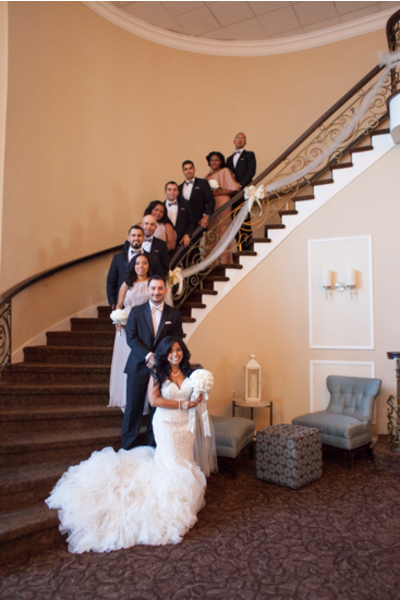 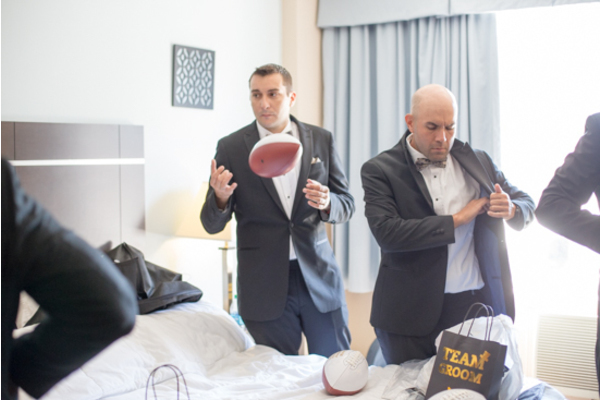 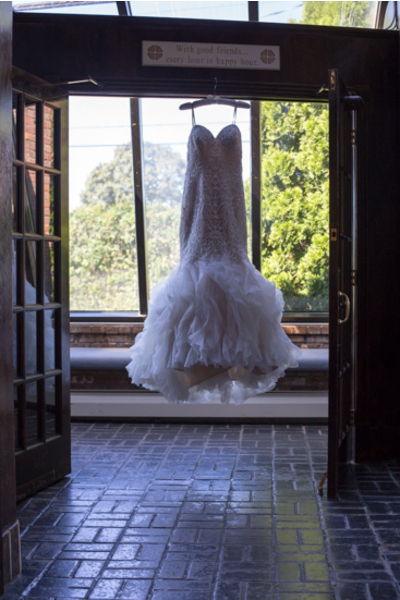 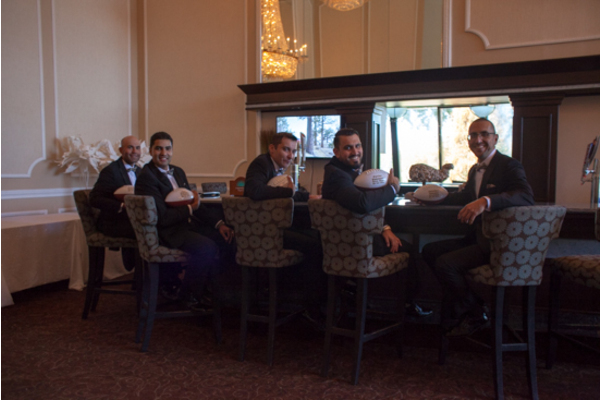 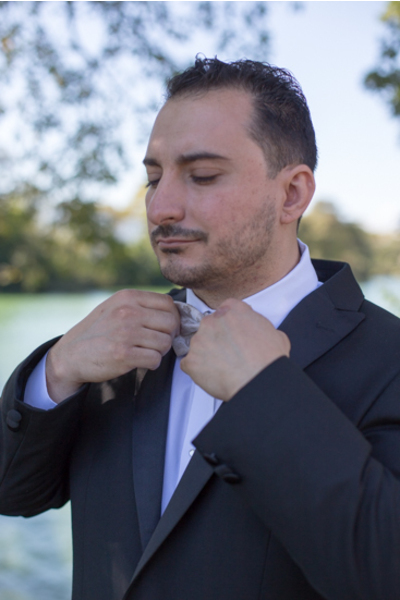 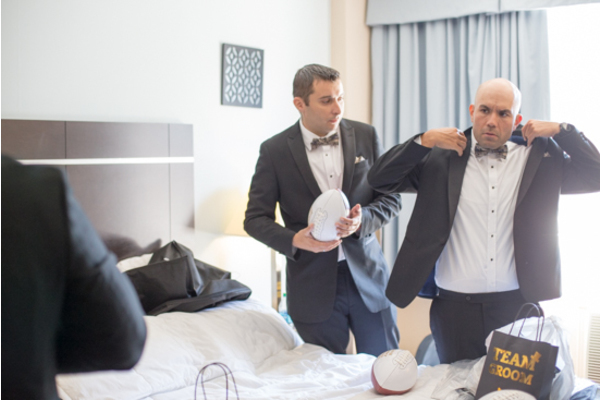 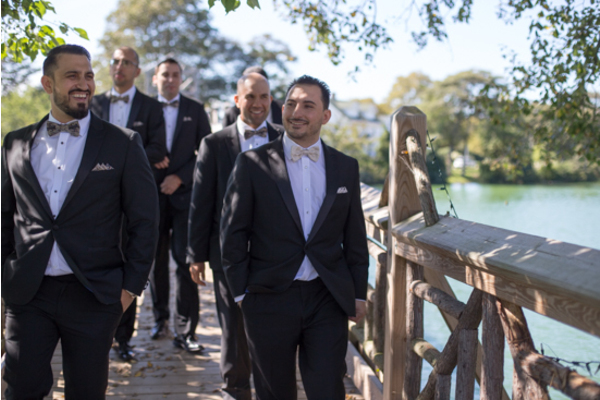 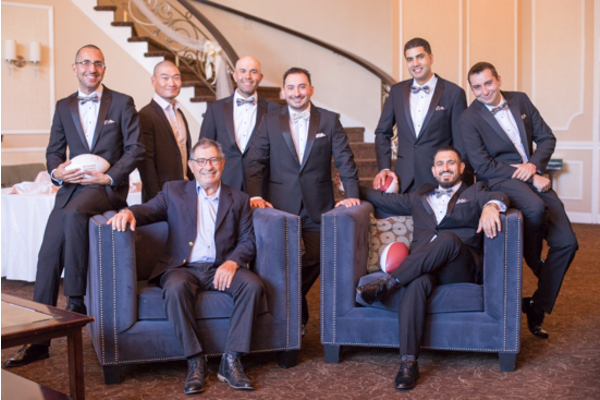 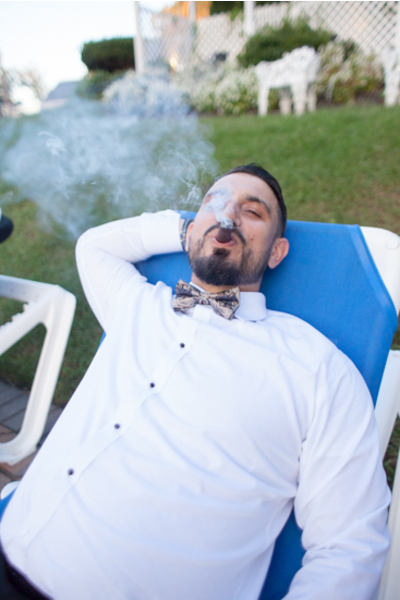 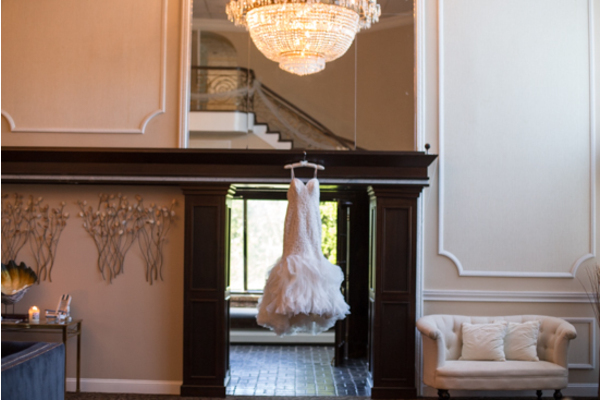 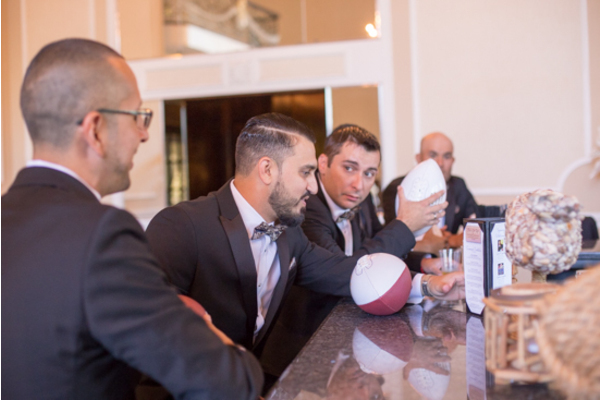 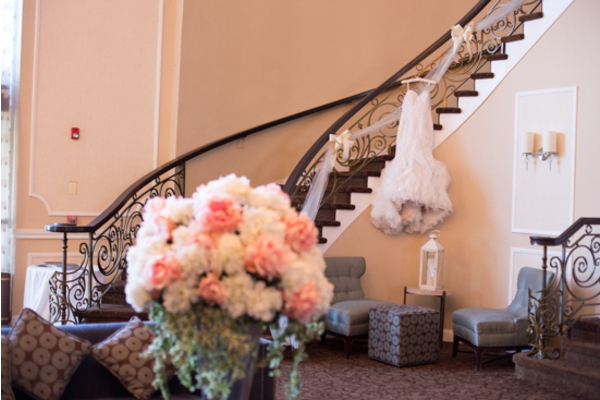 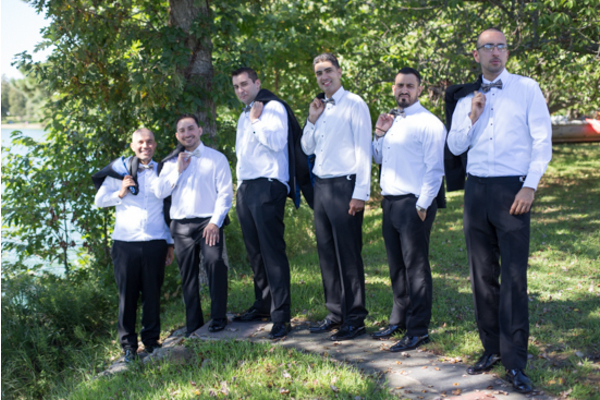 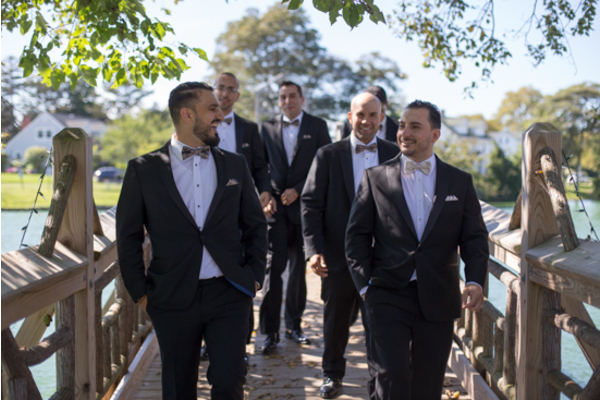 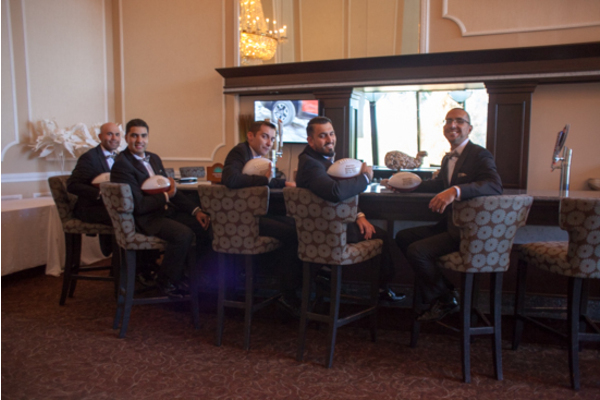 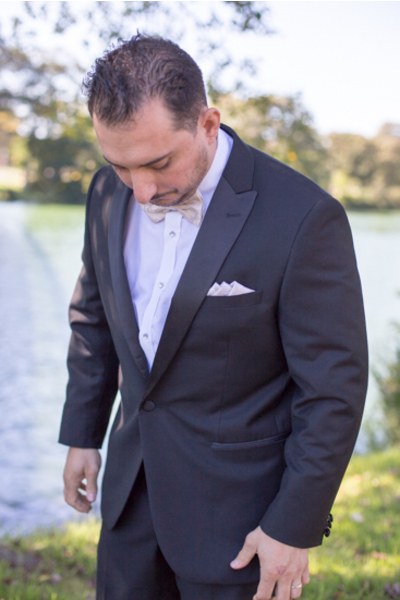 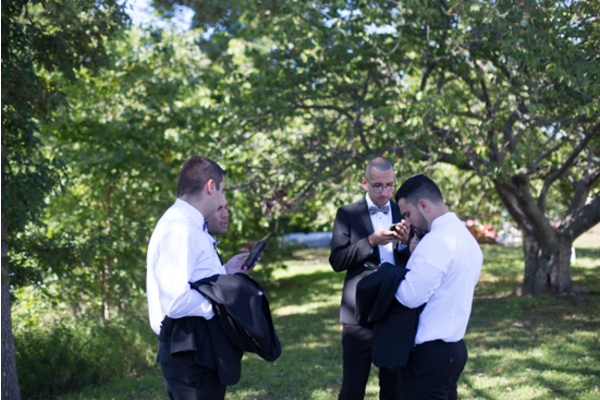 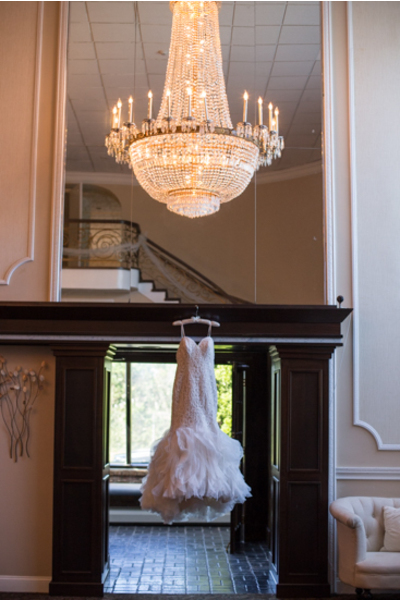 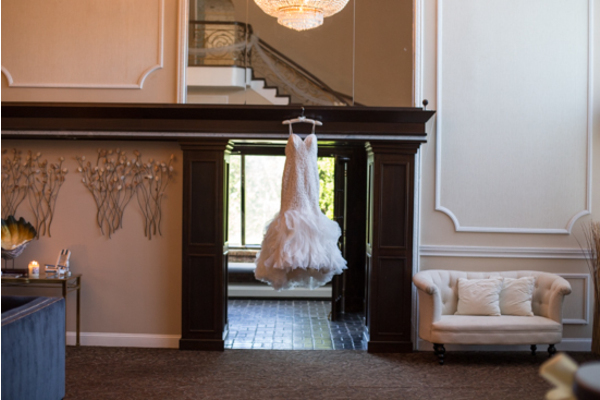 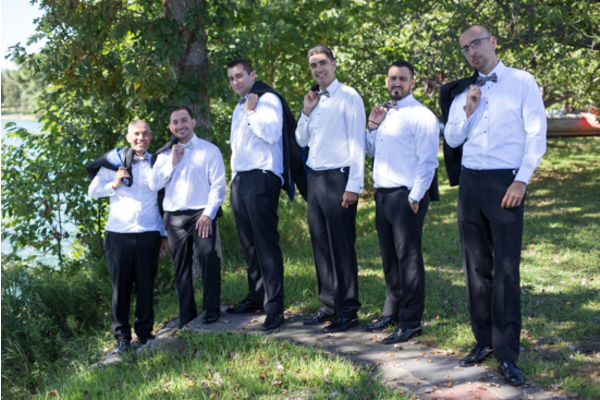 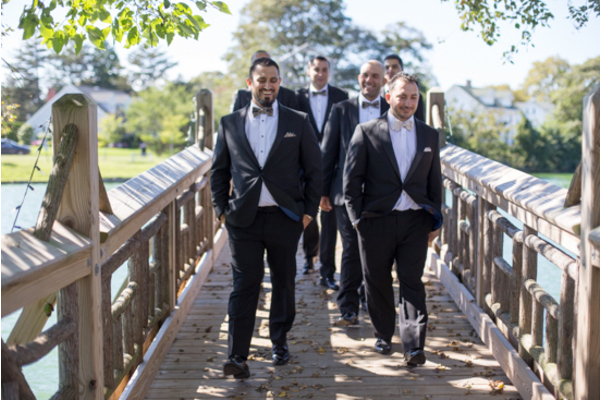 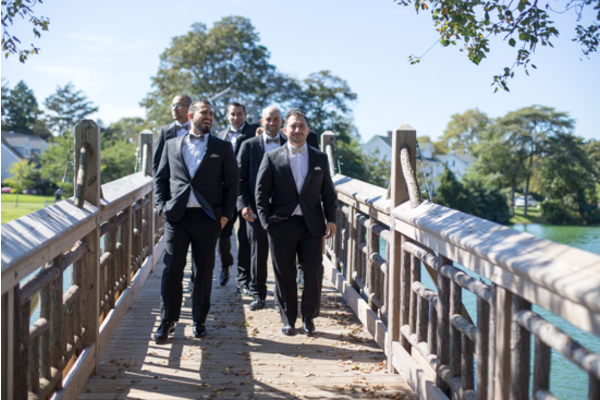 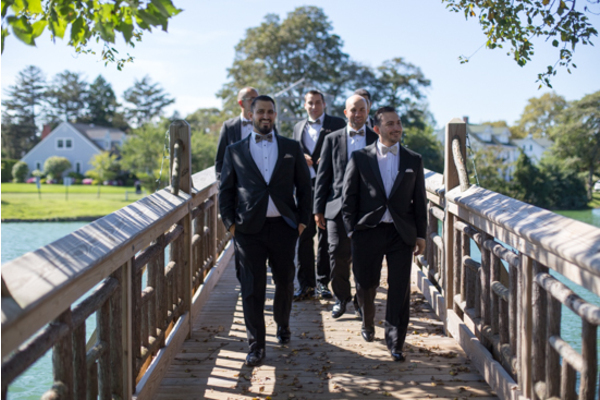 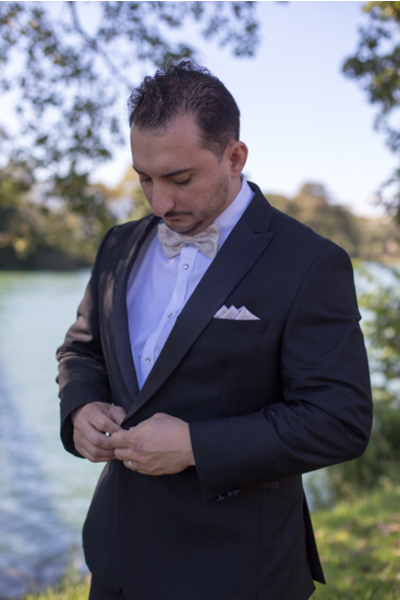 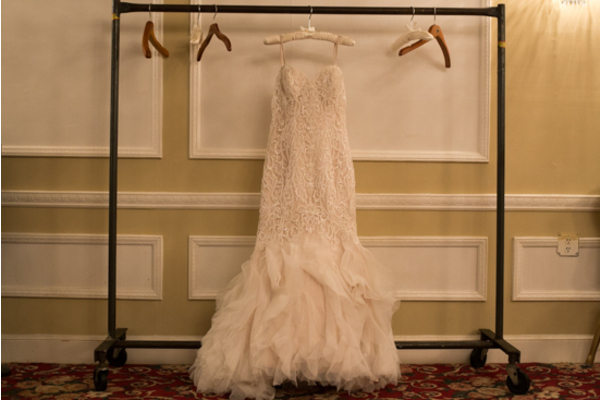 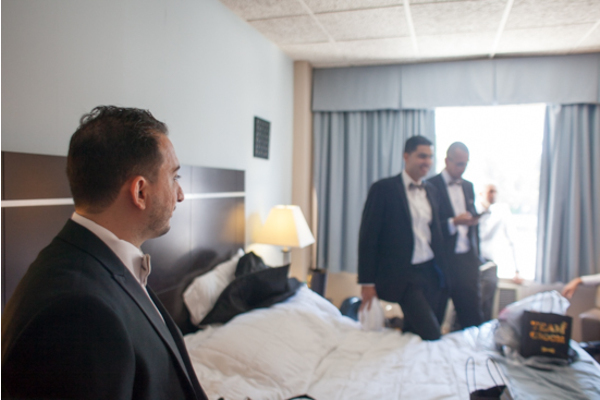 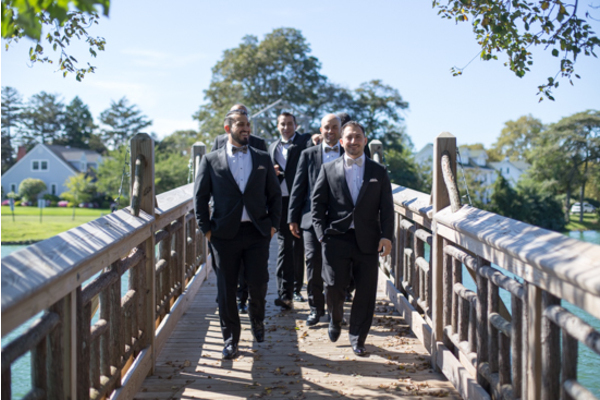 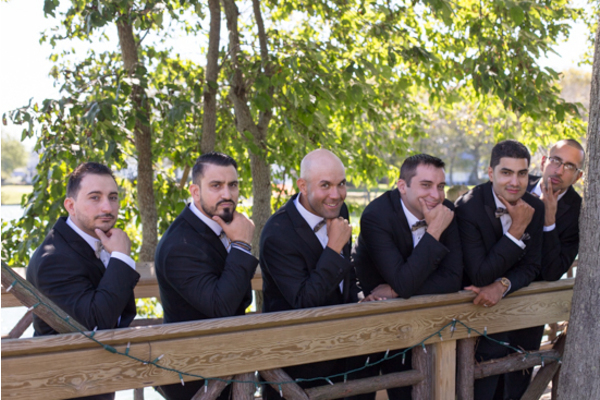 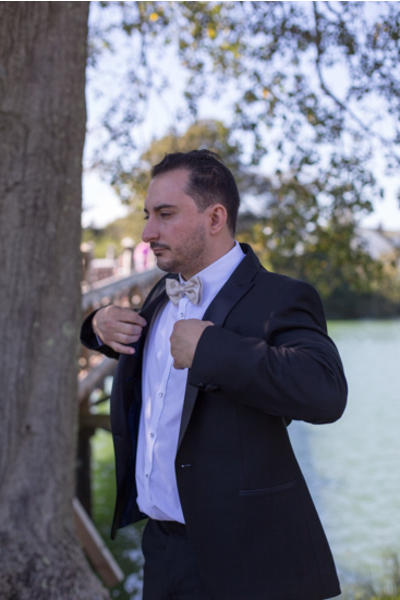 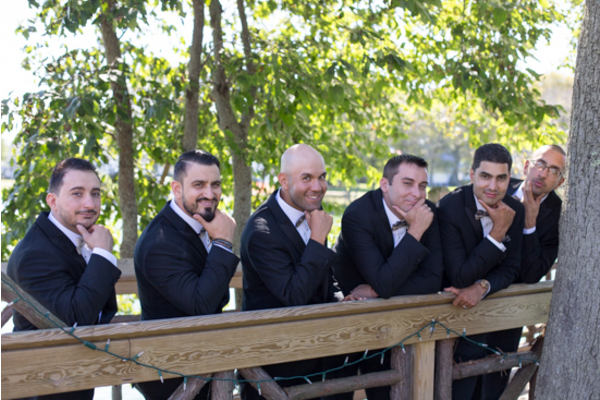 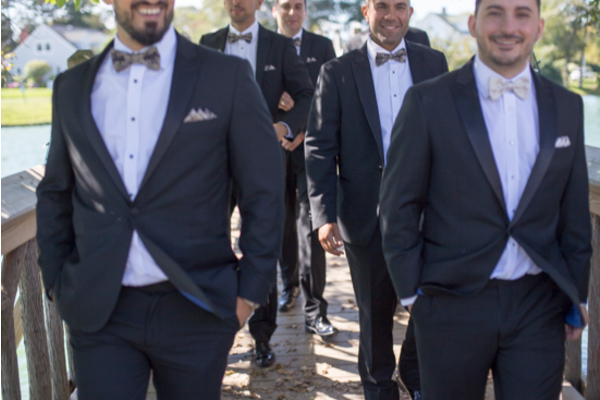 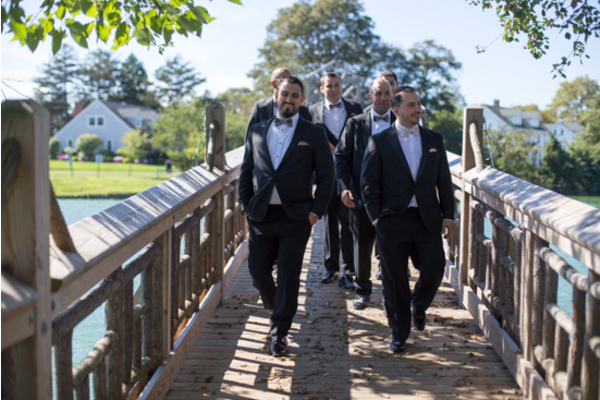 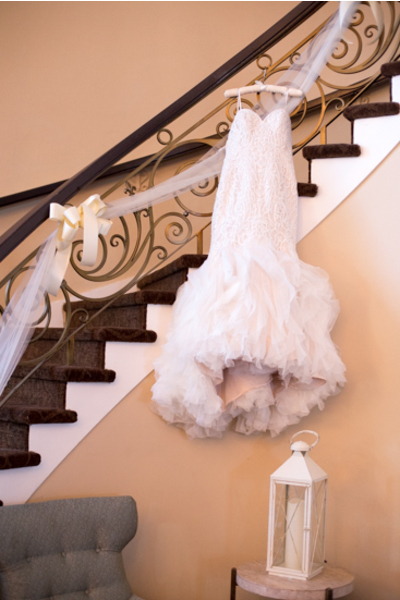 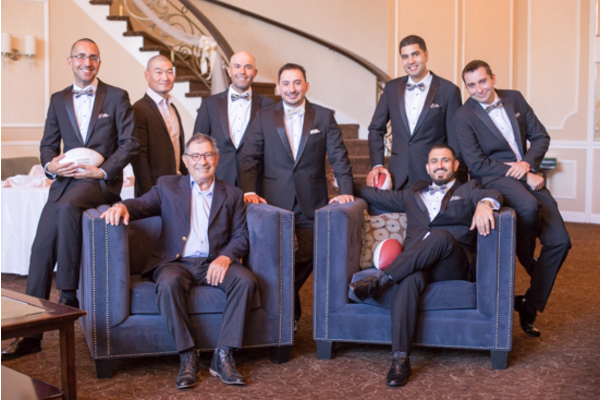 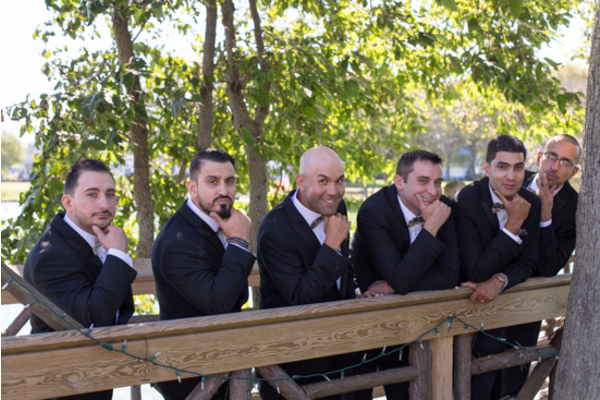 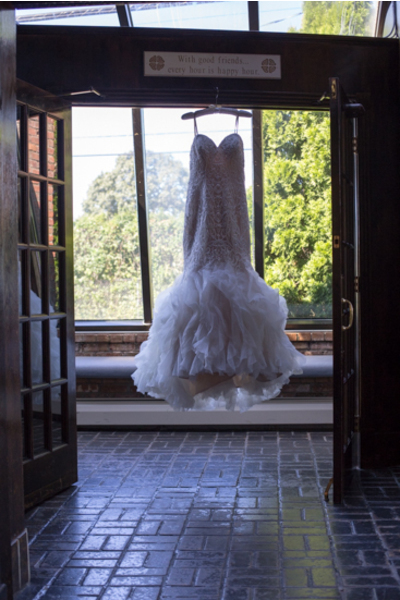 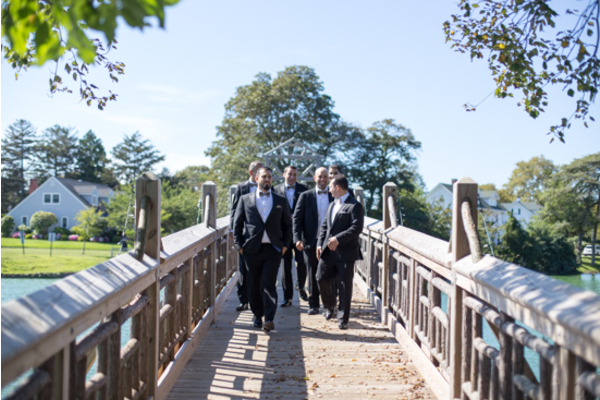 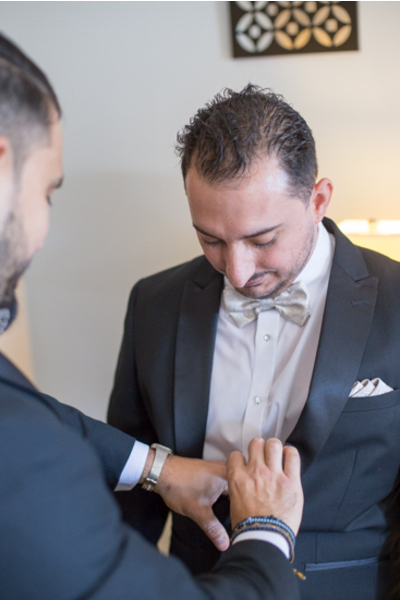 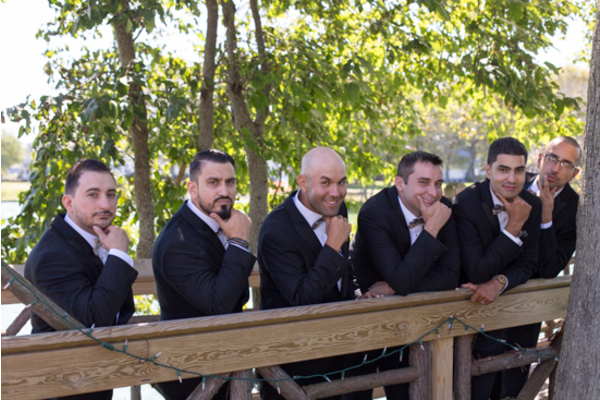 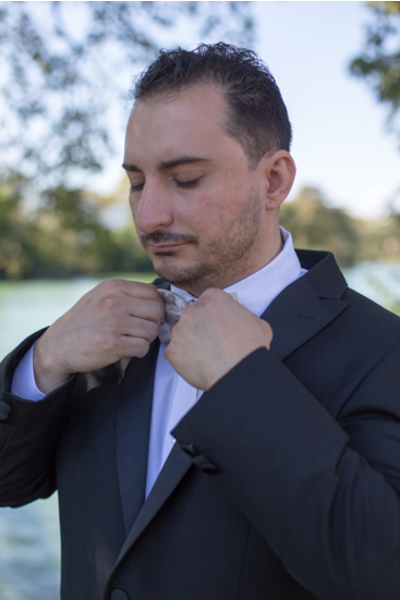 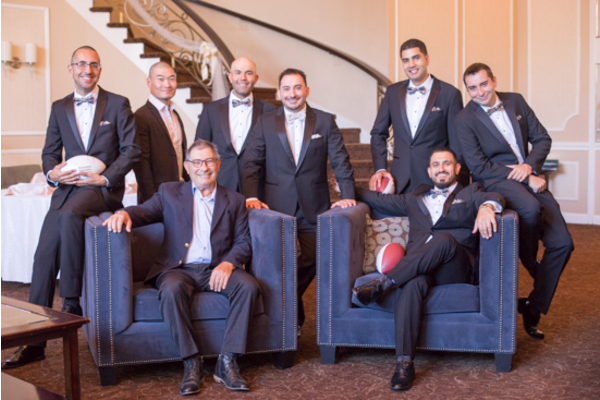 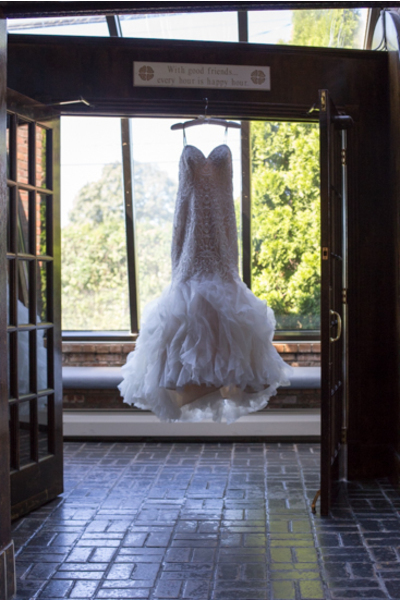 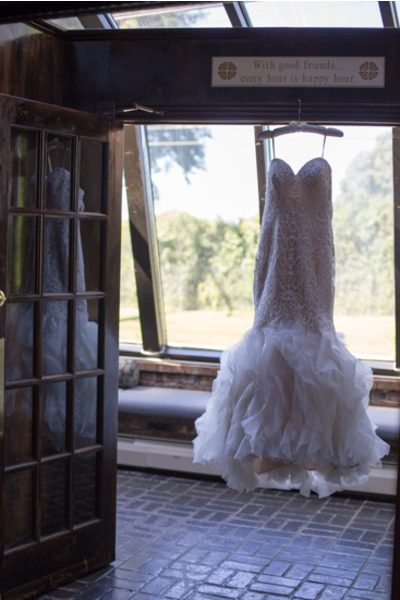 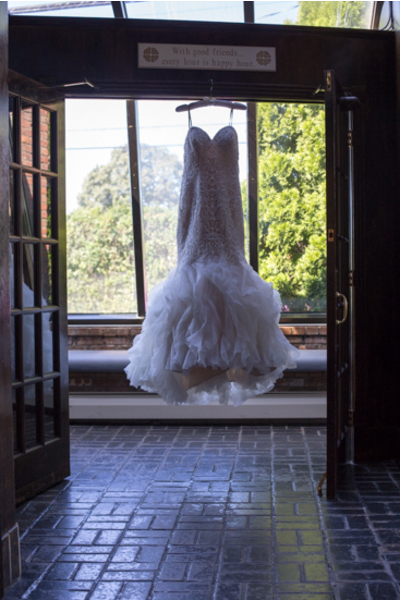 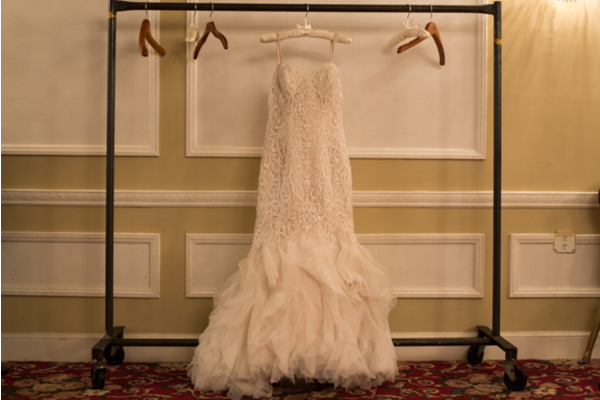 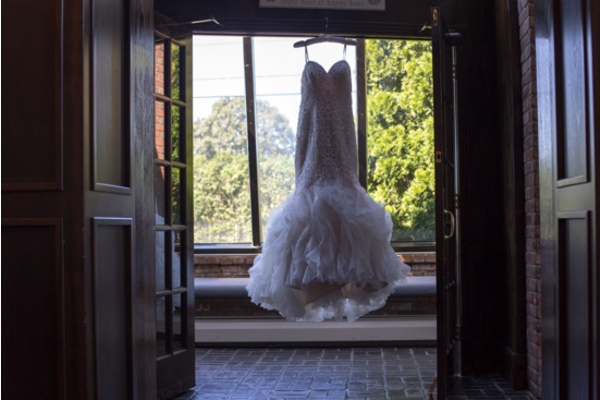 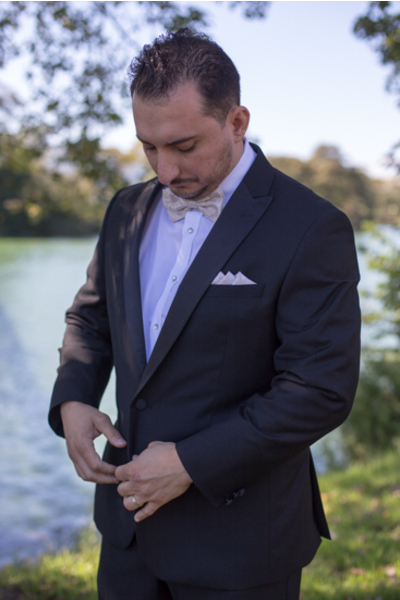 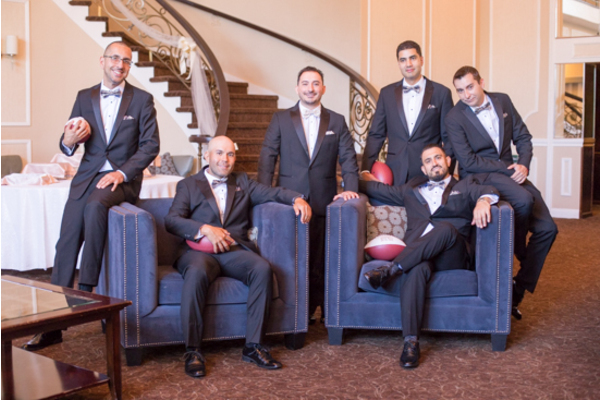 Our NJ Wedding Photographer took photos of her dream gown hanging on the grand staircase as Brian was close by, getting ready with his groomsmen. 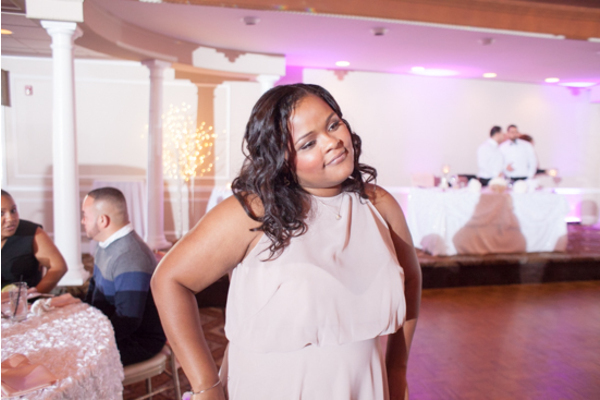 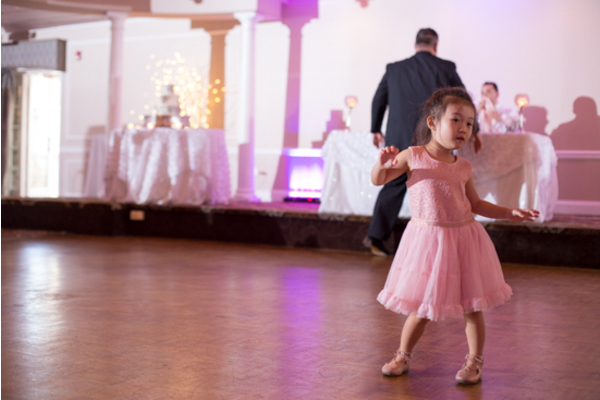 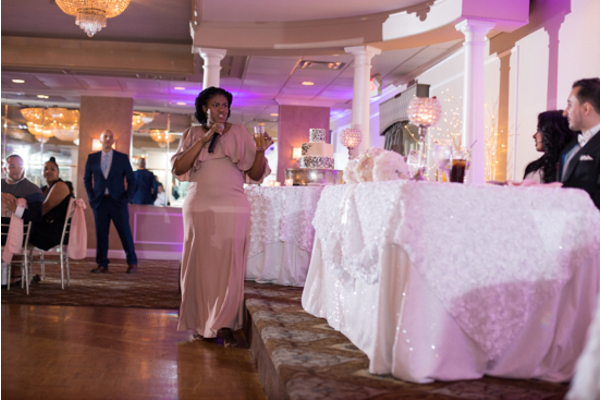 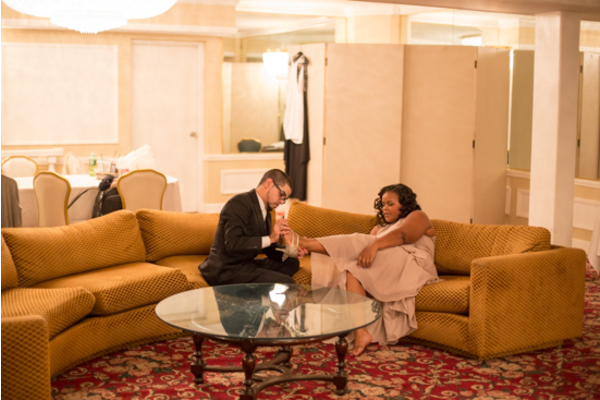 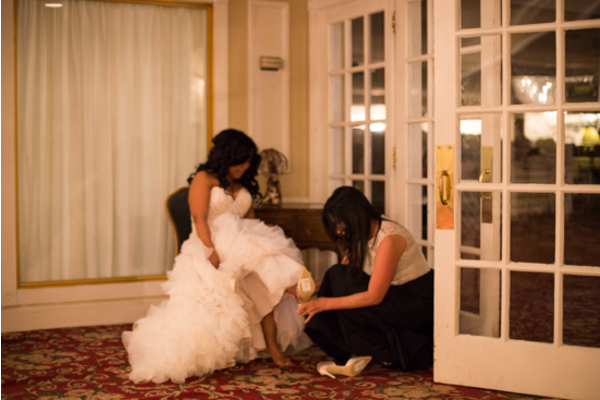 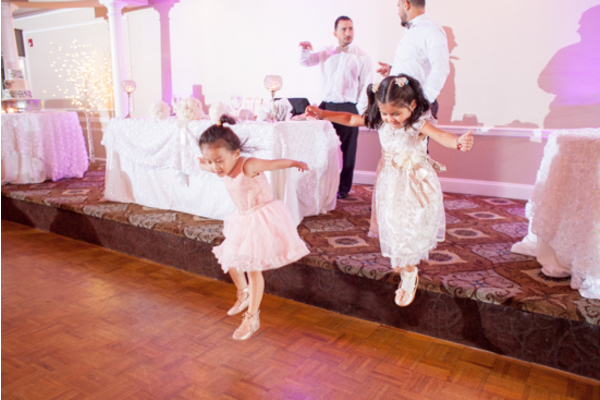 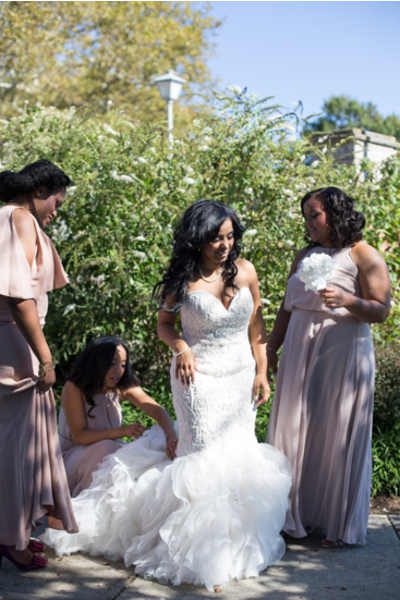 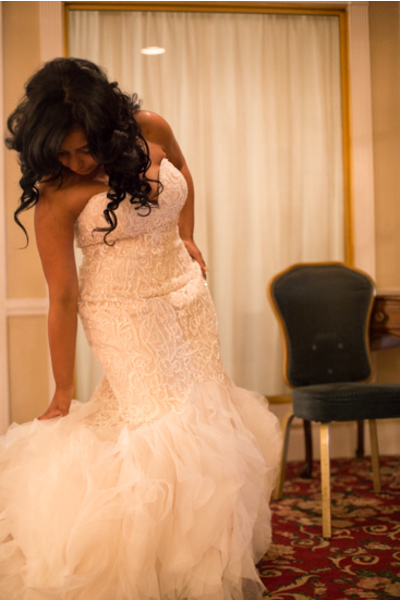 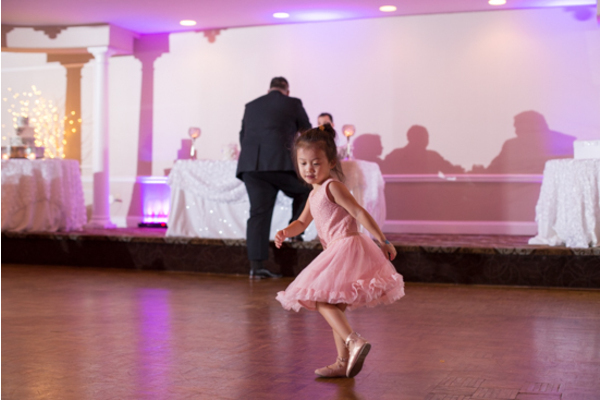 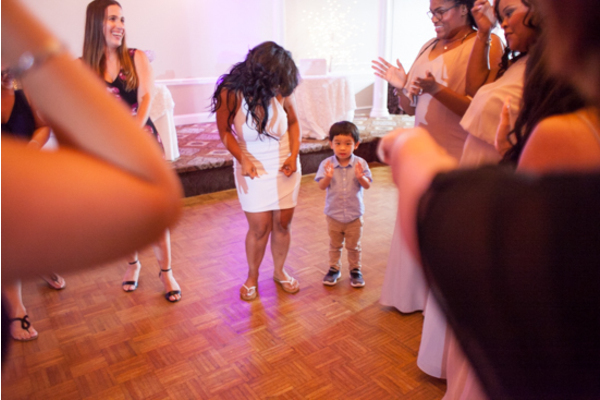 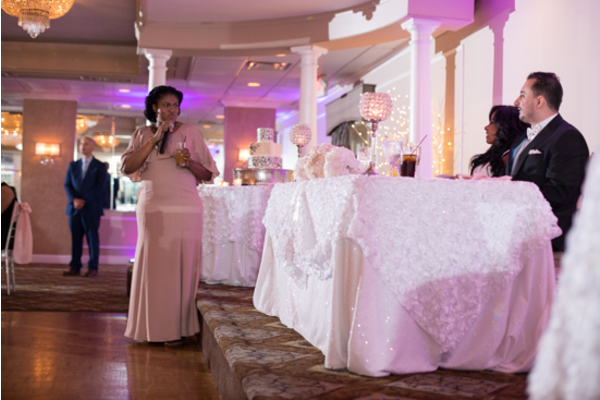 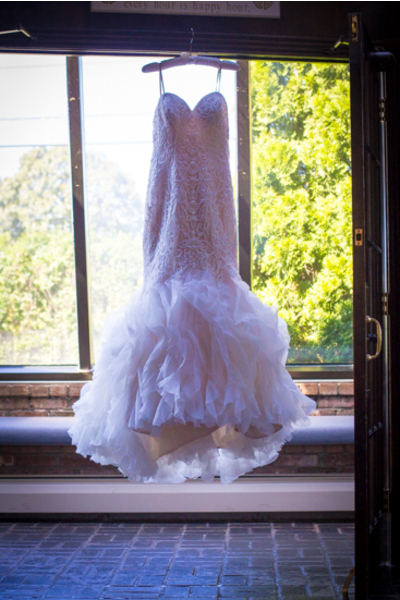 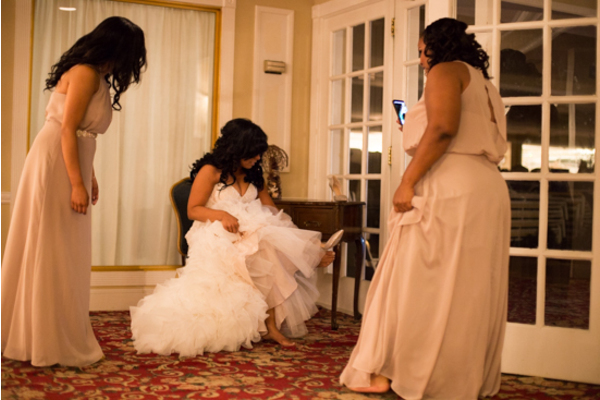 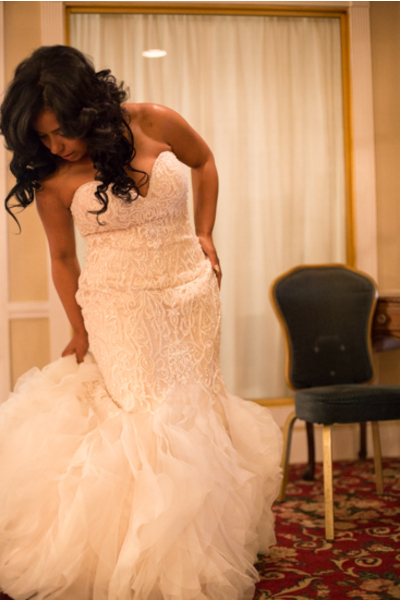 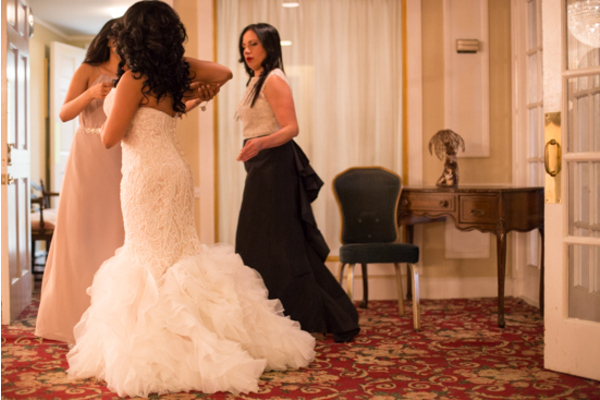 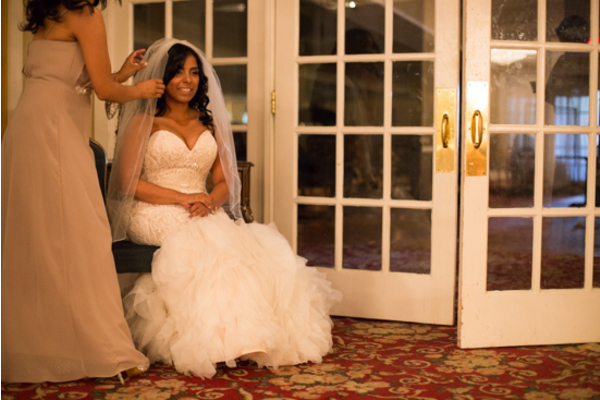 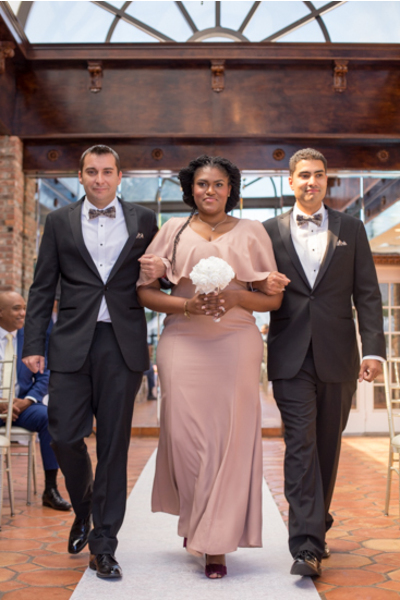 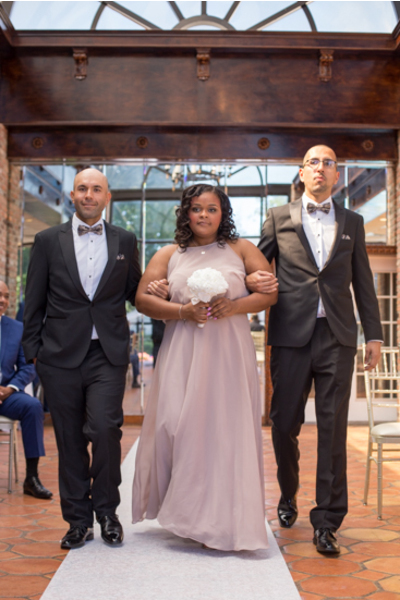 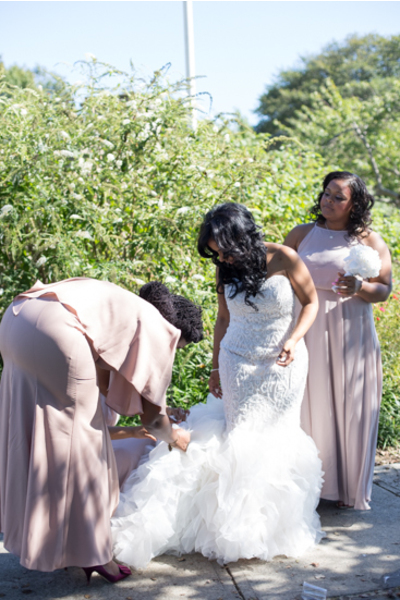 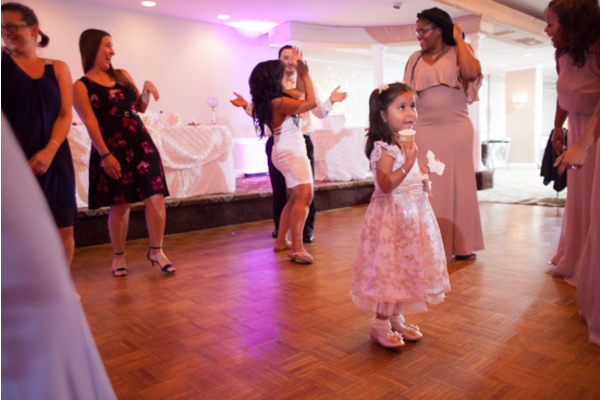 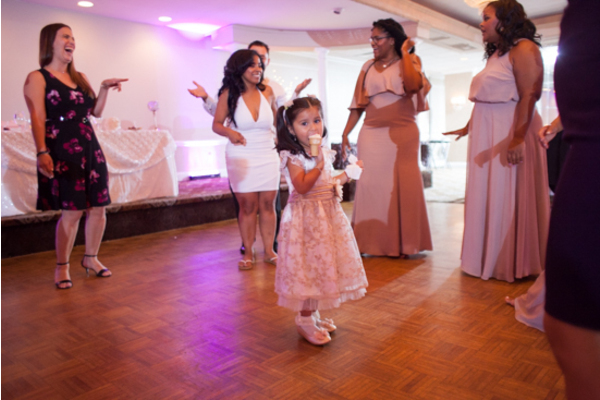 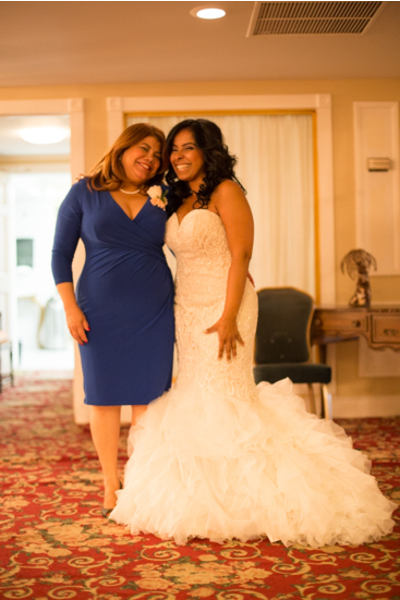 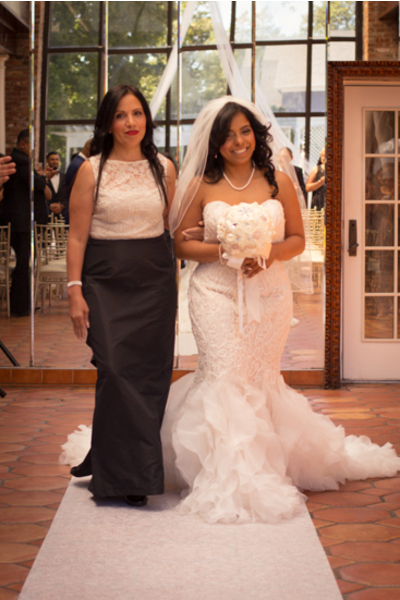 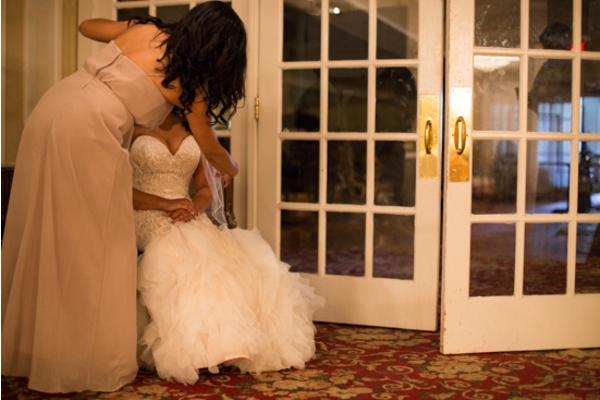 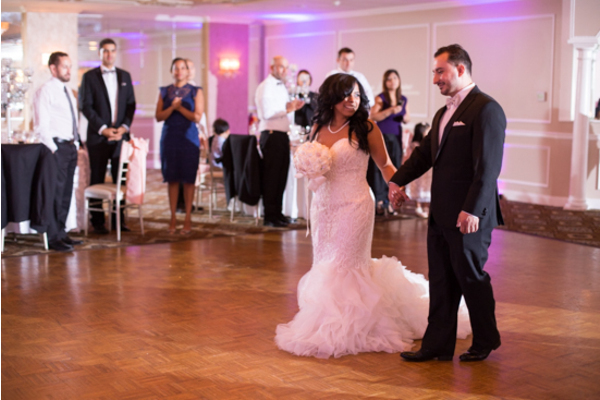 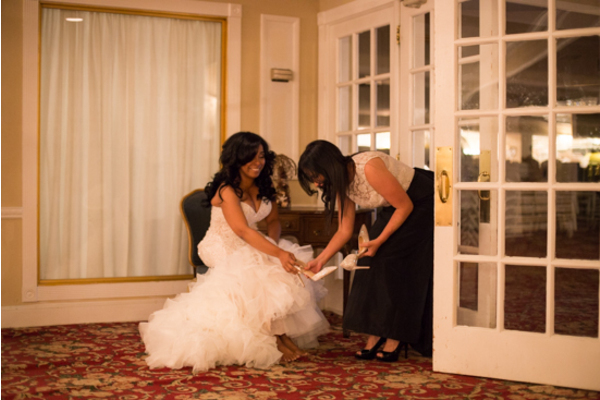 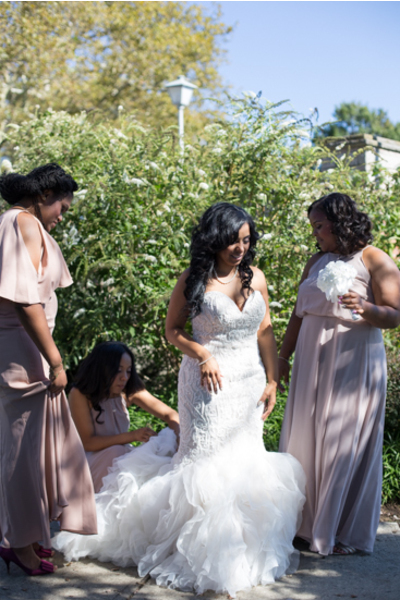 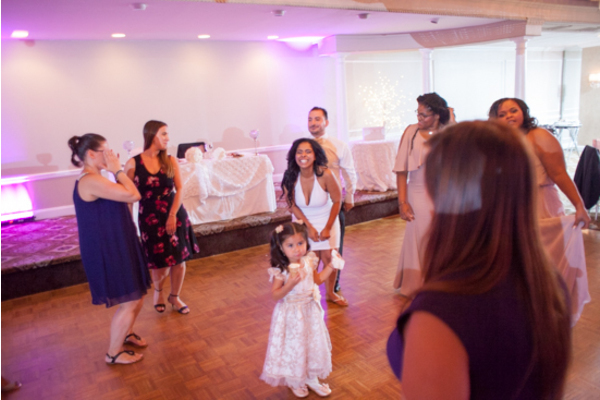 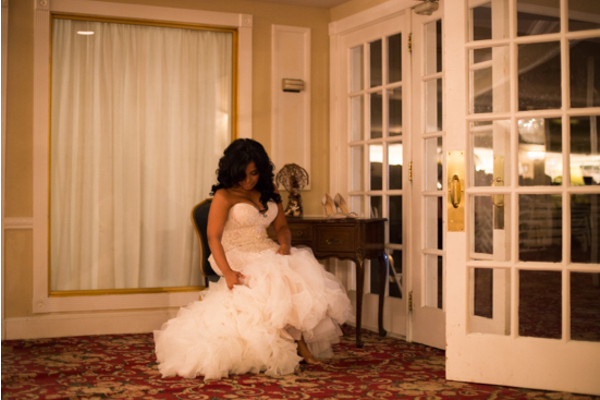 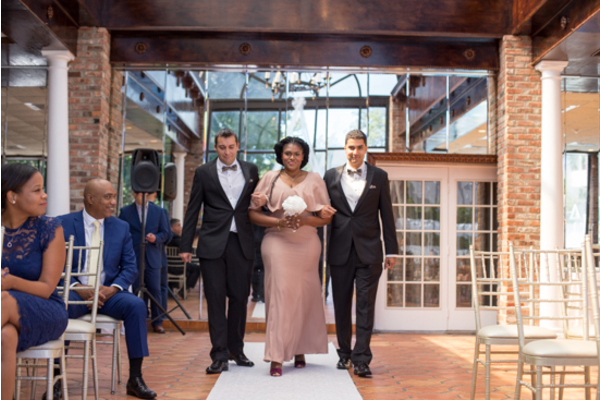 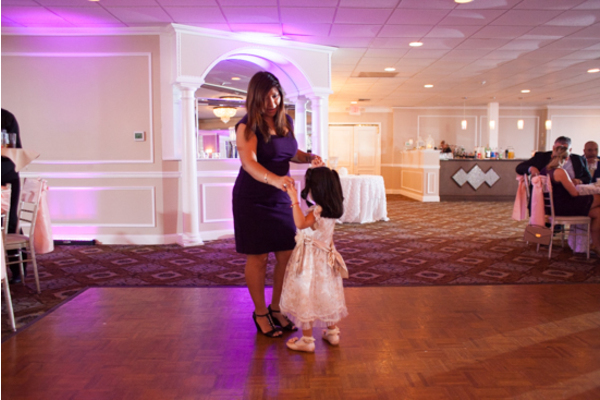 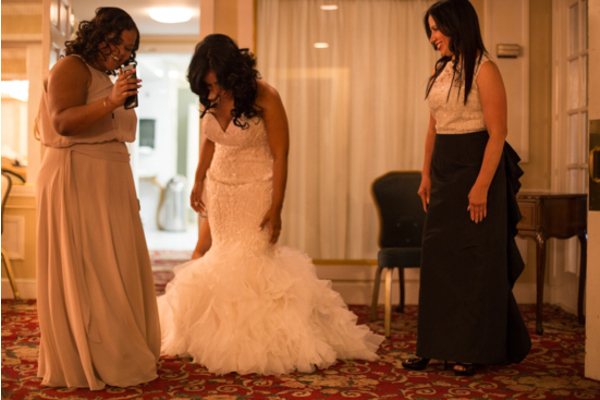 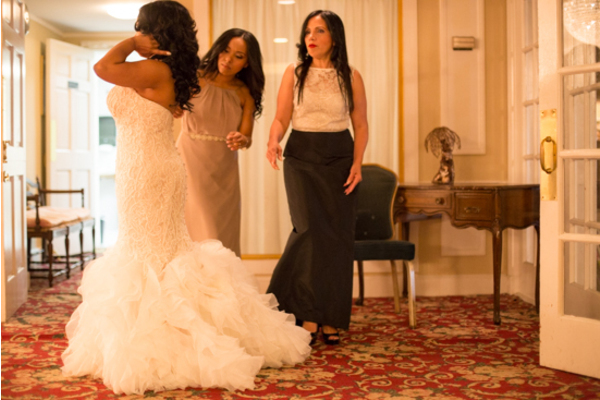 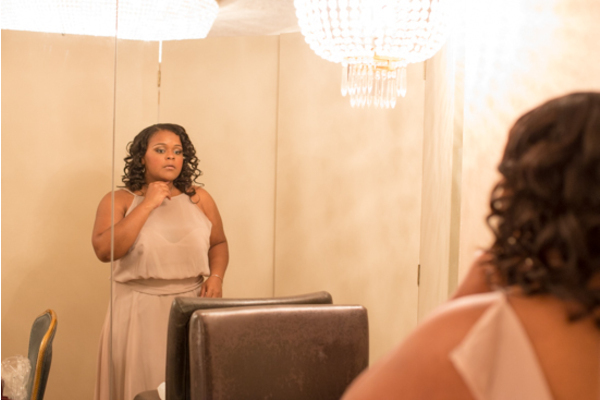 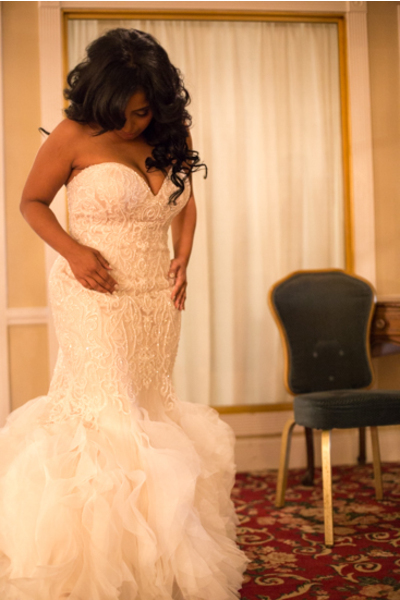 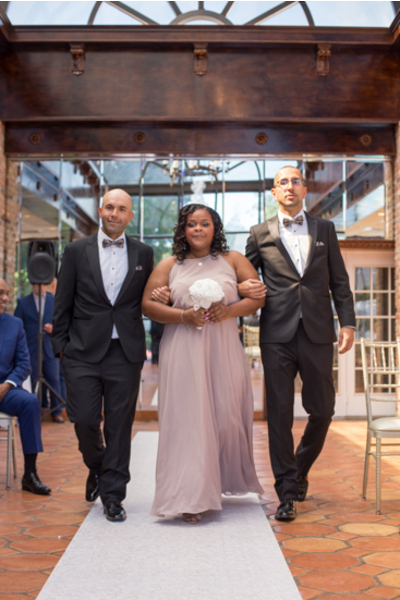 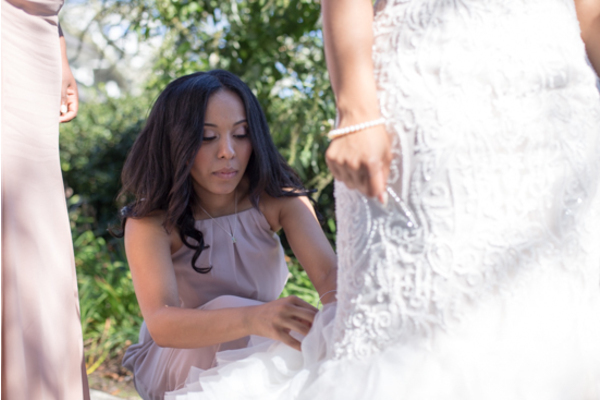 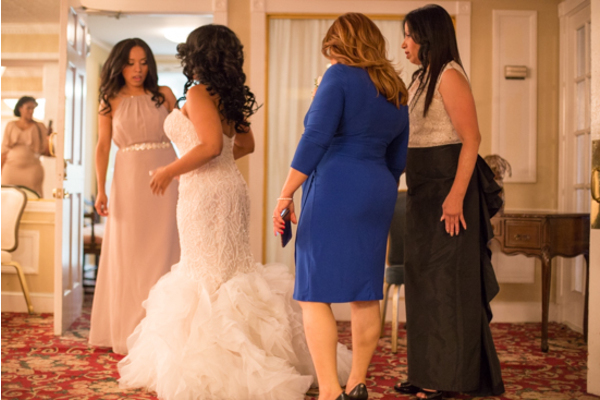 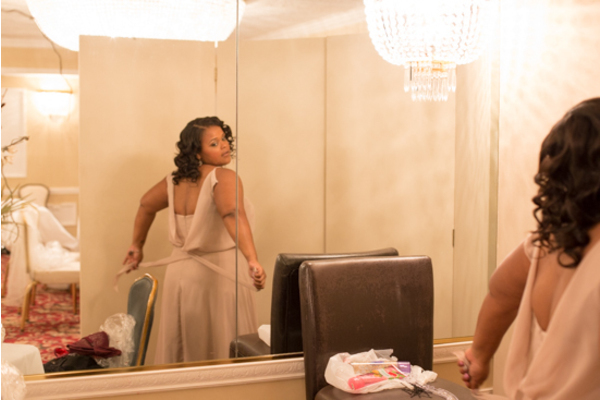 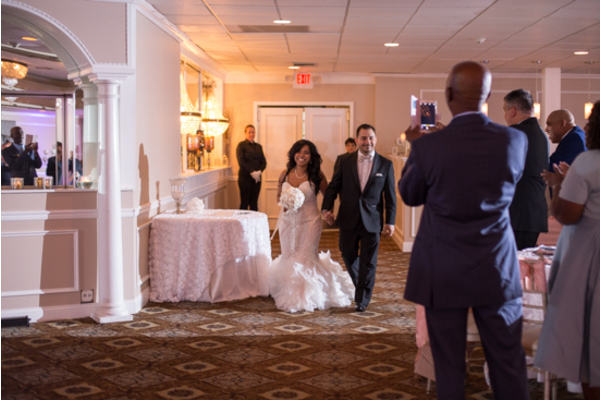 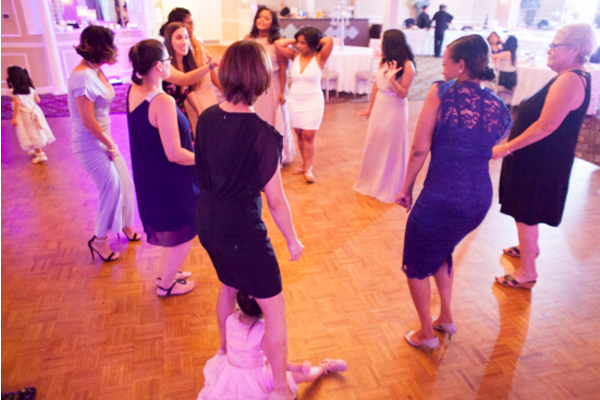 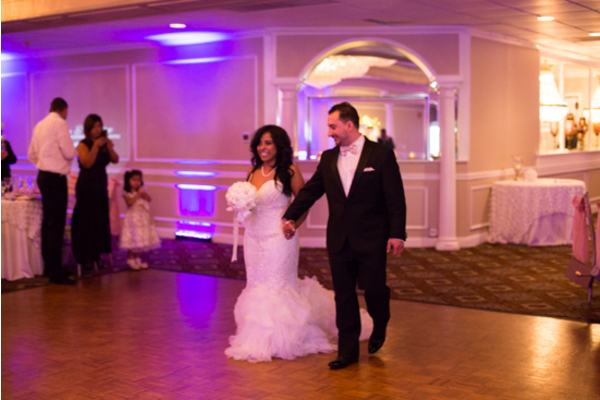 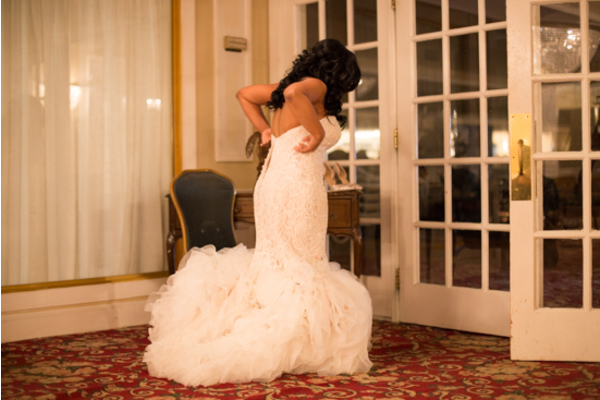 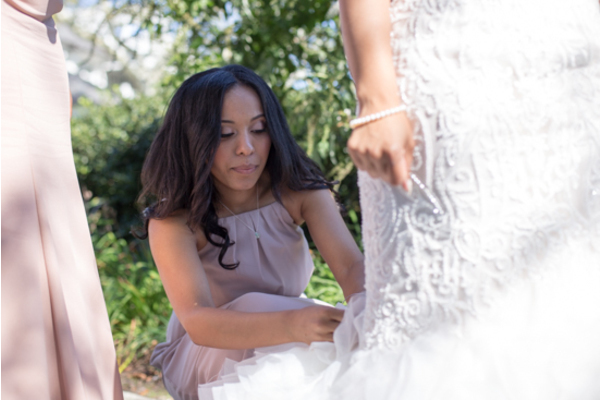 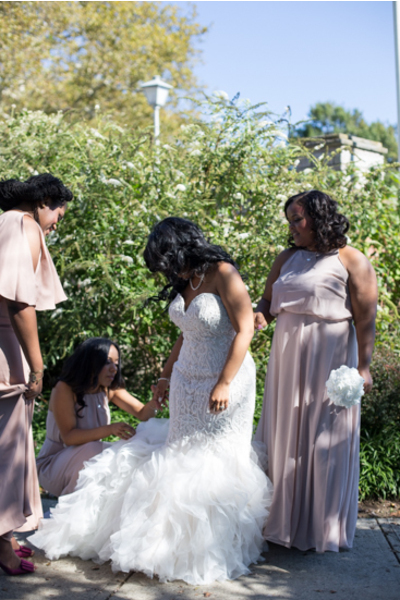 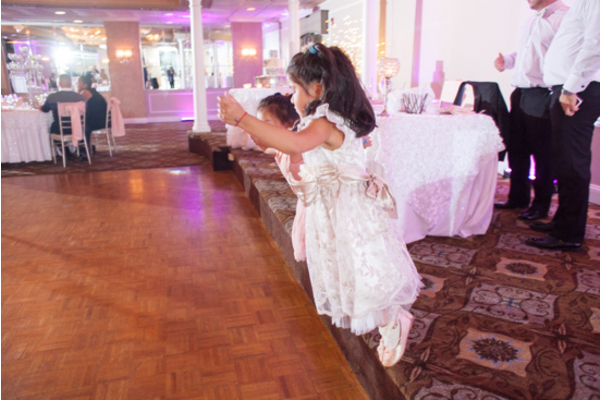 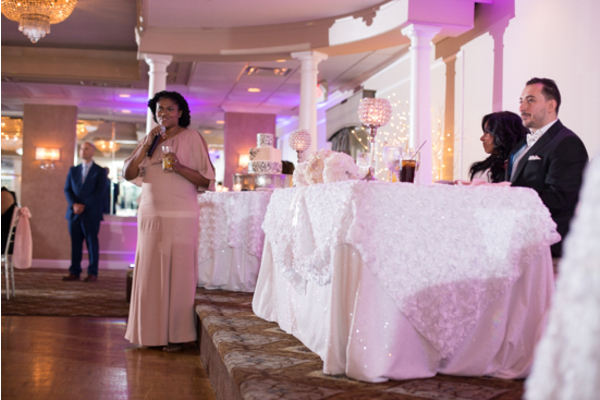 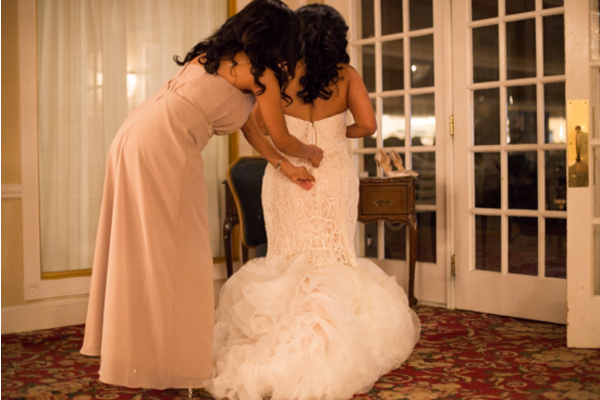 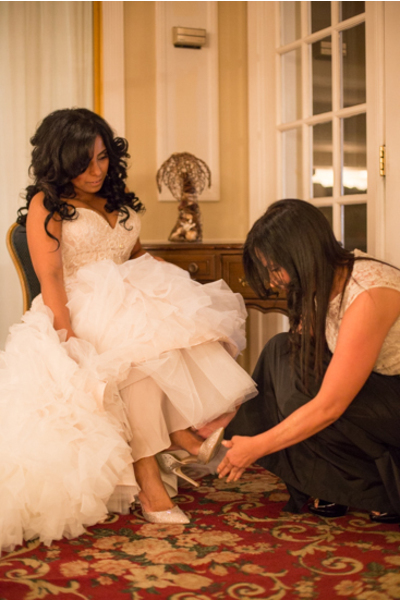 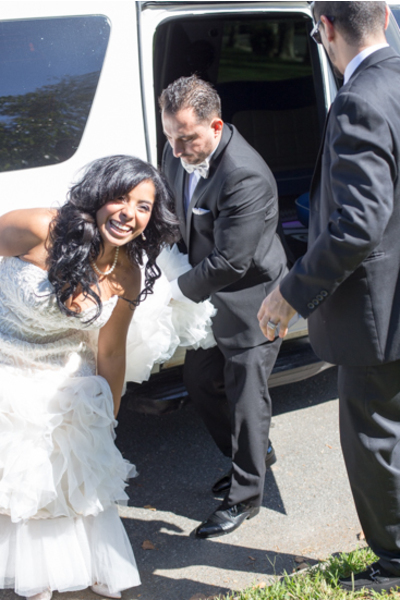 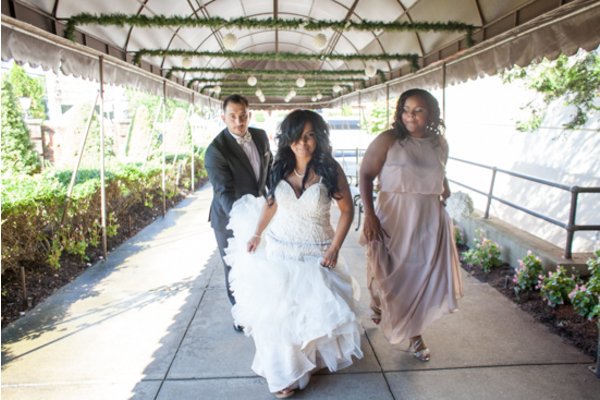 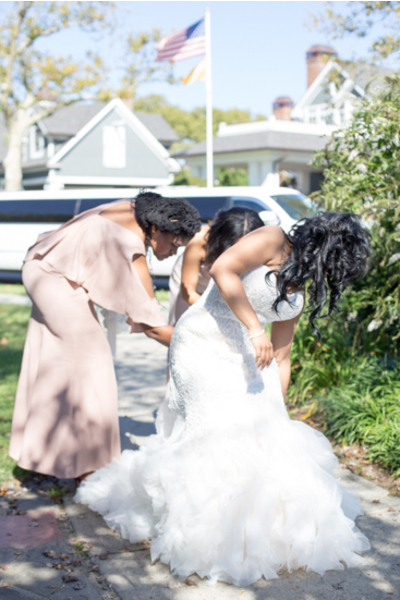 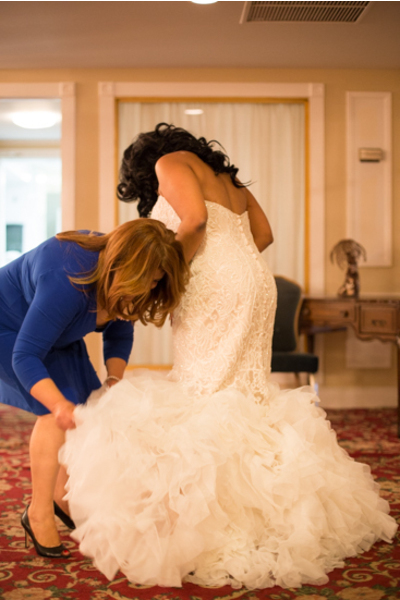 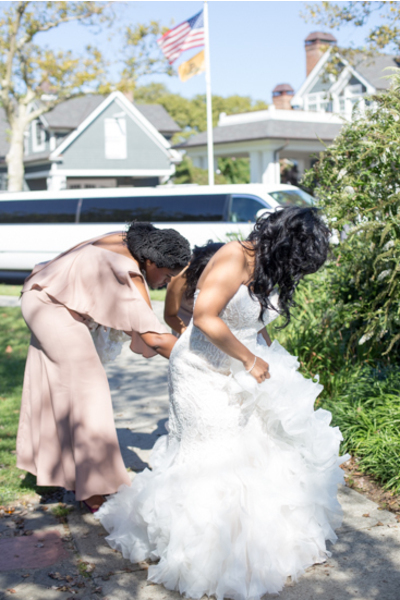 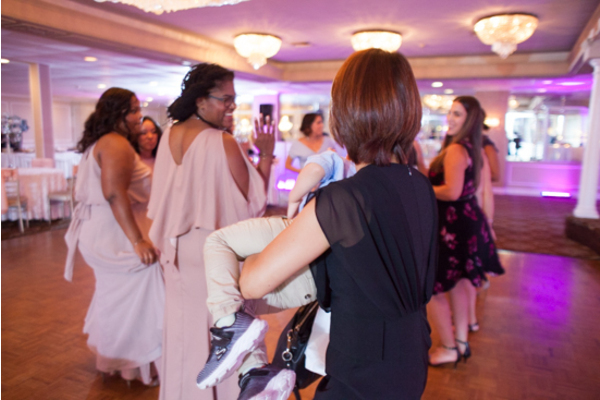 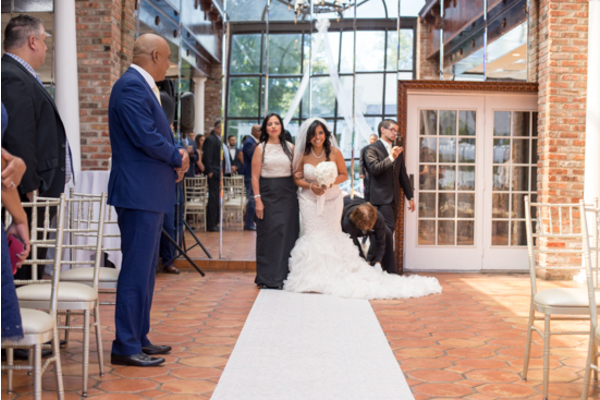 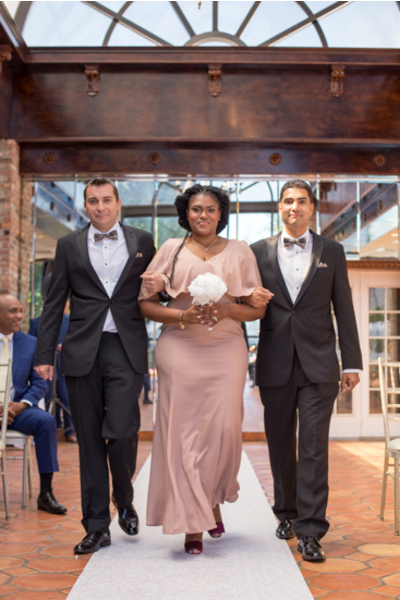 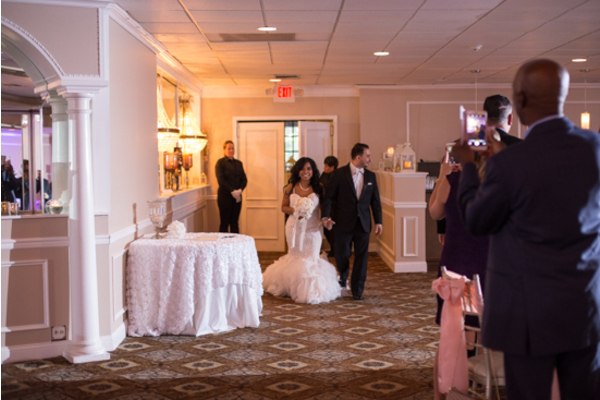 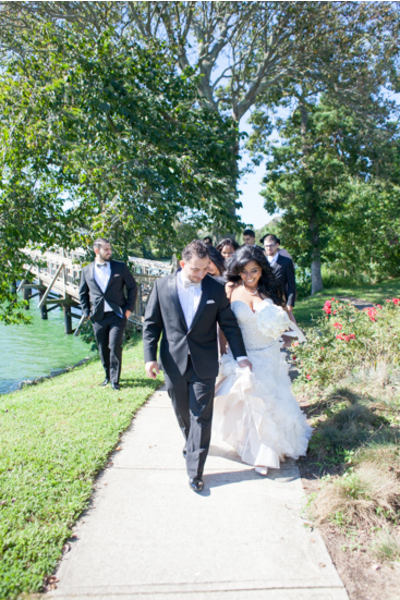 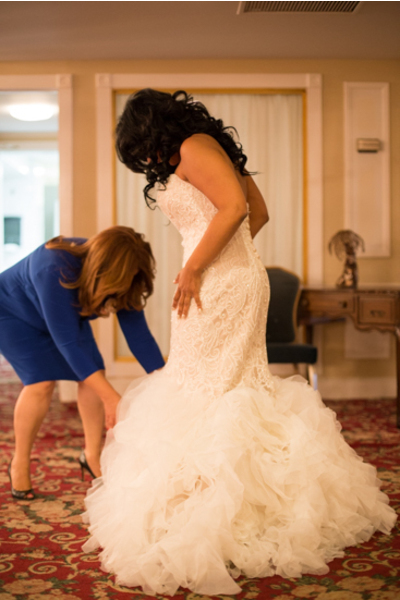 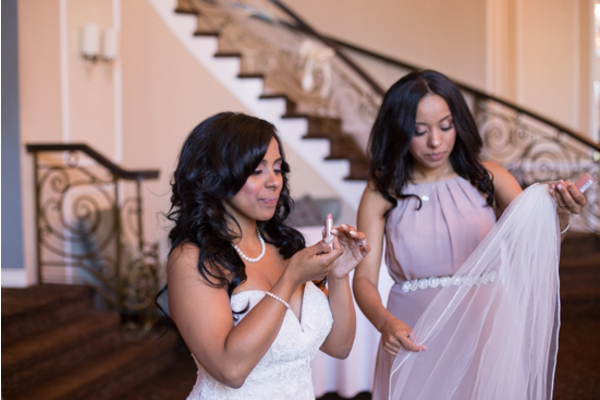 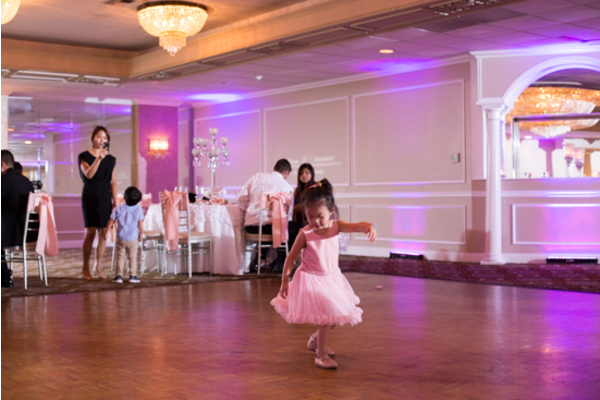 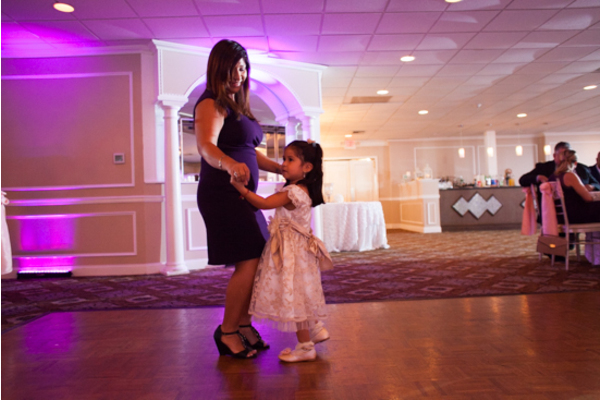 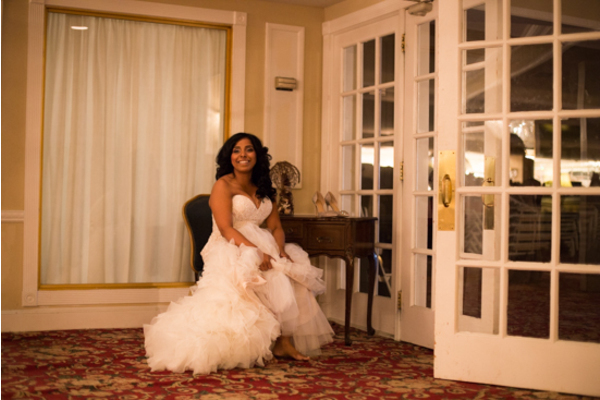 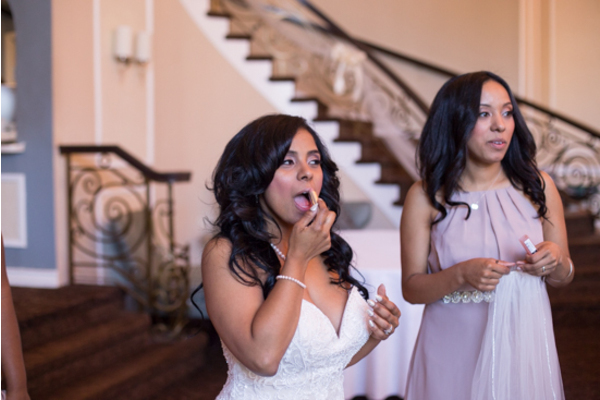 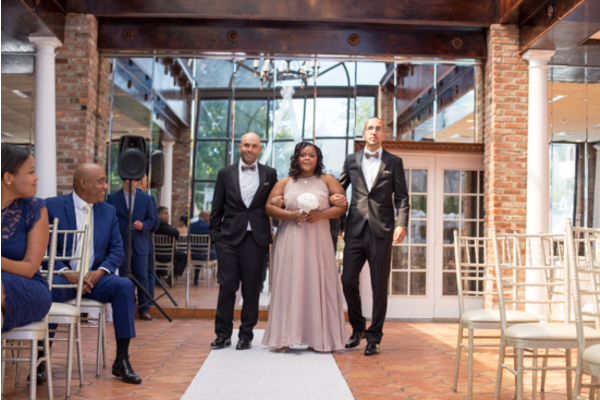 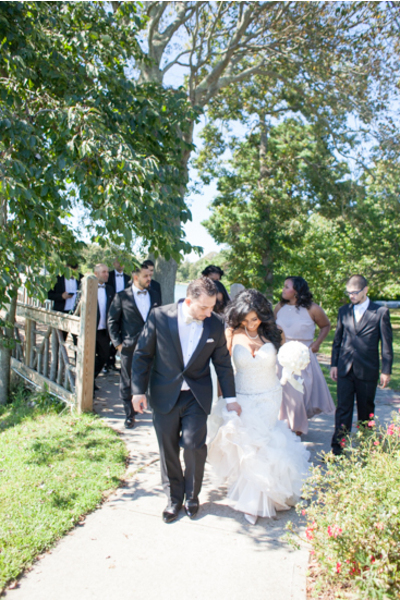 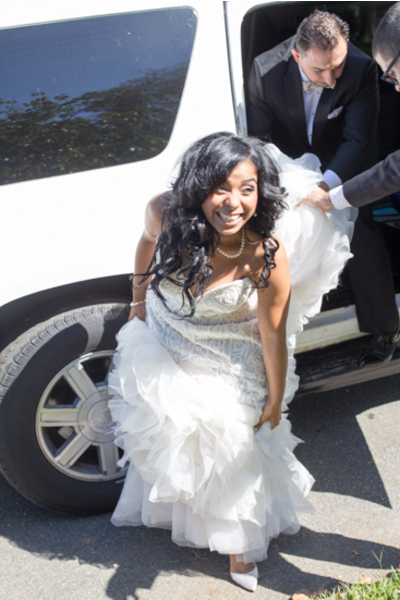 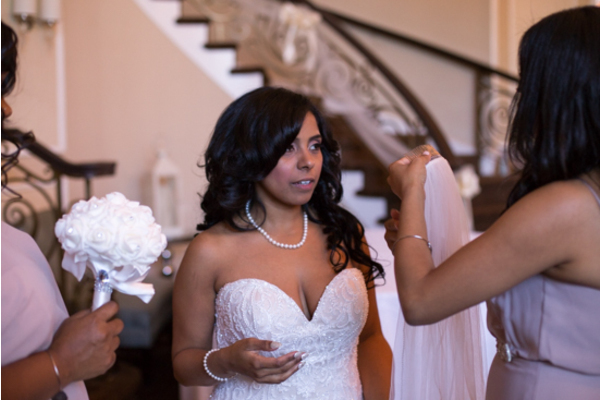 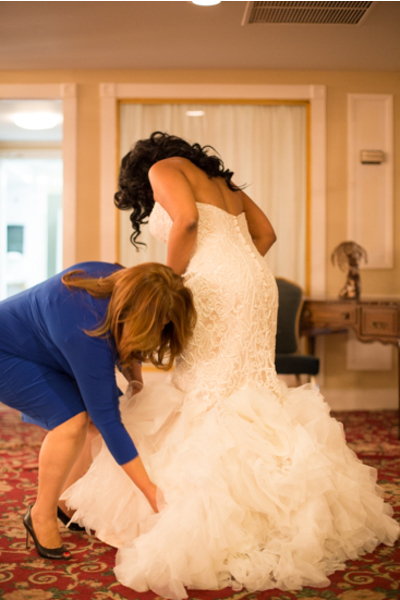 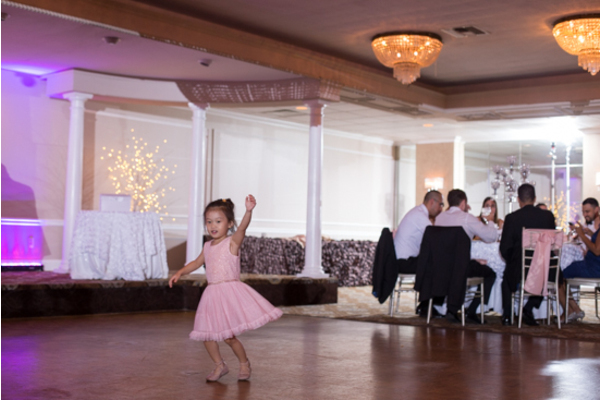 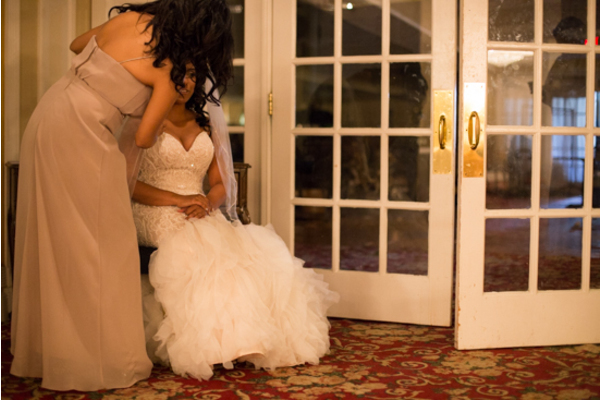 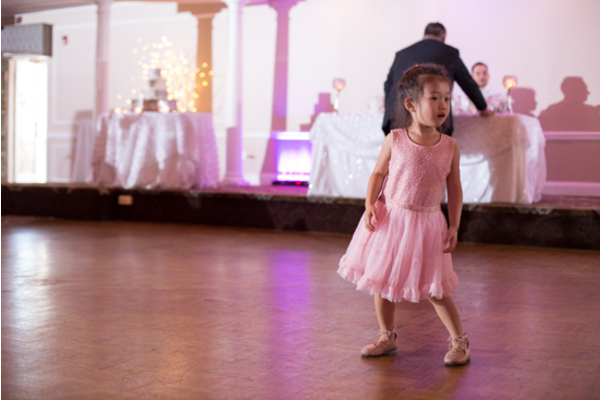 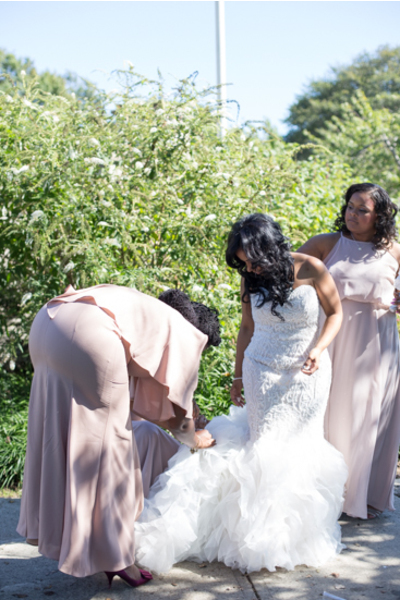 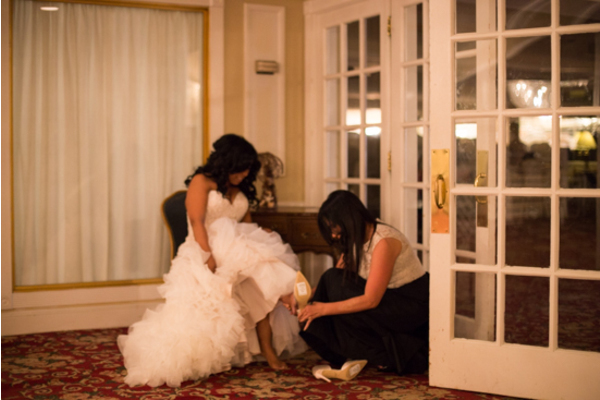 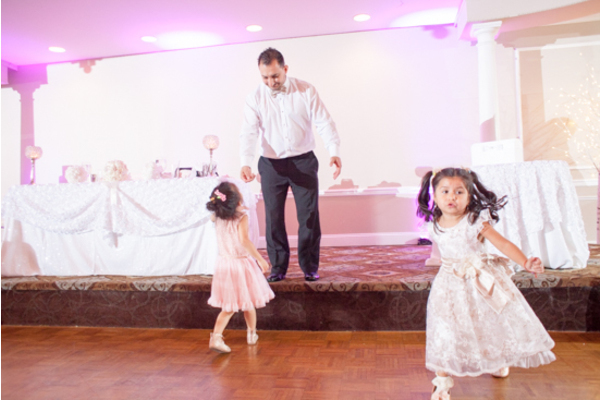 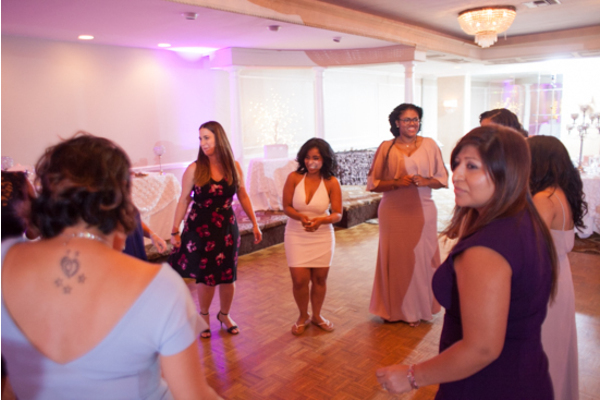 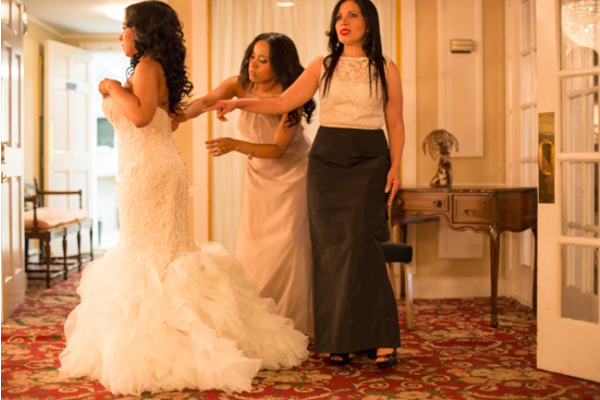 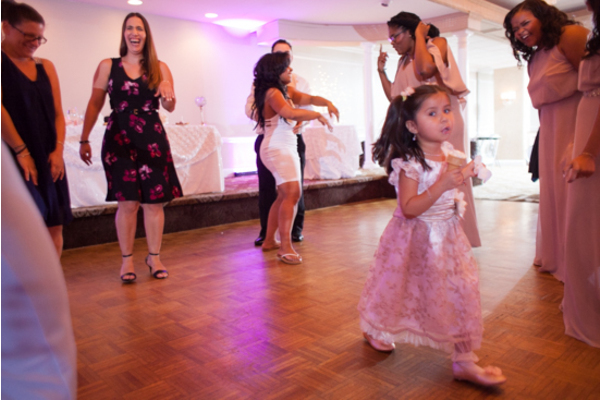 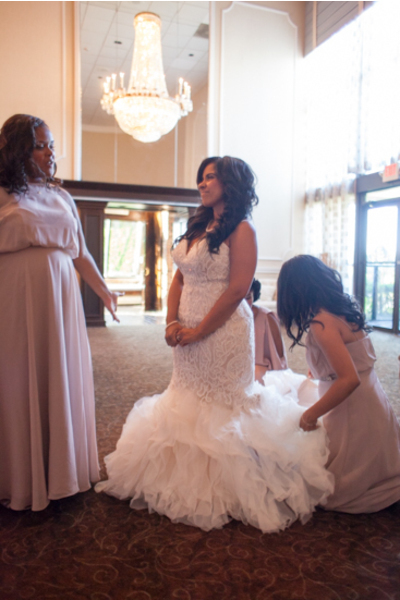 Once Jasmine’s look was complete, she slipped into her dress and her heels and she was ready to go! 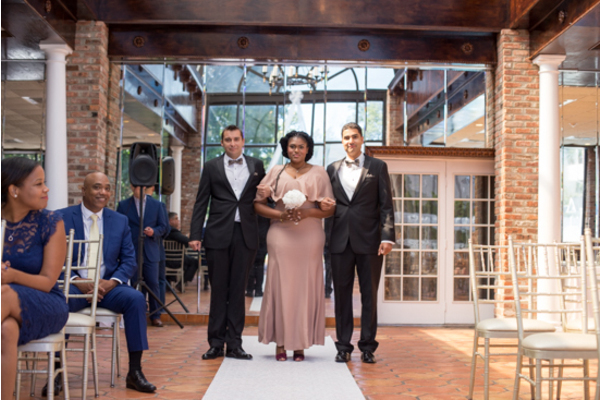 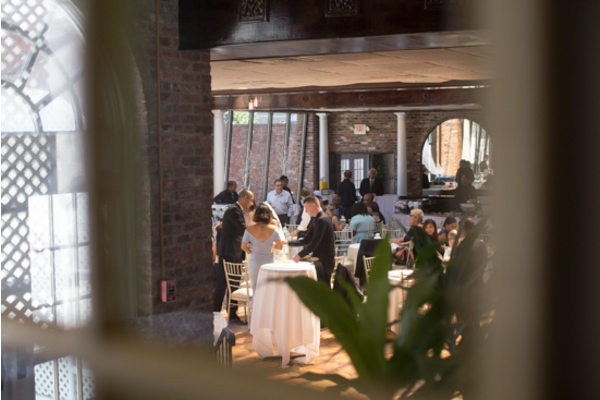 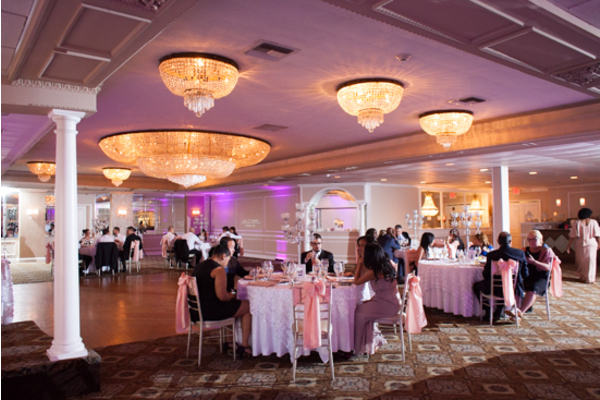 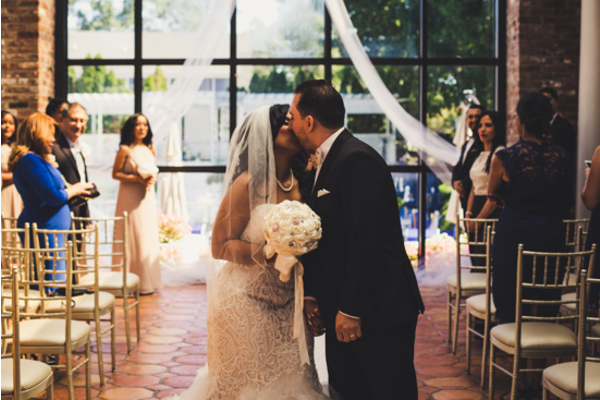 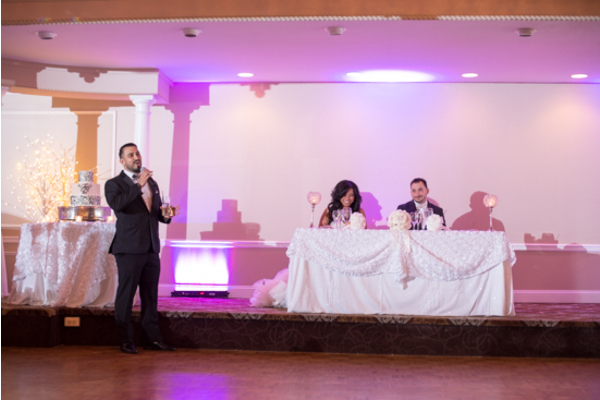 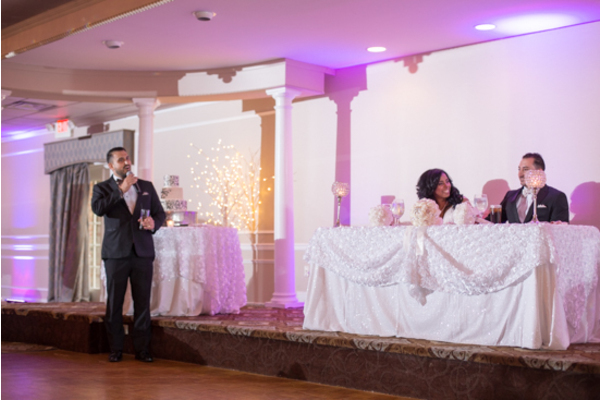 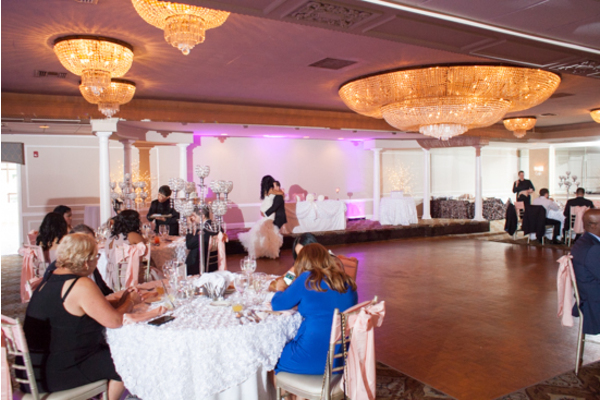 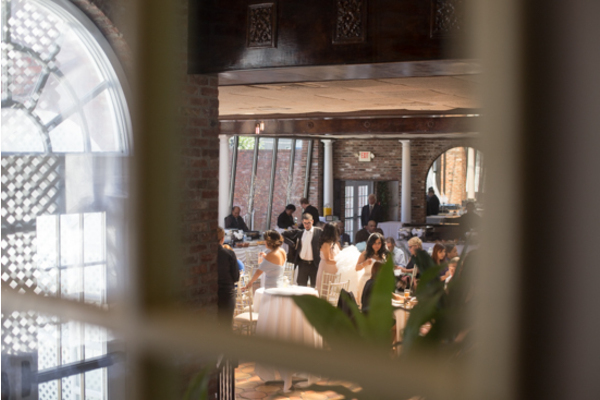 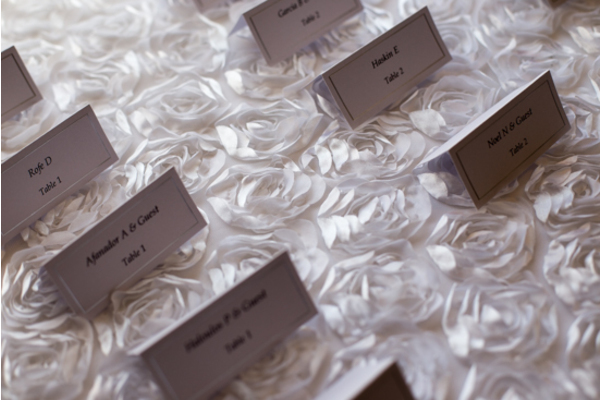 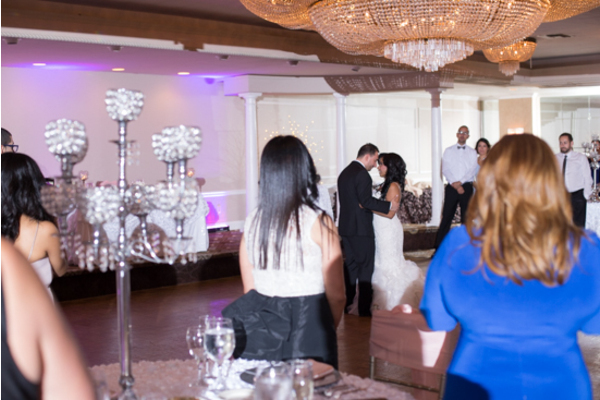 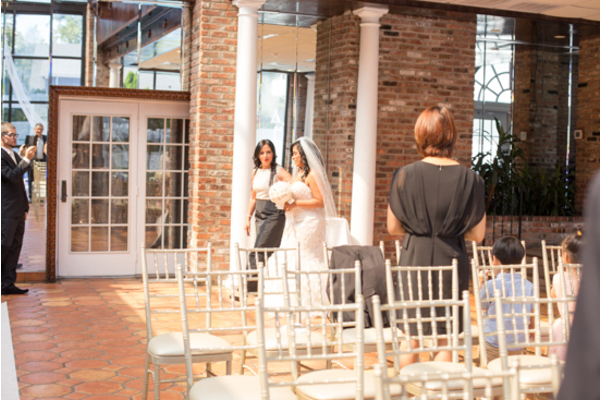 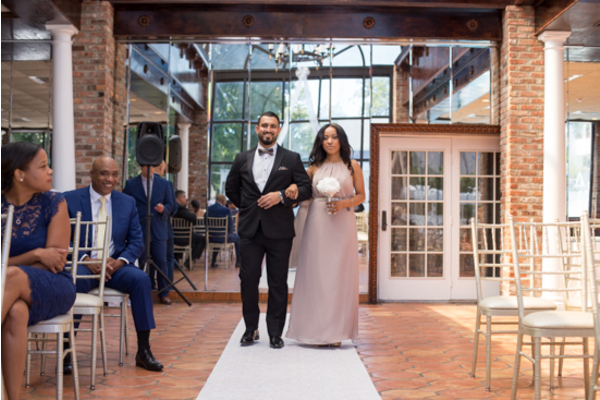 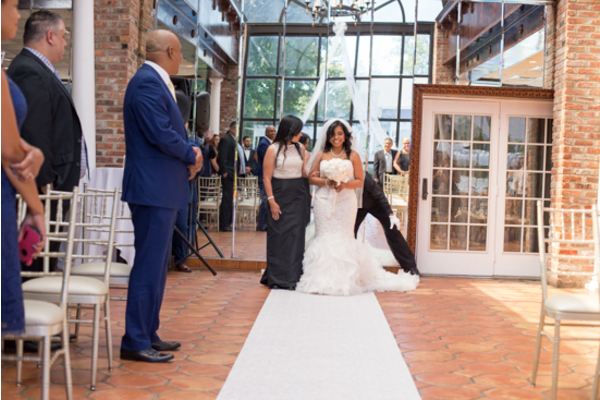 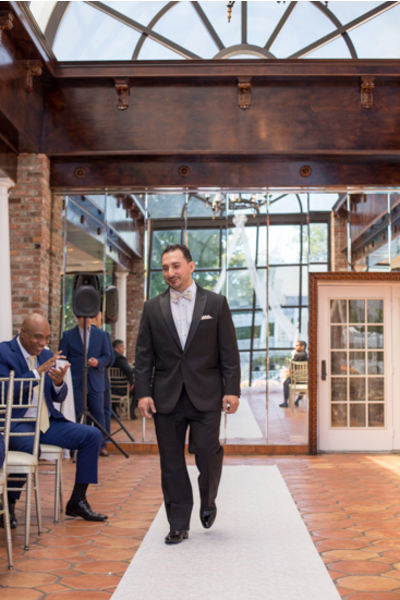 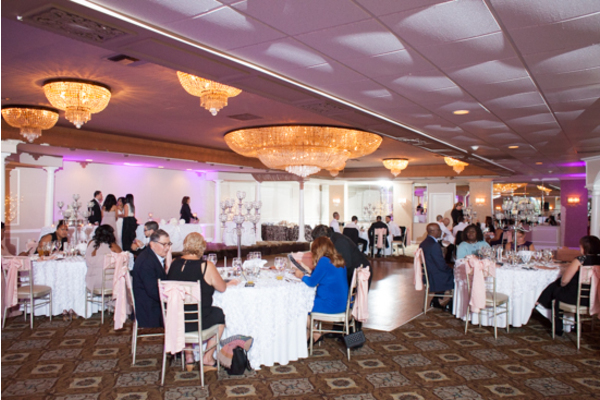 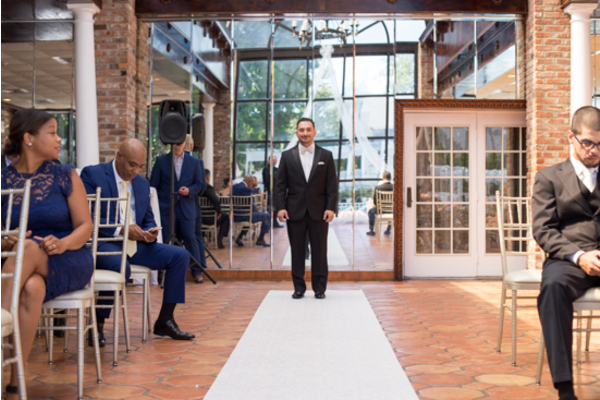 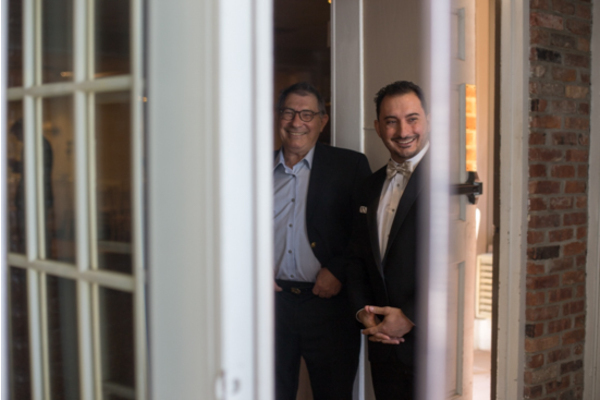 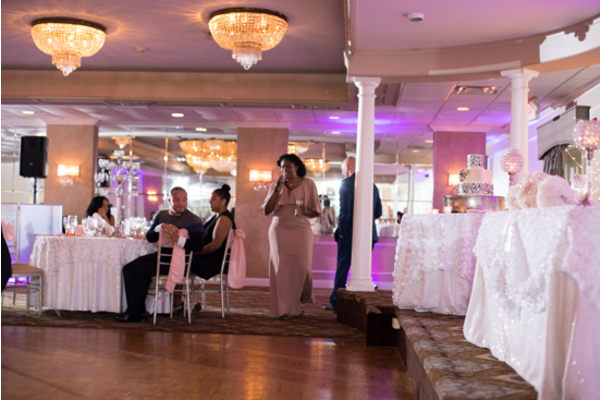 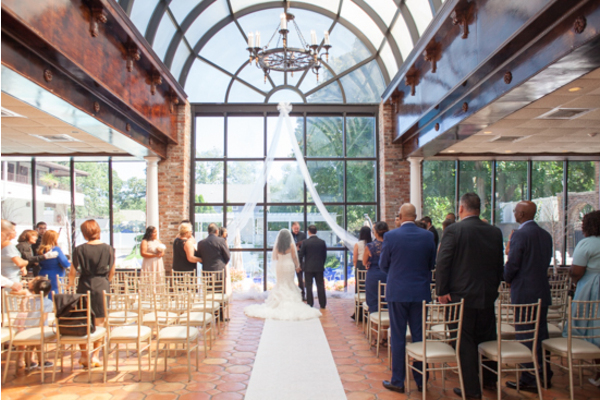 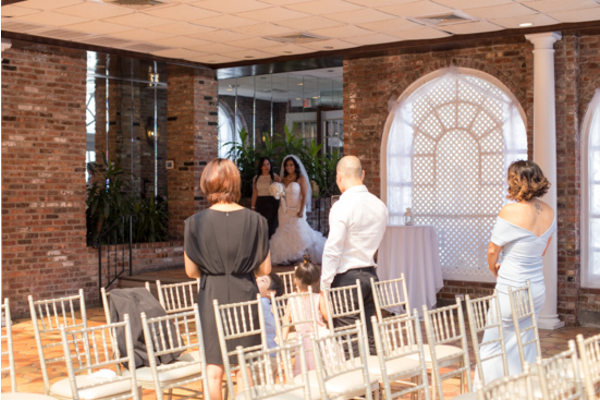 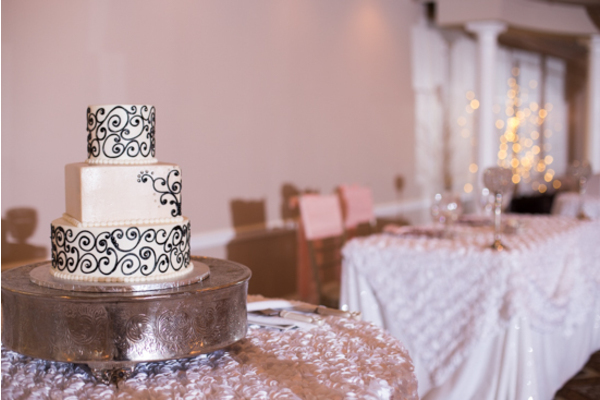 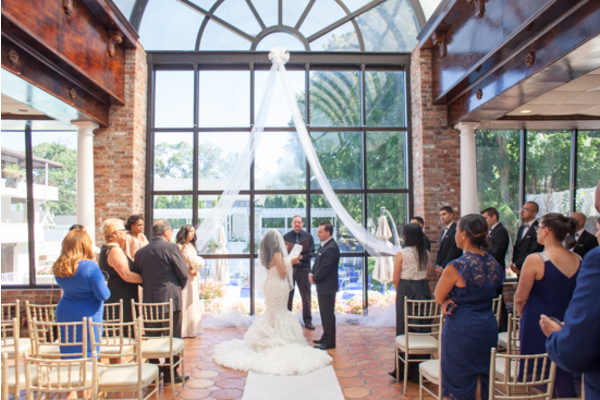 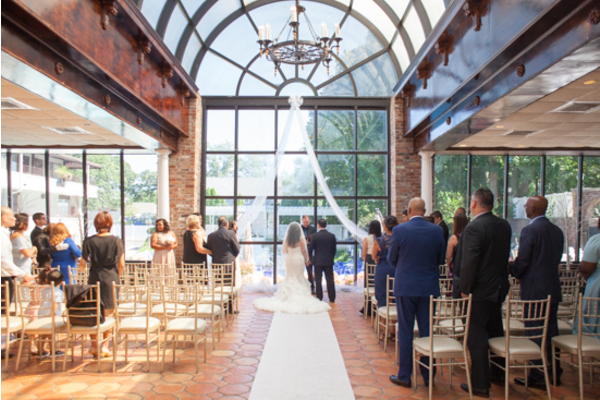 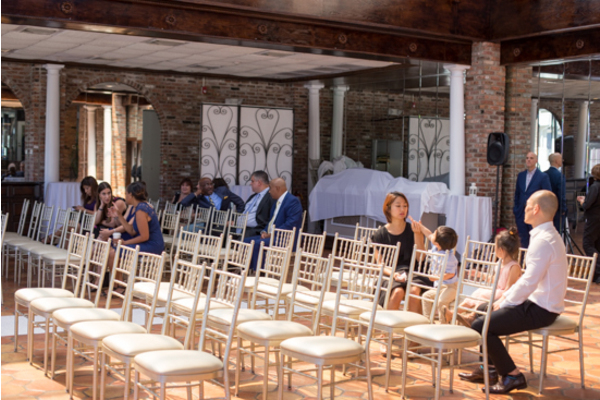 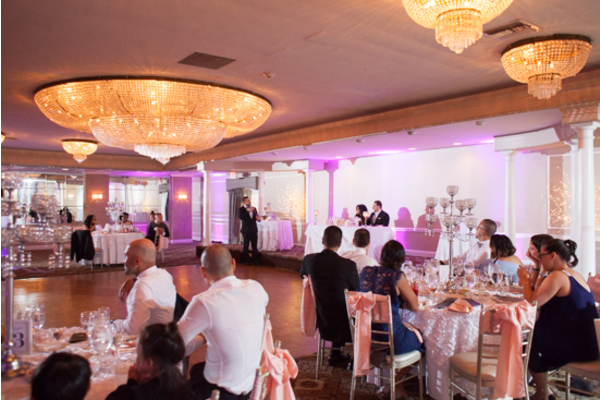 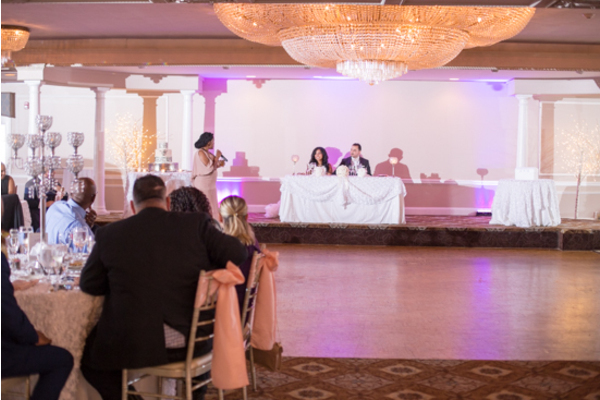 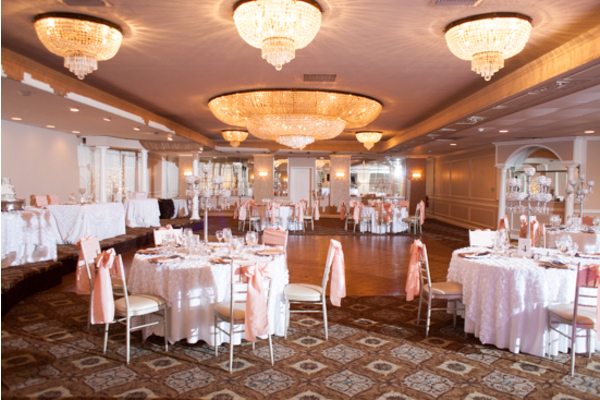 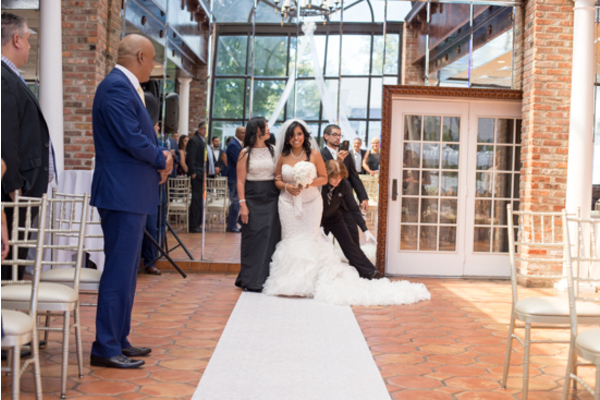 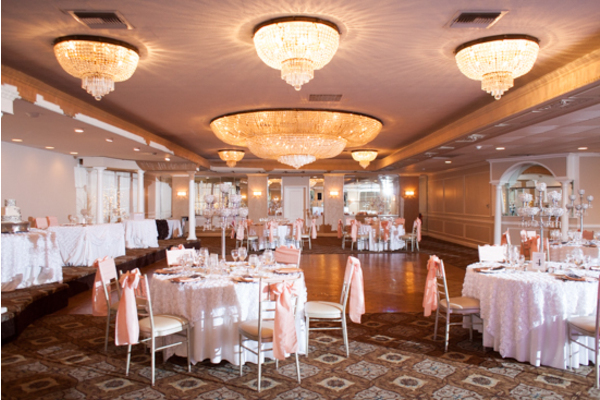 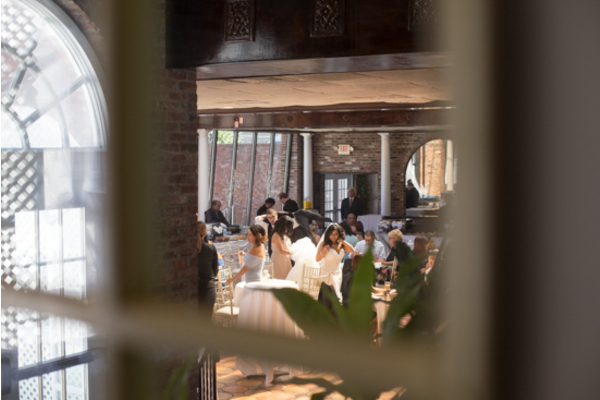 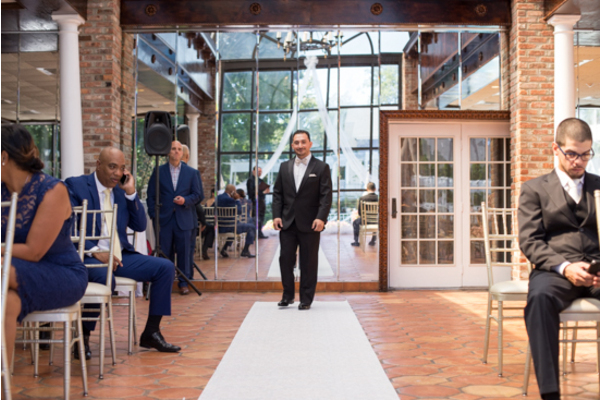 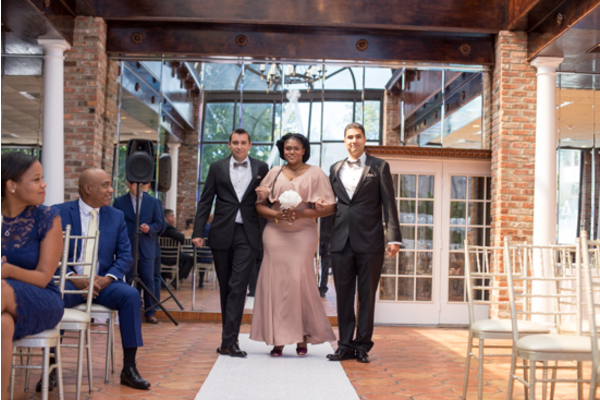 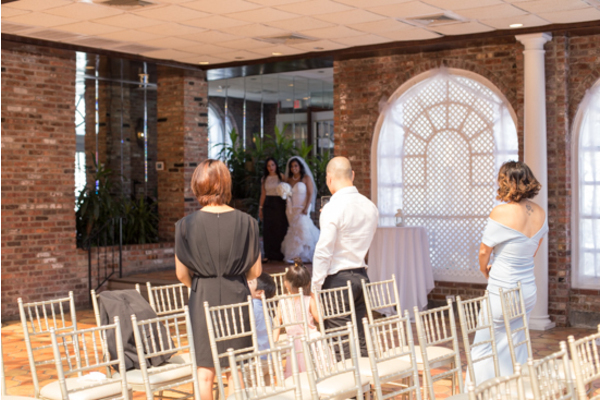 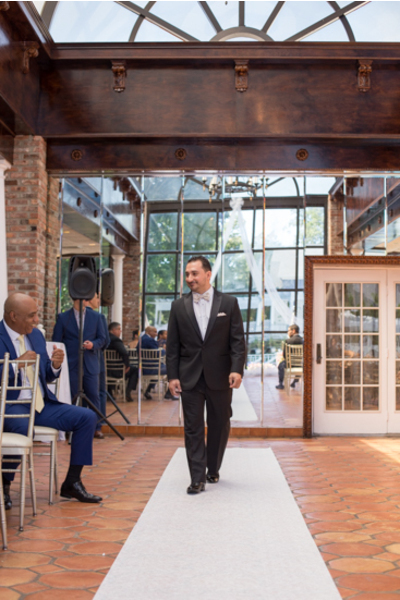 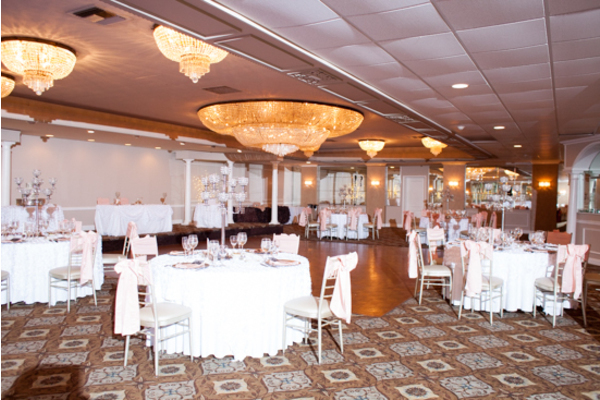 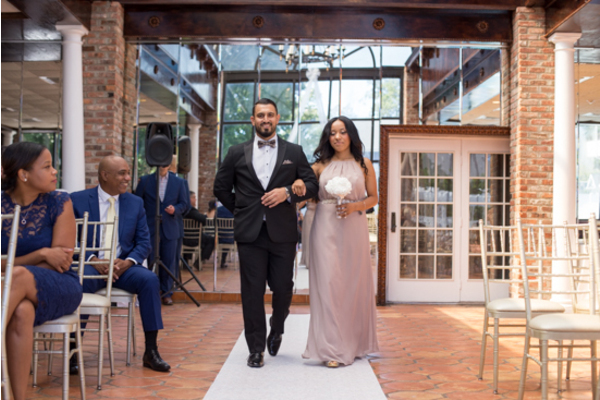 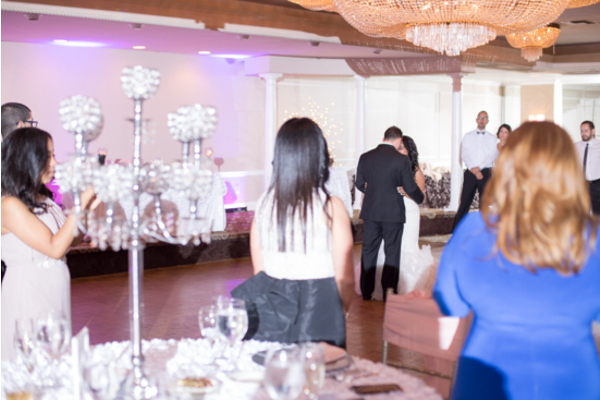 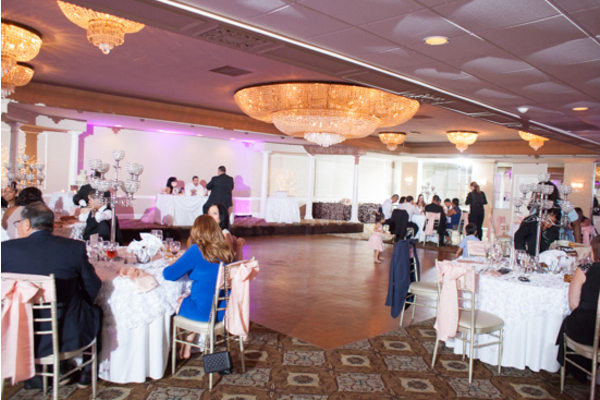 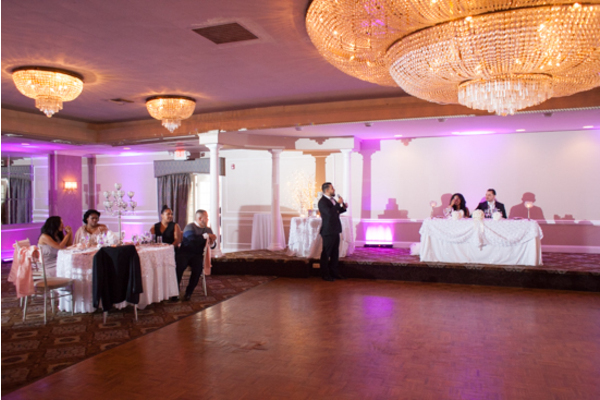 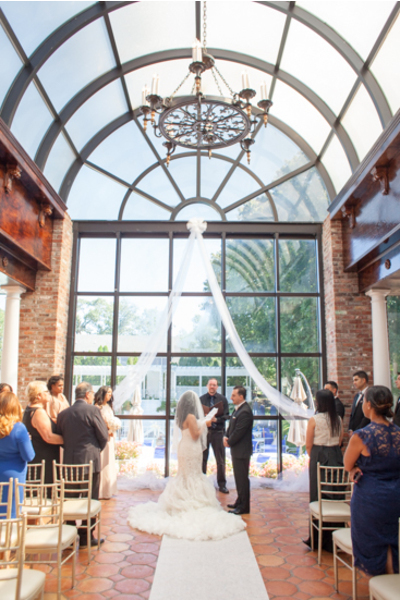 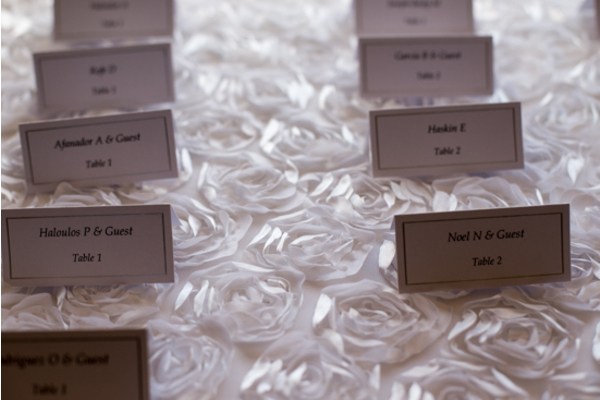 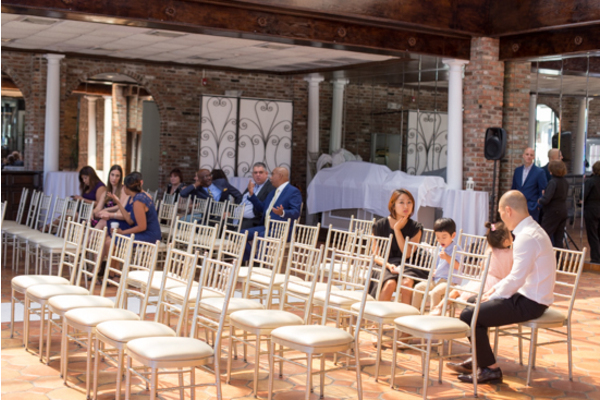 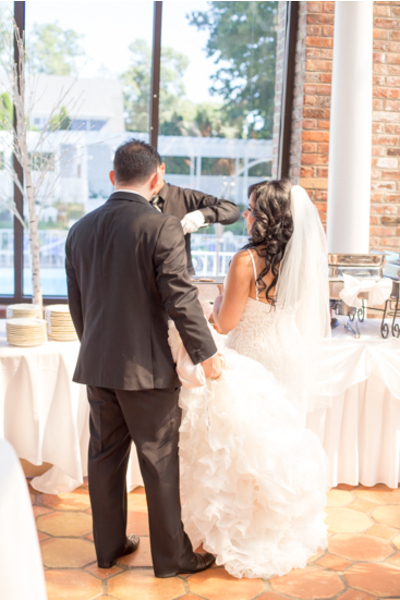 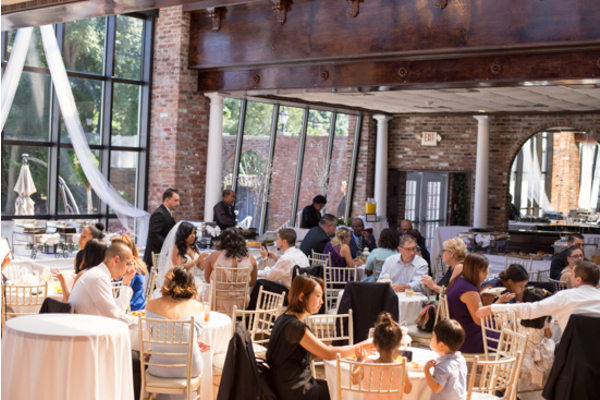 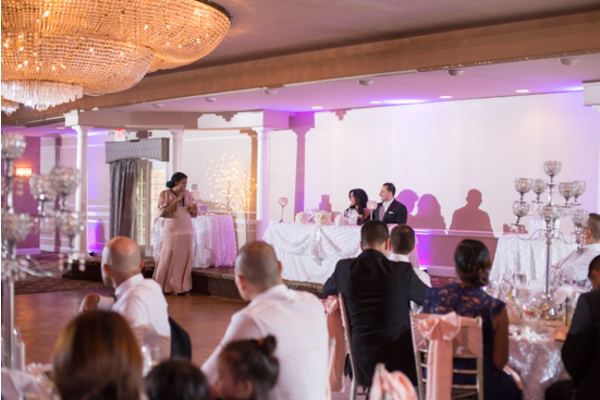 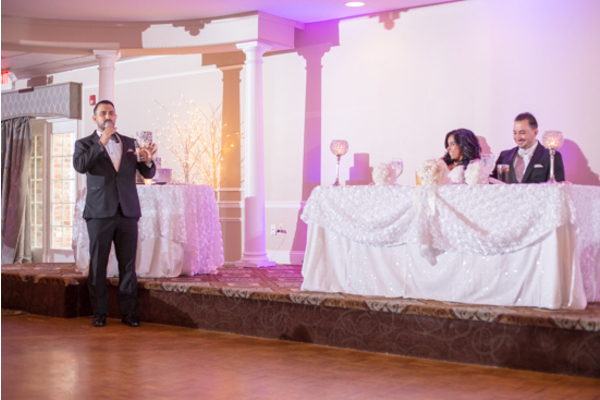 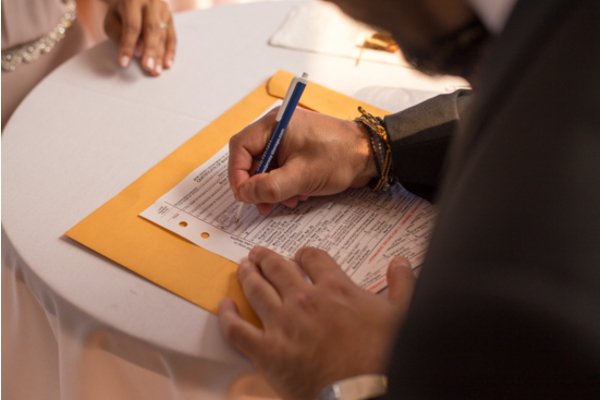 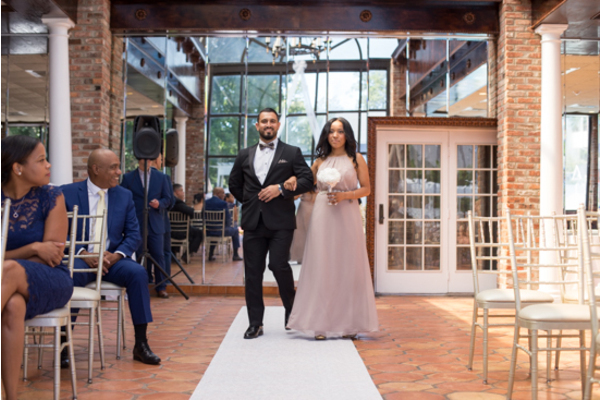 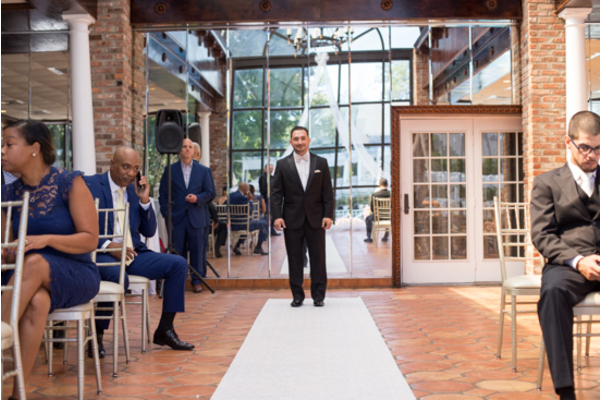 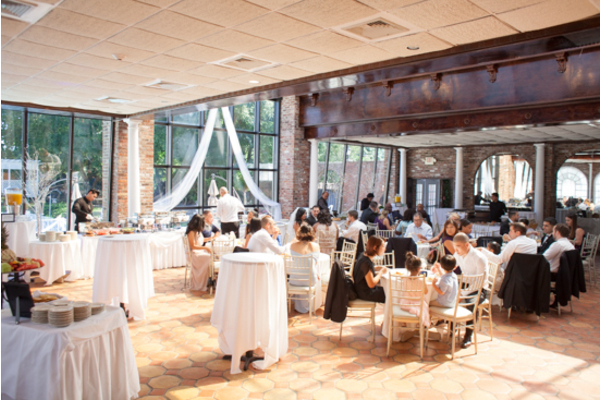 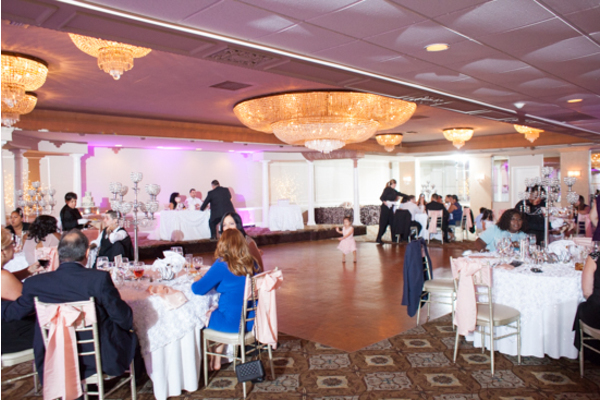 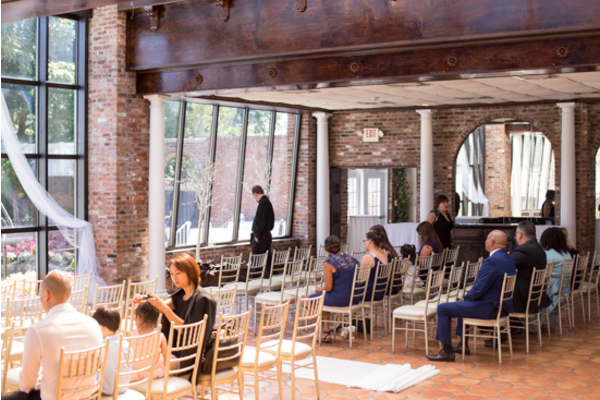 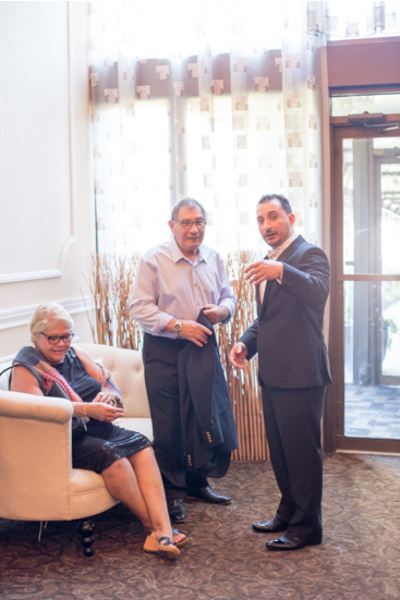 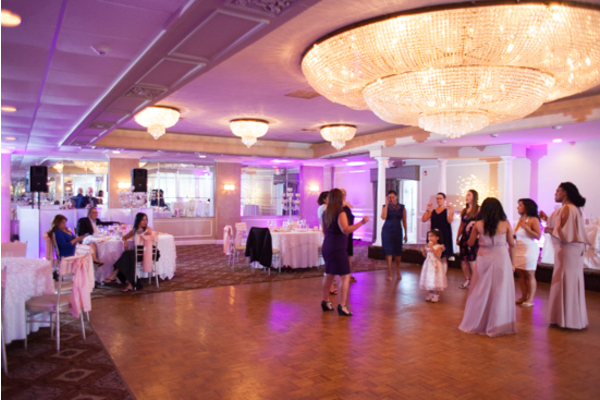 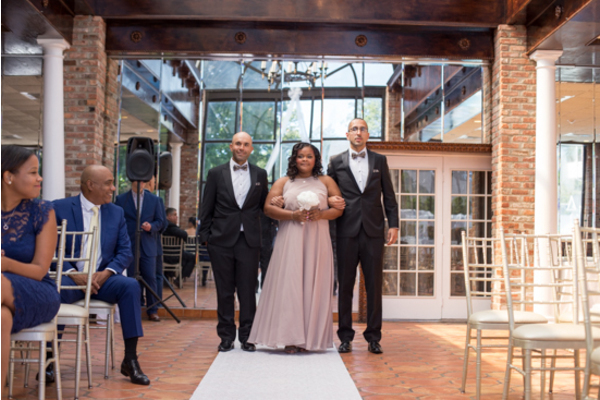 The ceremony took place in a beautiful room lined with floor to ceiling glass windows. 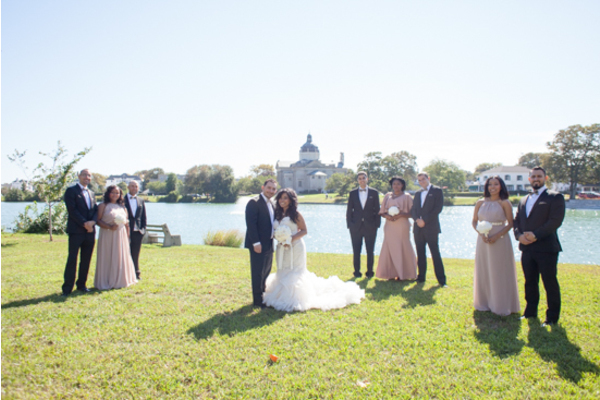 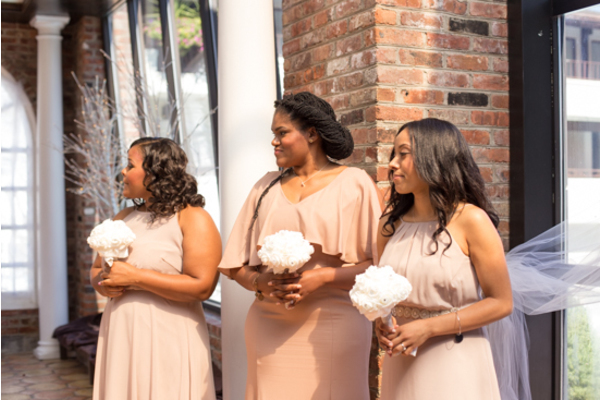 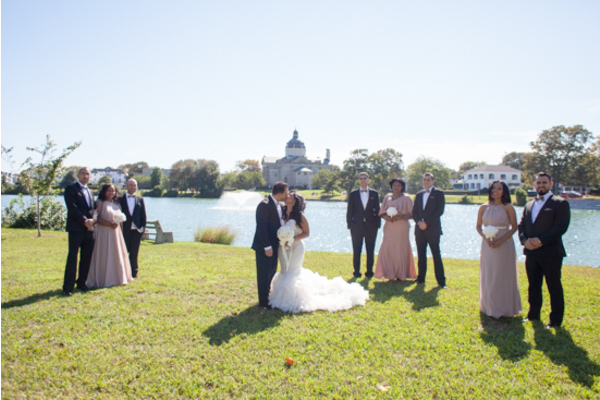 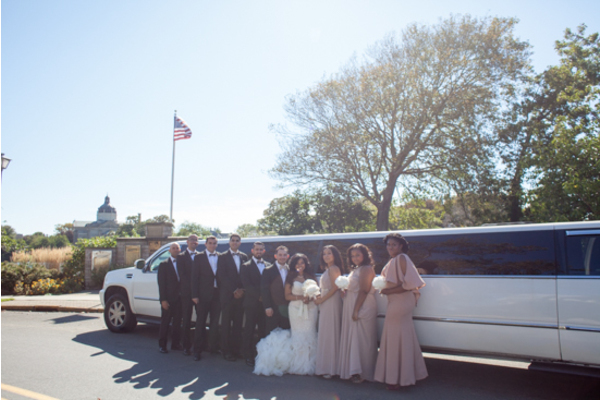 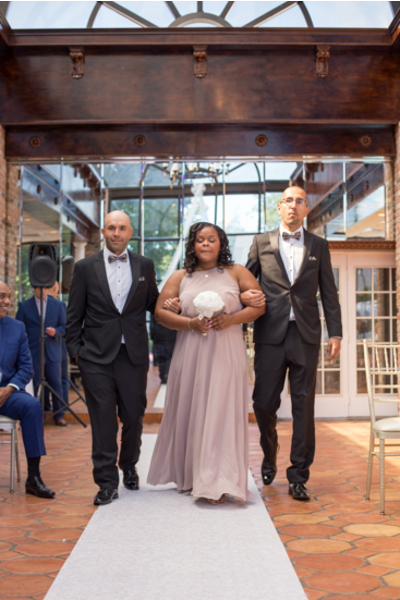 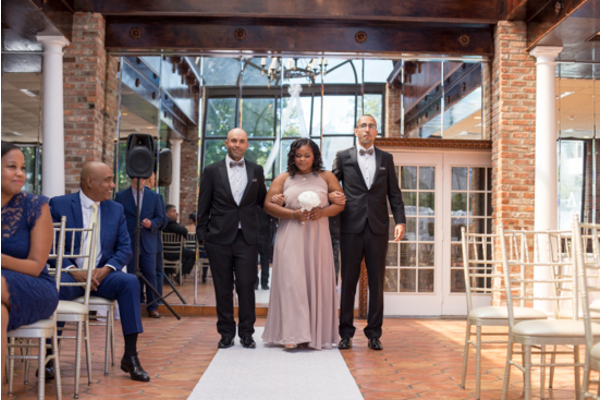 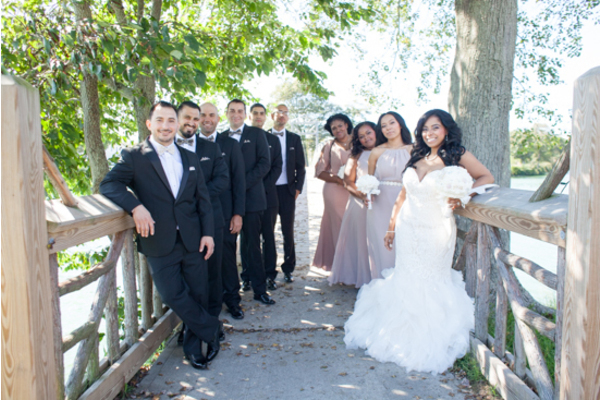 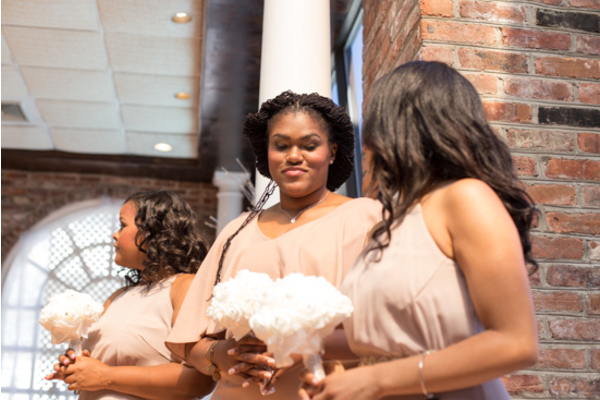 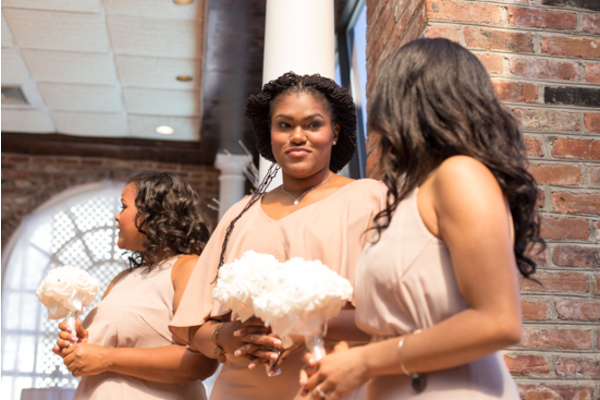 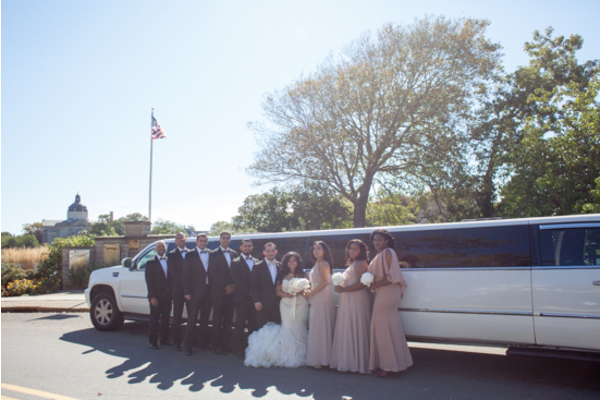 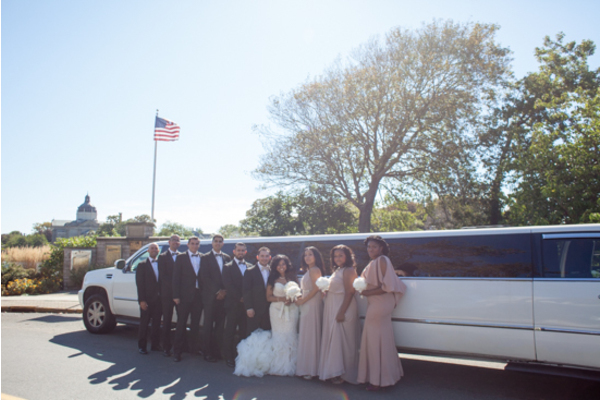 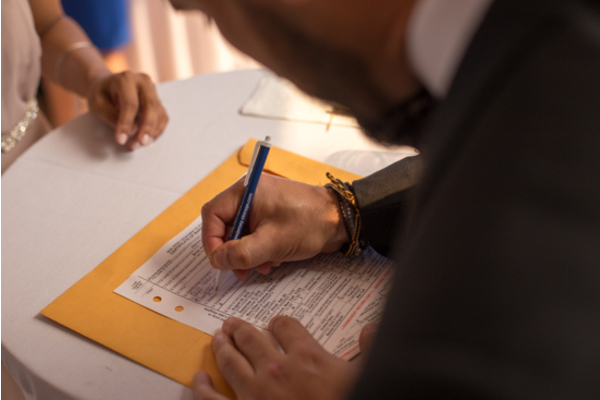 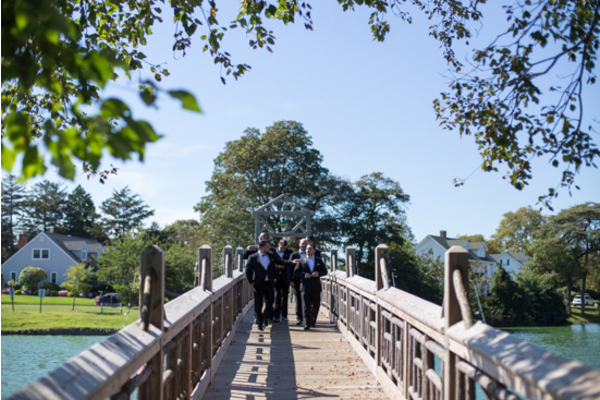 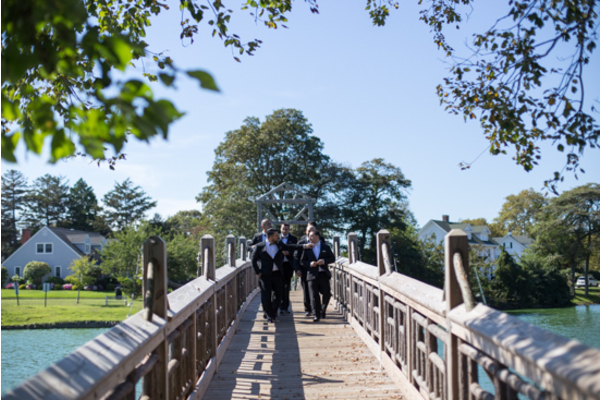 The sun was shining as the bridal party took center stage at the alter. 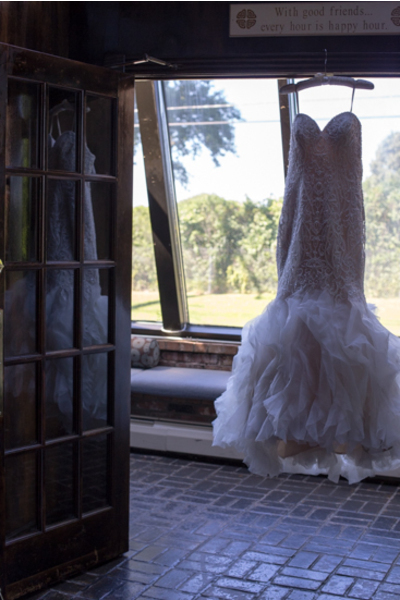 She looked absolutely stunning as she made her way to the man of her dreams. 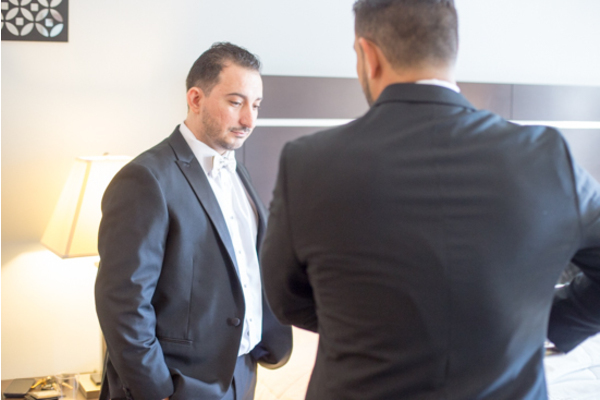 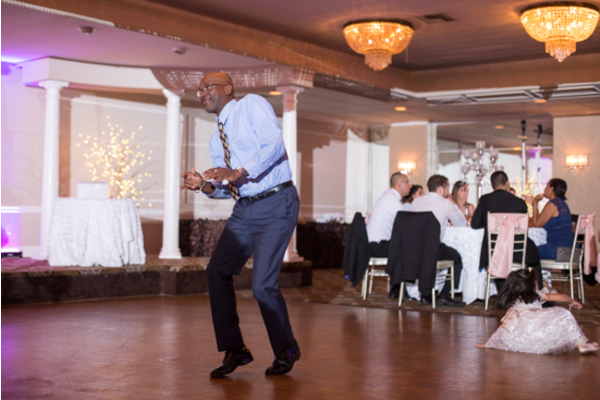 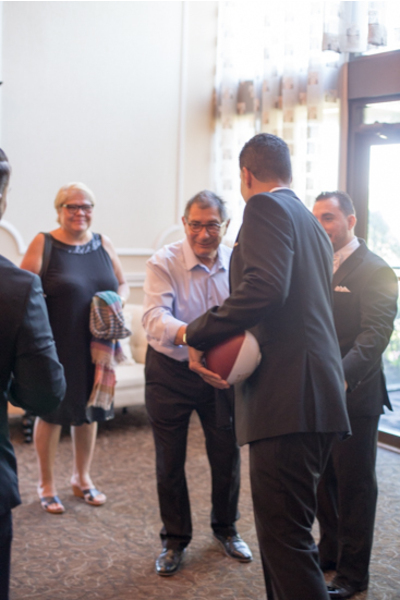 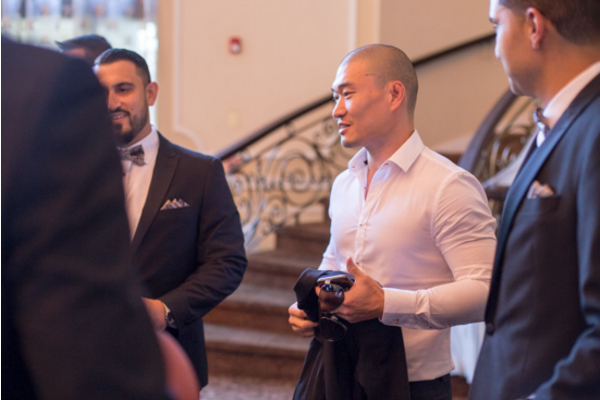 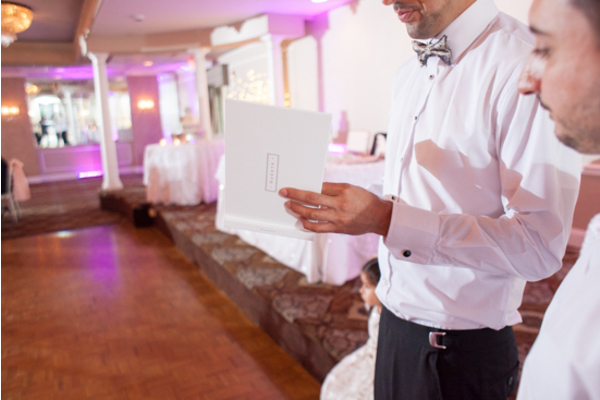 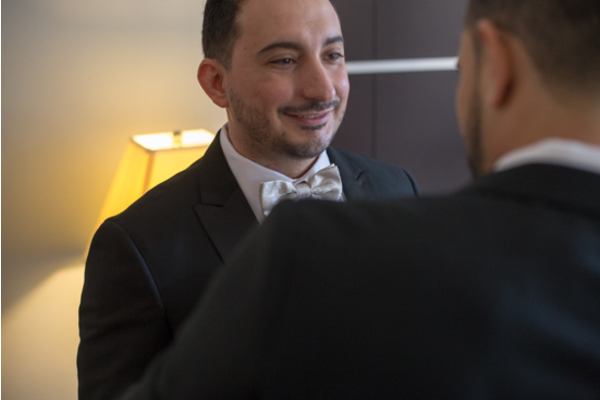 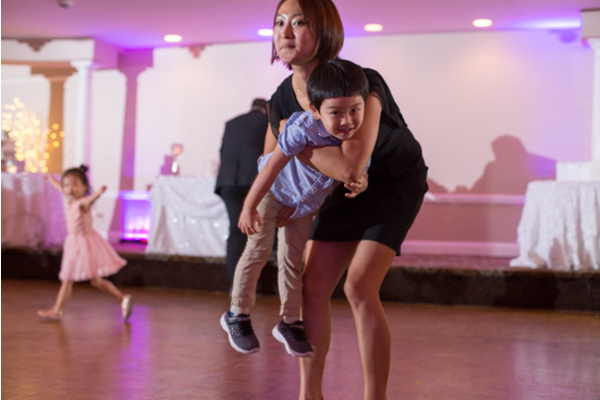 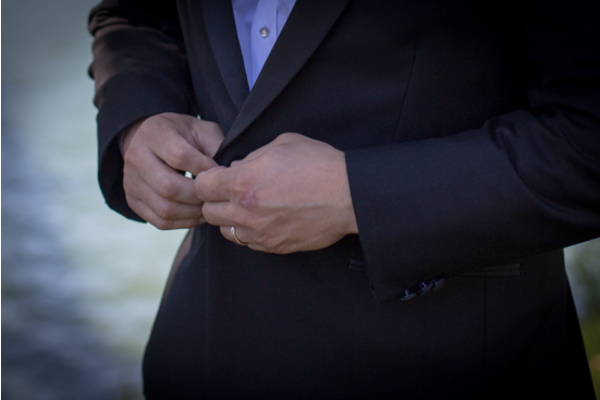 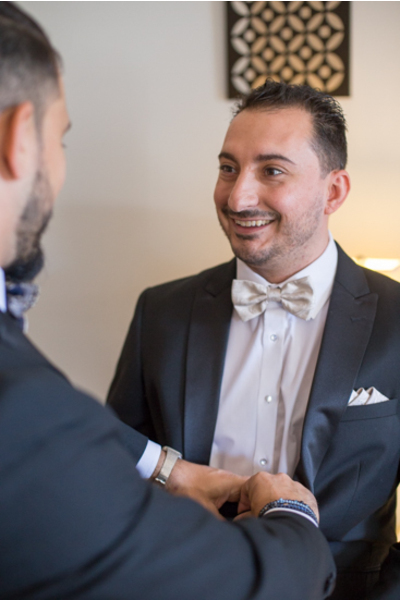 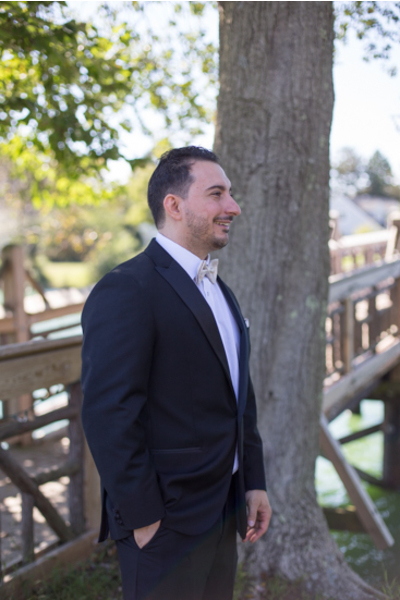 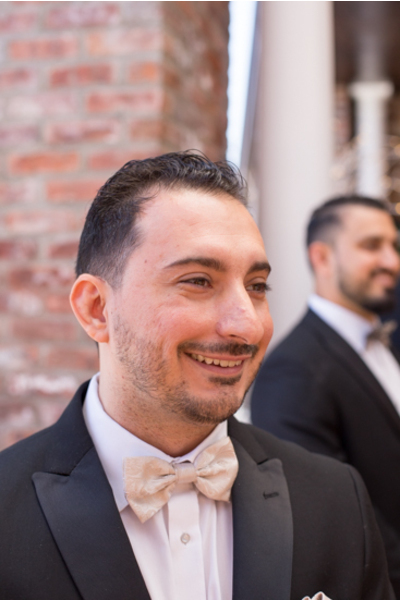 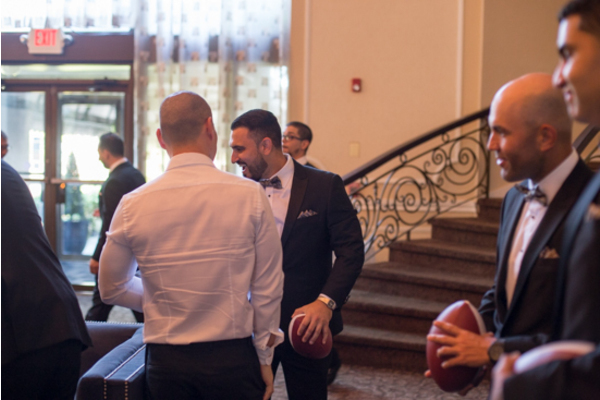 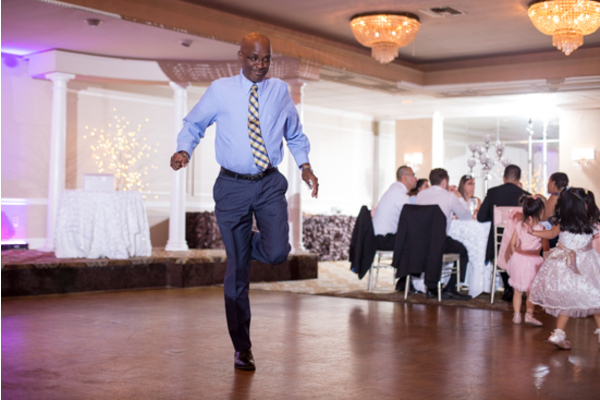 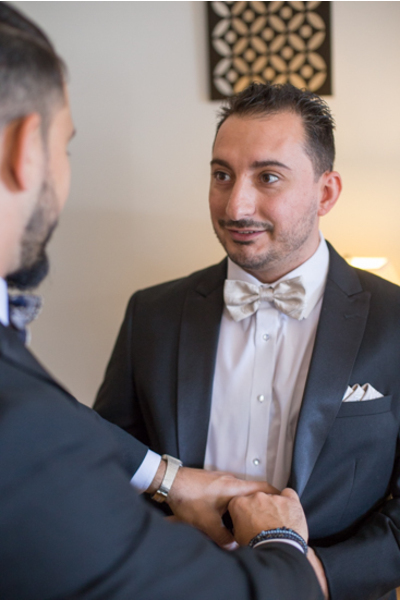 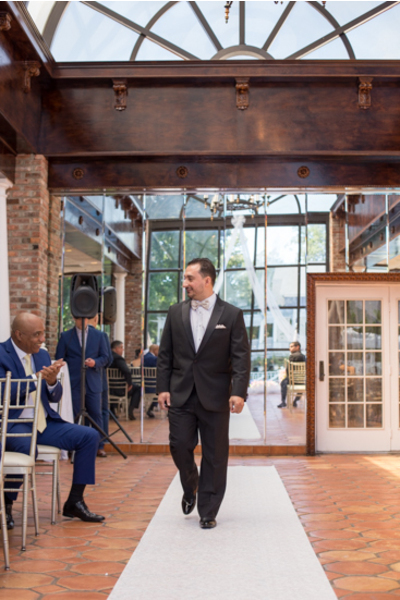 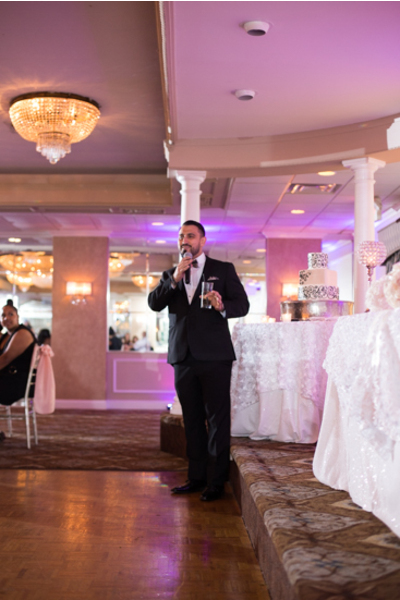 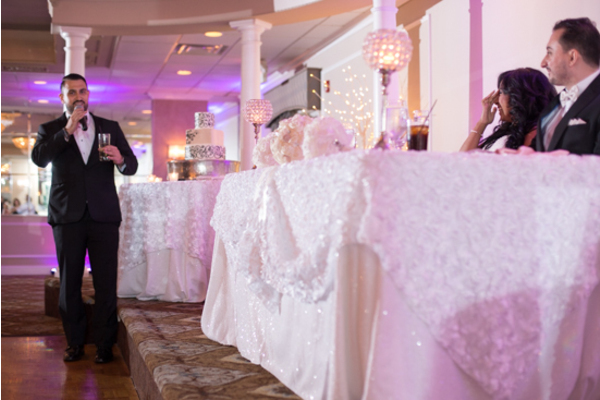 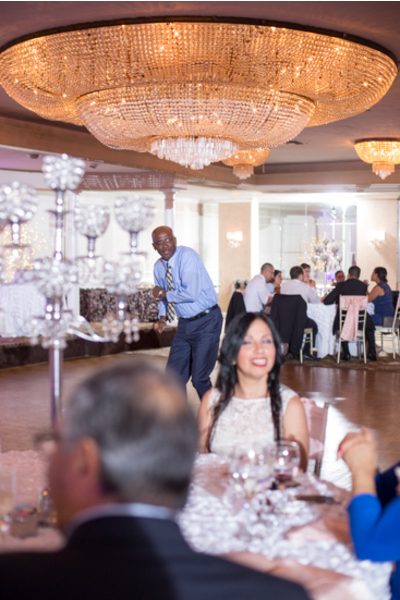 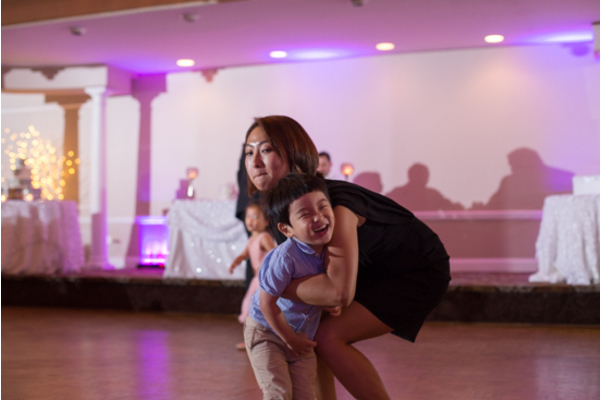 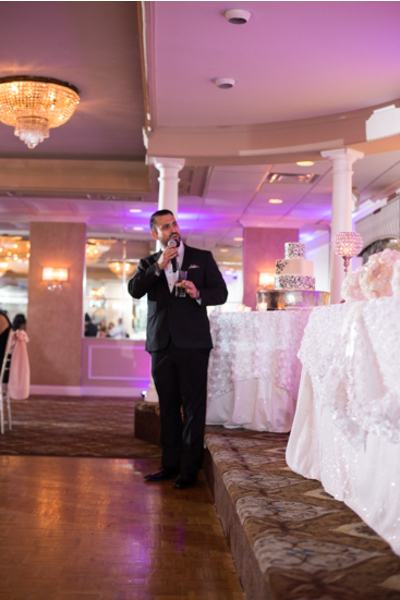 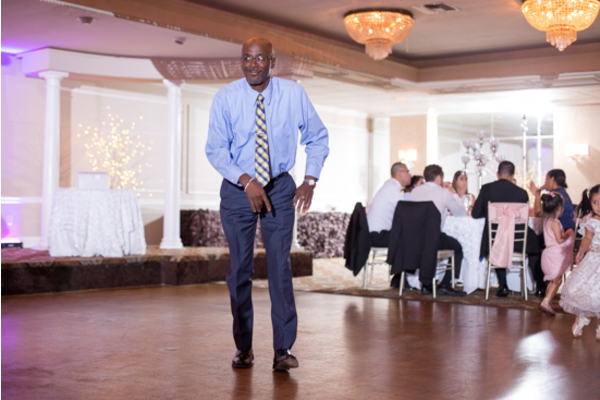 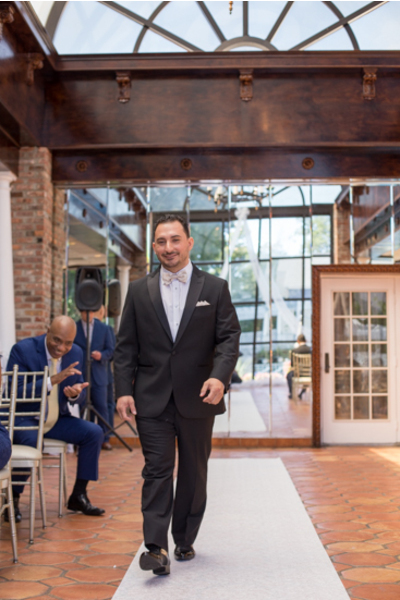 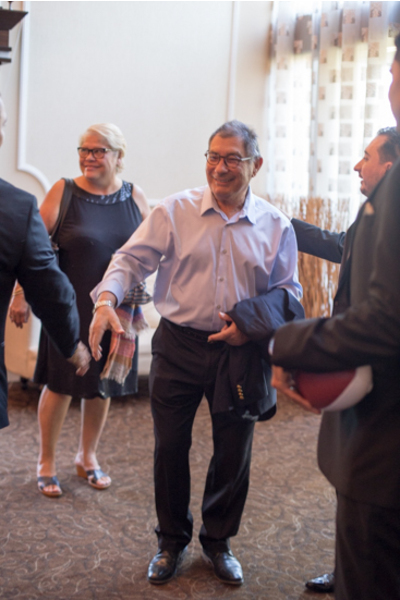 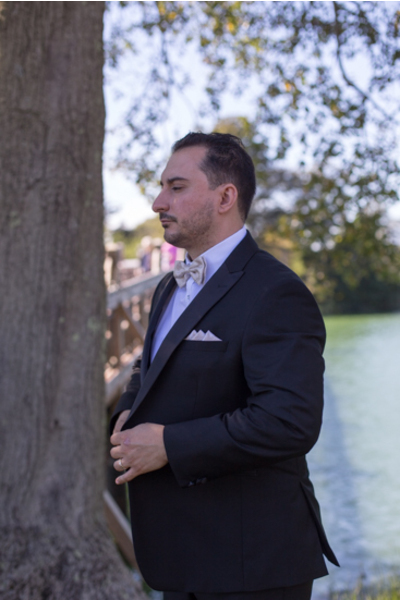 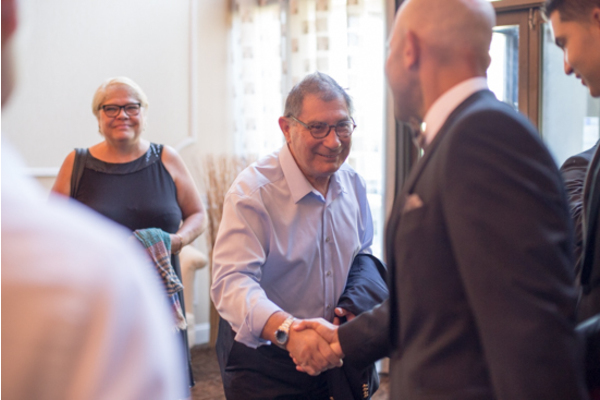 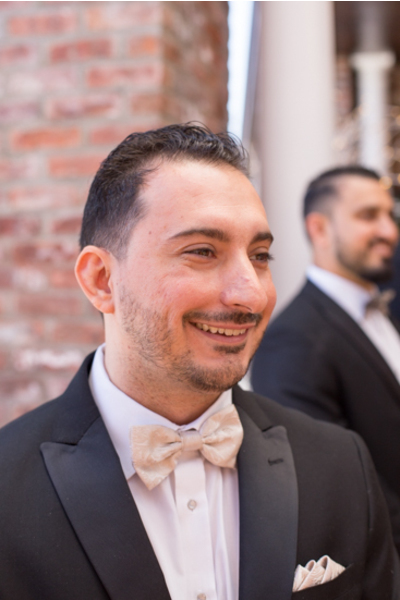 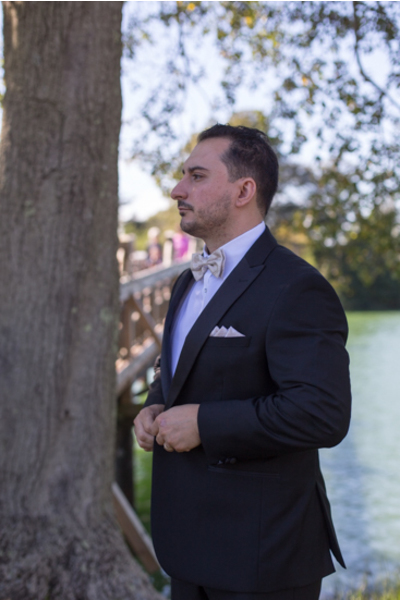 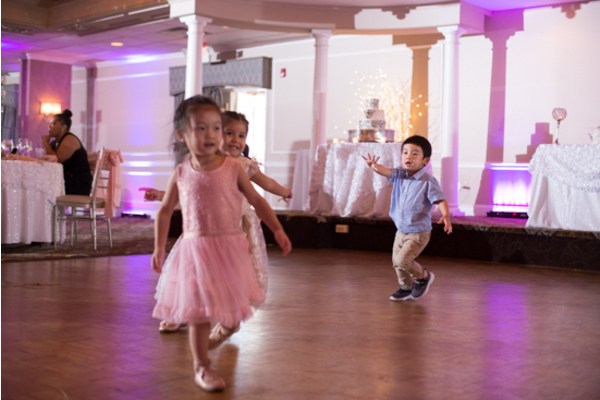 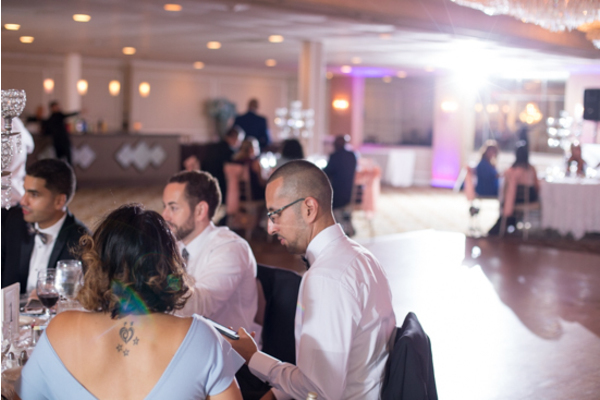 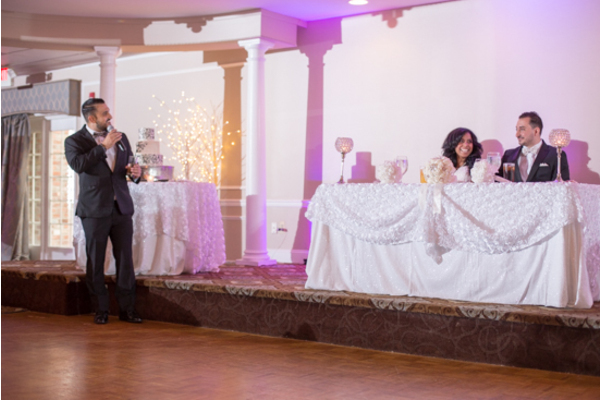 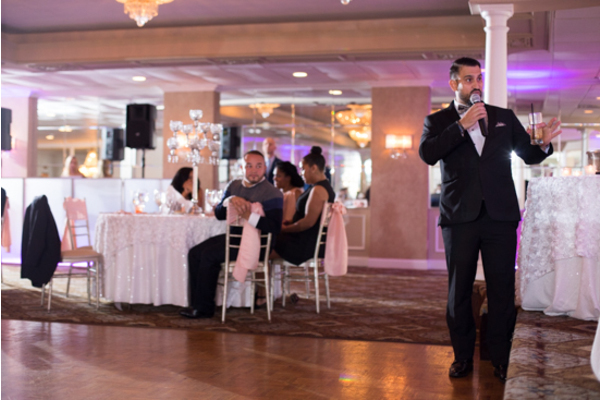 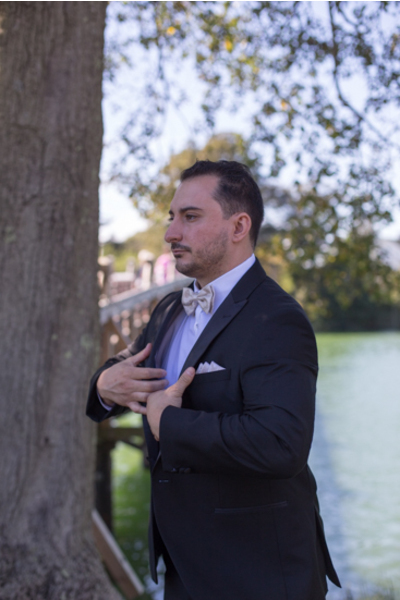 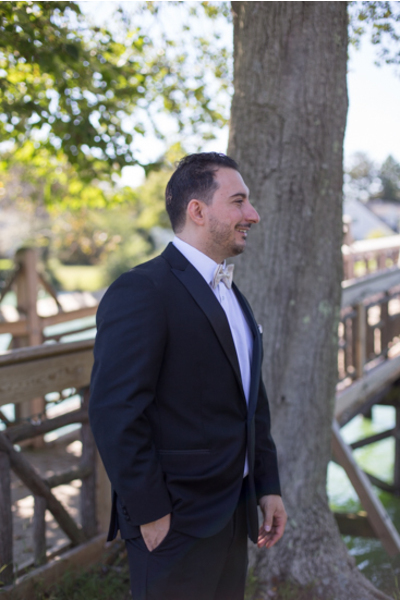 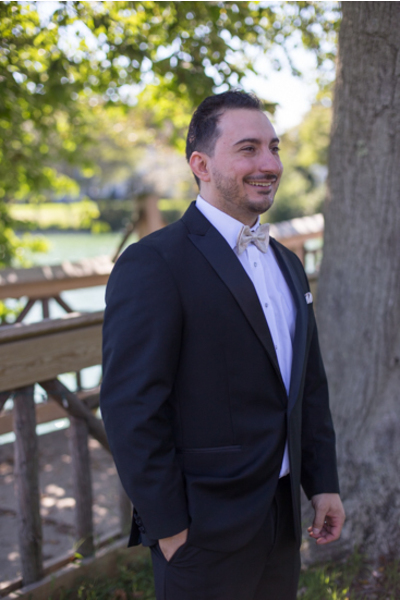 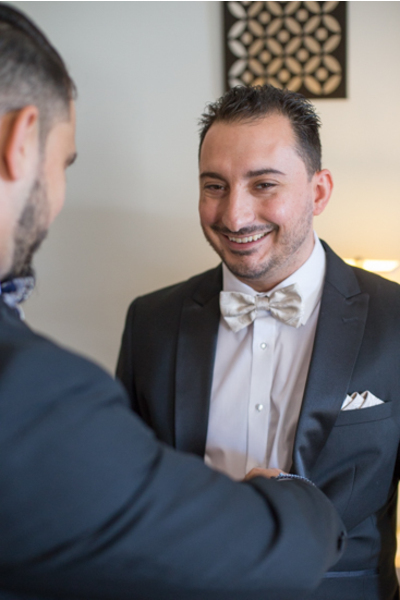 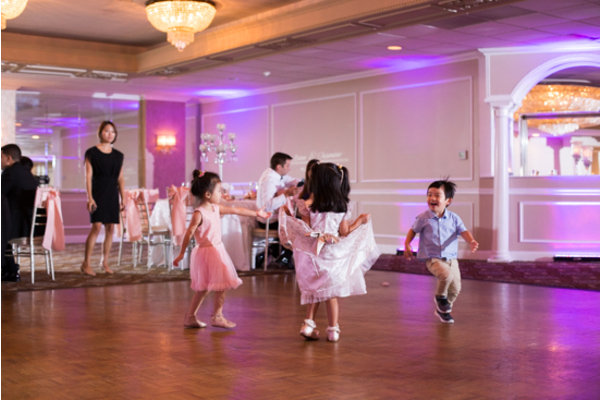 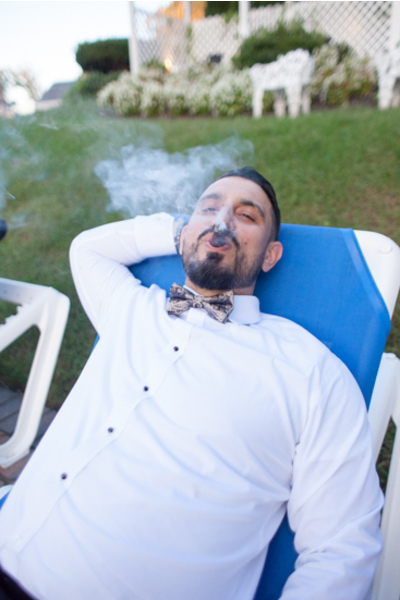 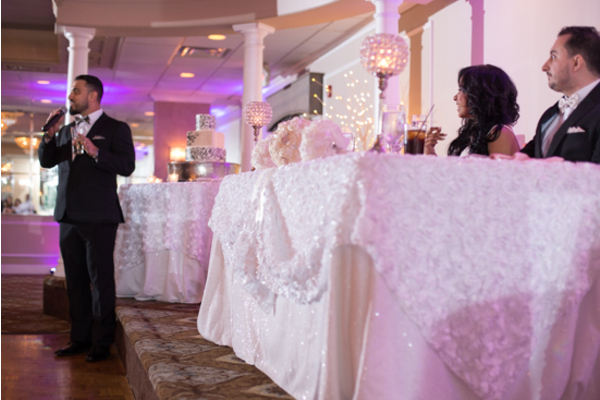 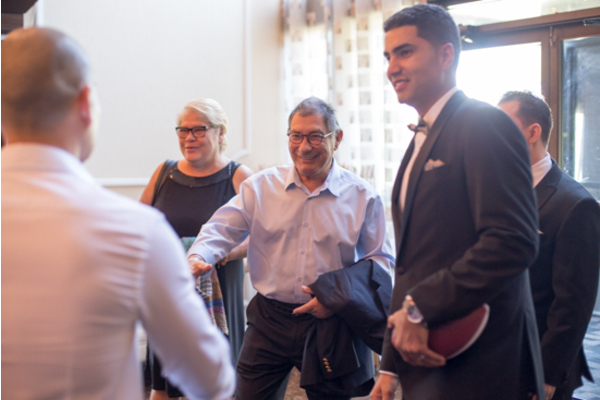 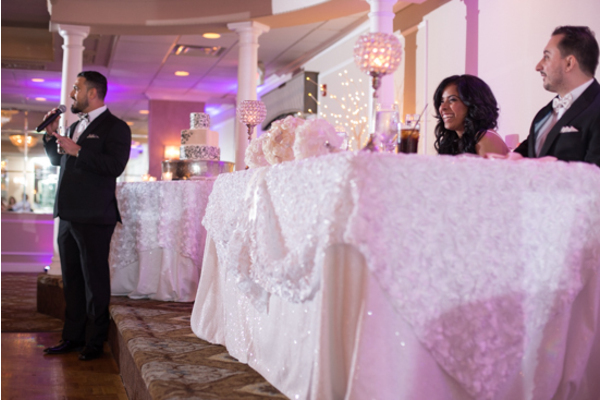 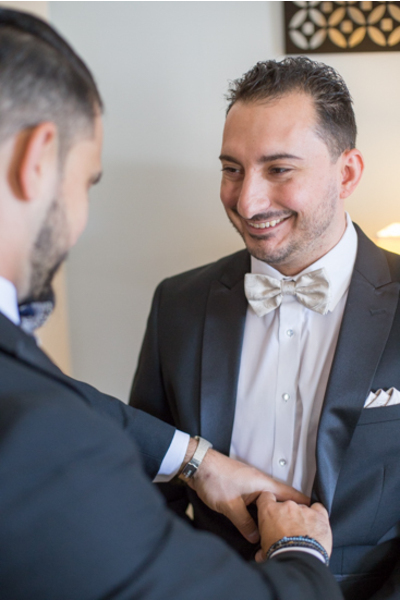 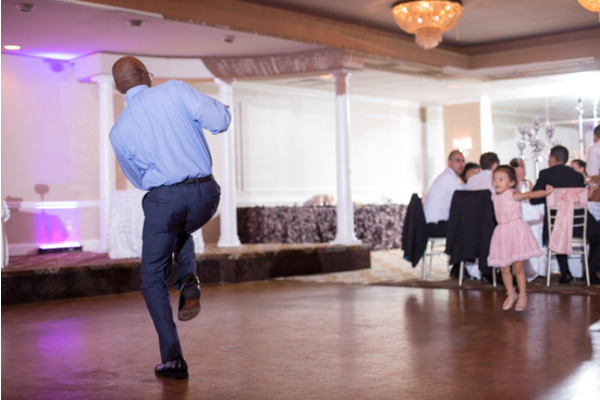 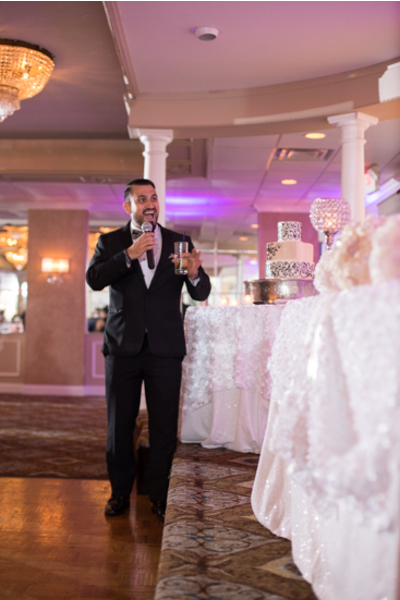 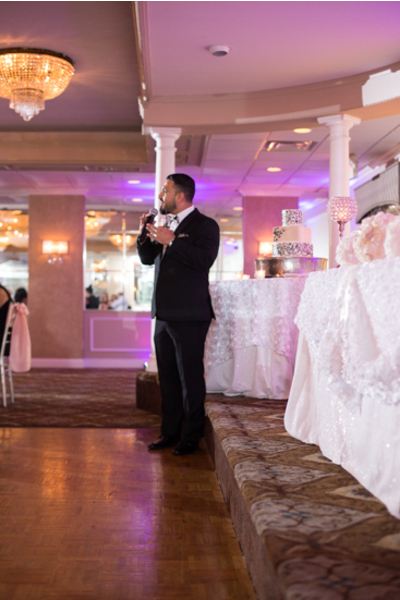 Our NJ Wedding Photographer was sure not to miss Brian’s emotional reaction when he first laid eyes on his soon-to-be wife. 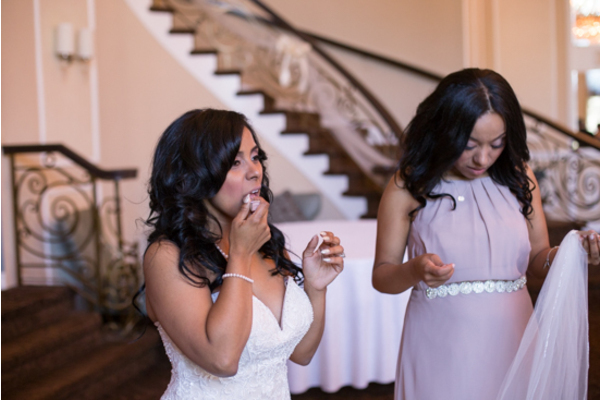 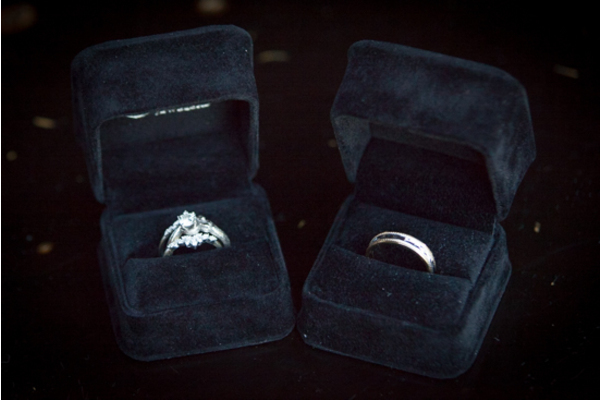 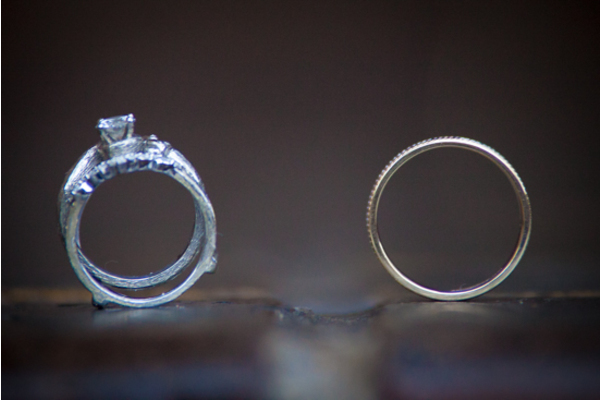 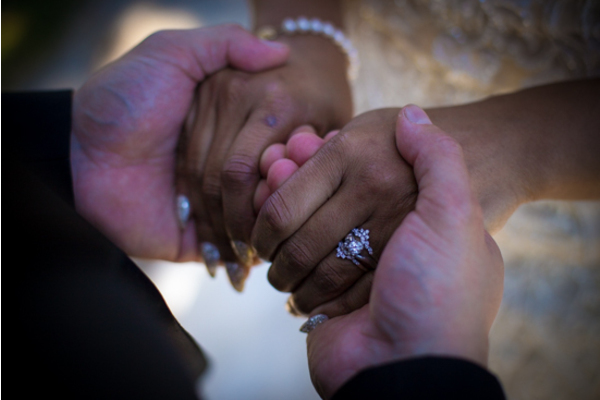 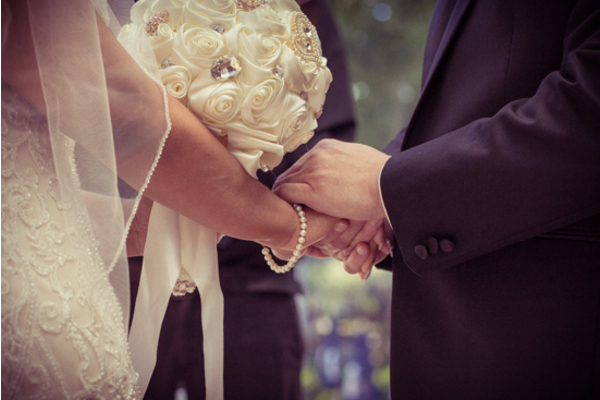 The couple read their vows then placed their rings on each others fingers, and sealed their love with a kiss! 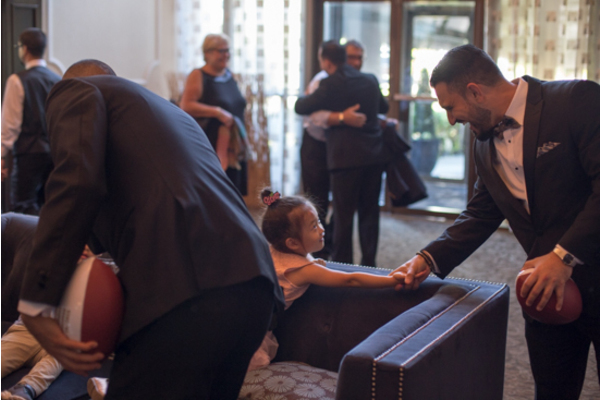 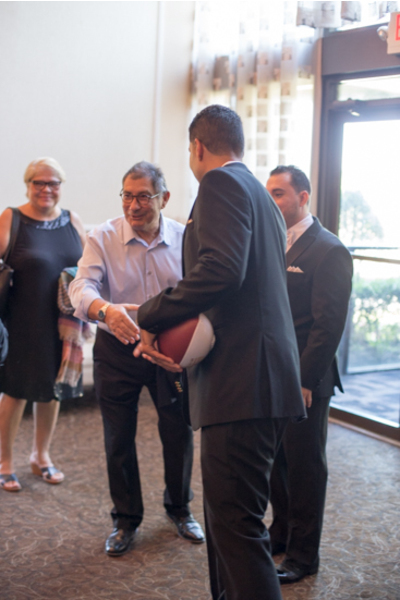 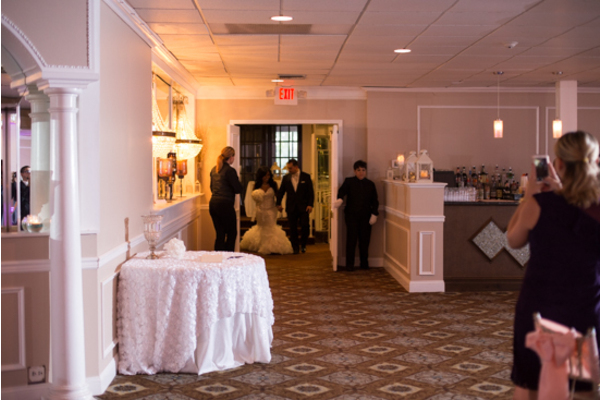 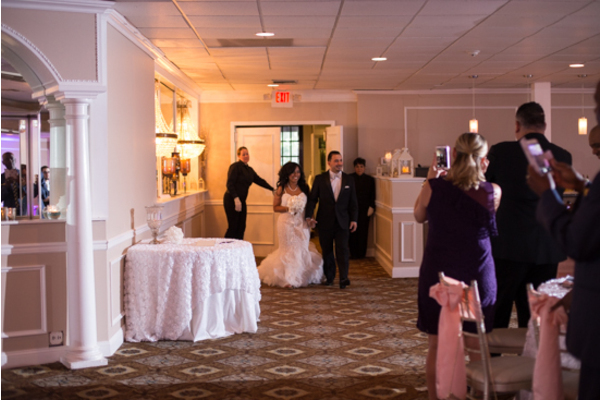 After it was official, the bridal party headed to the hallway and cheered to the newlyweds! 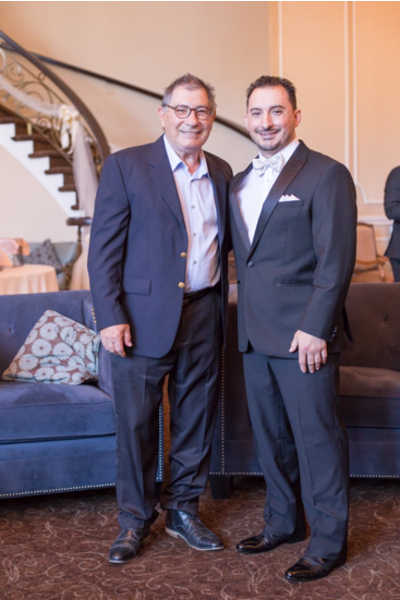 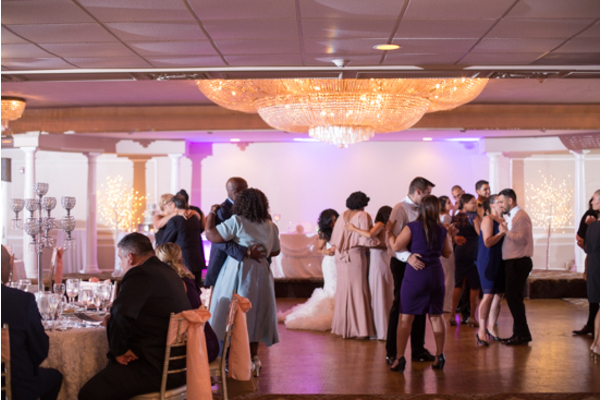 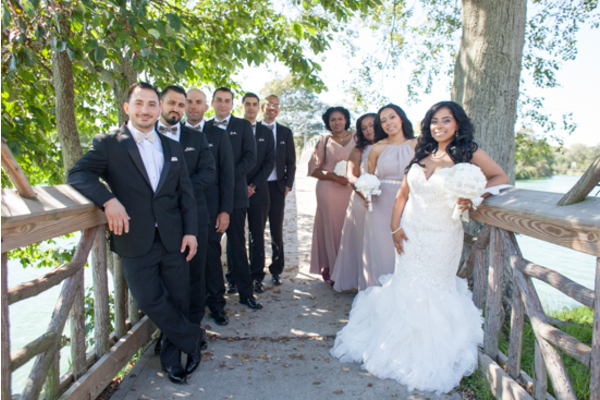 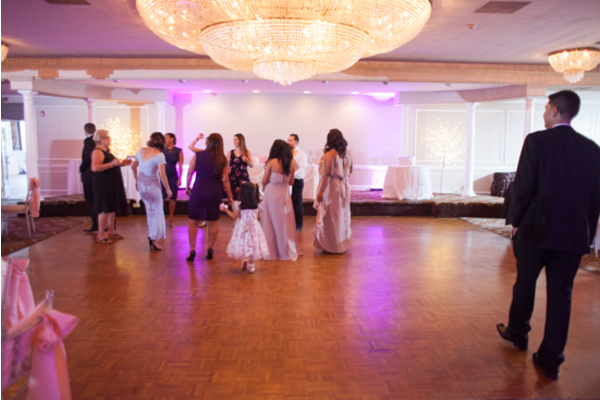 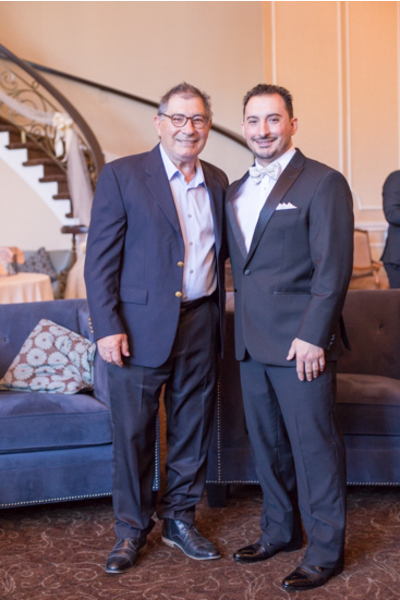 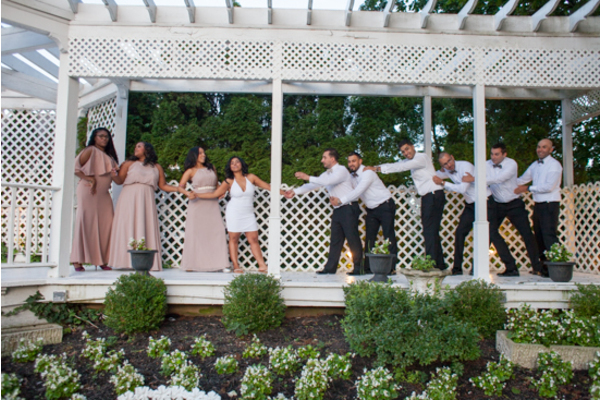 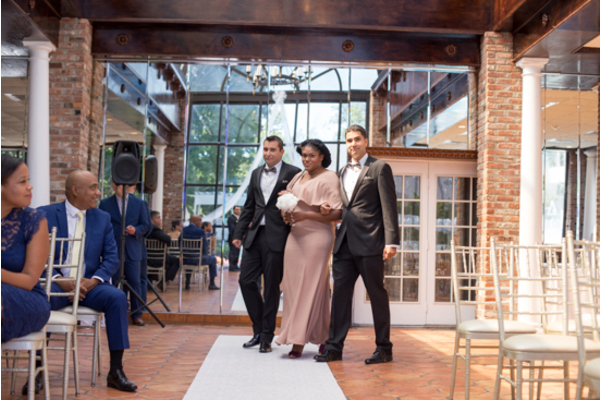 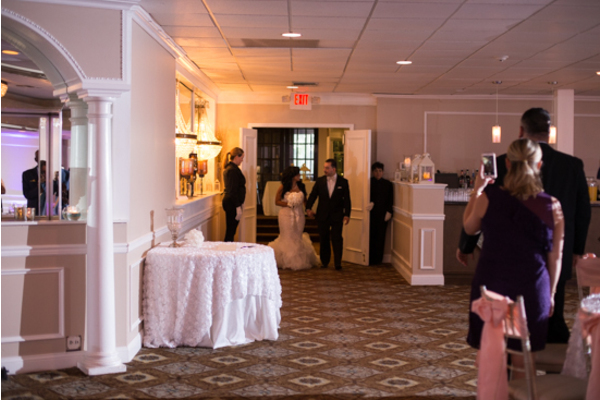 Friends and family posed with our NJ Wedding Photographer before entering the stunning reception! 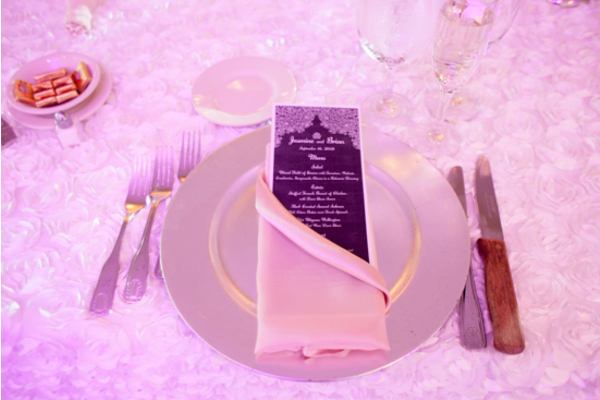 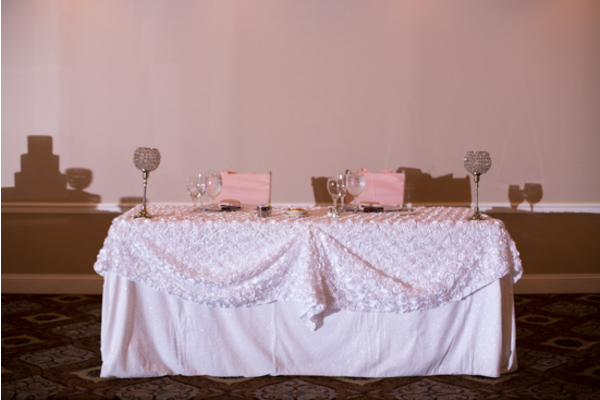 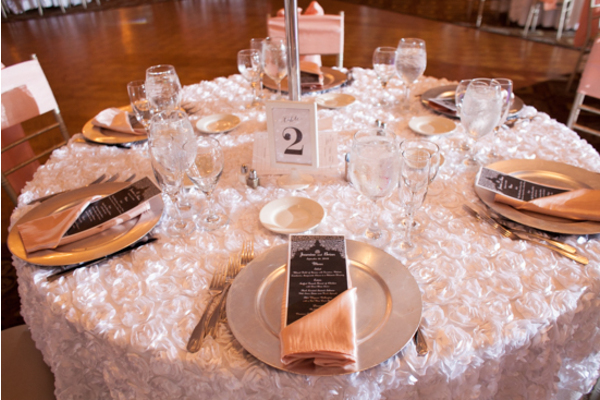 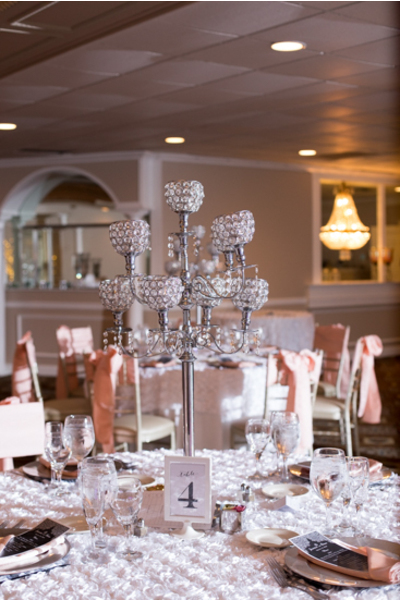 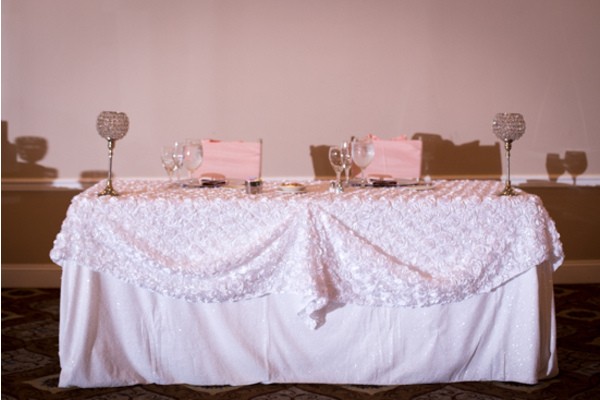 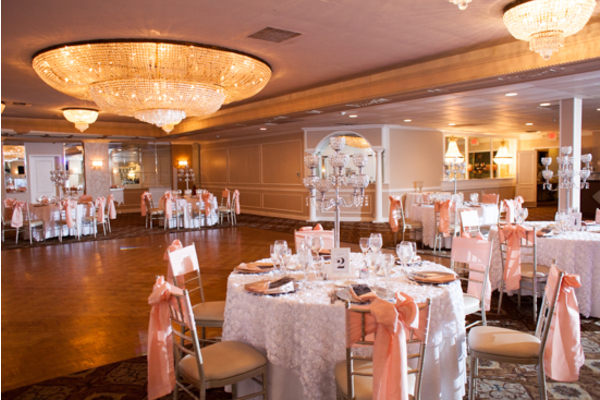 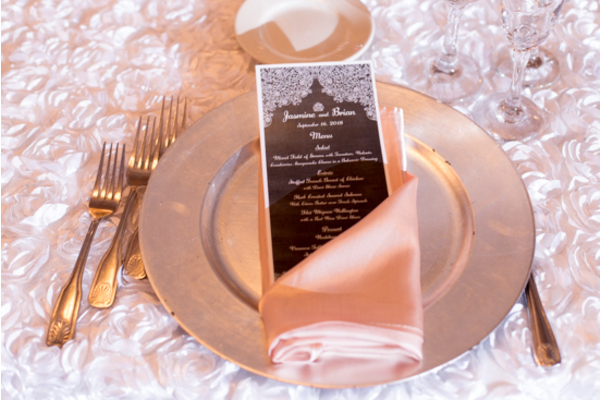 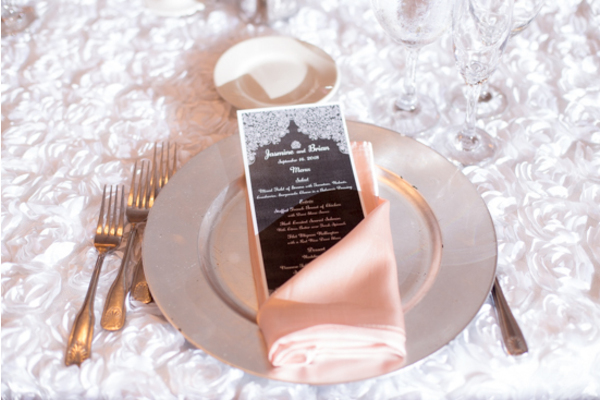 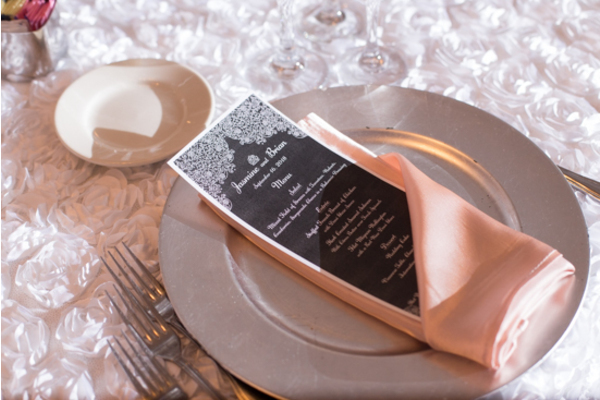 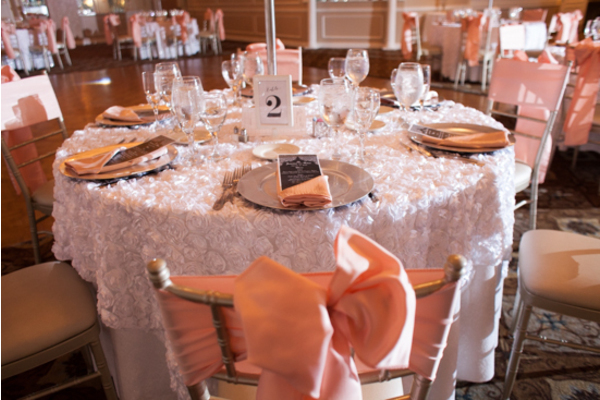 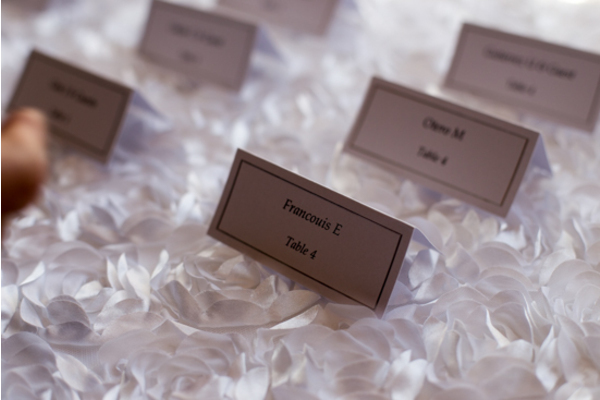 Salmon color napkins covered the white floral tables! 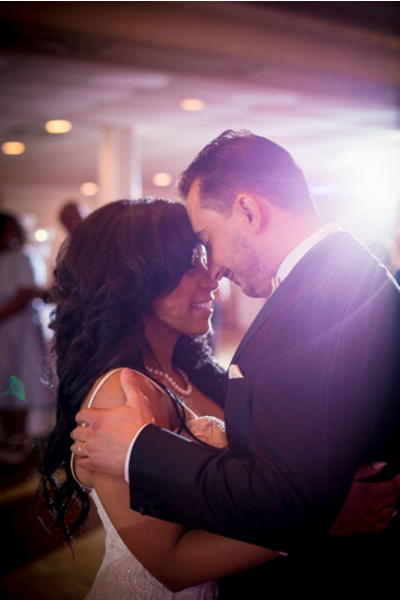 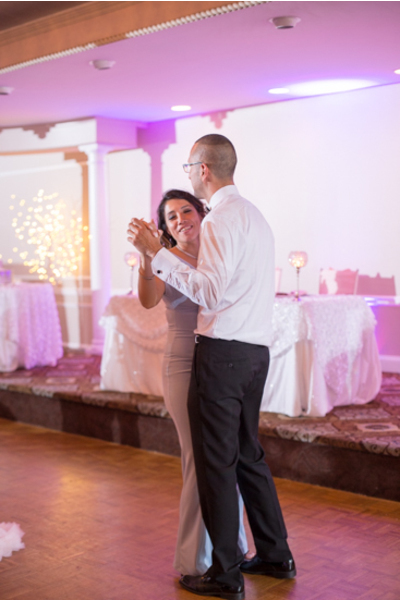 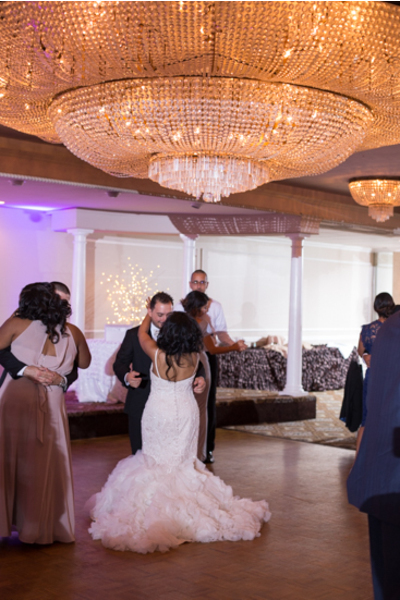 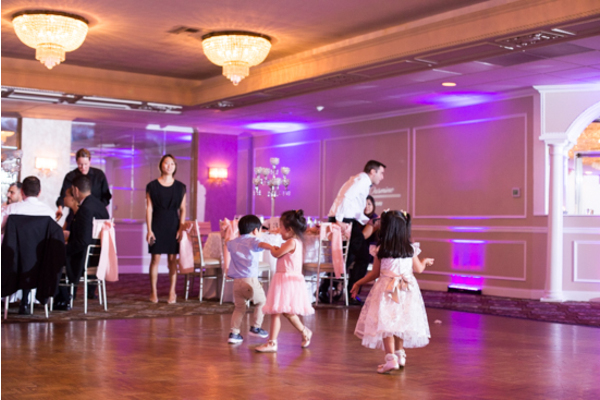 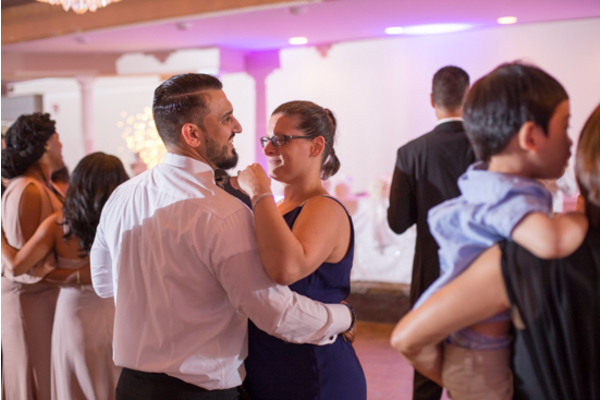 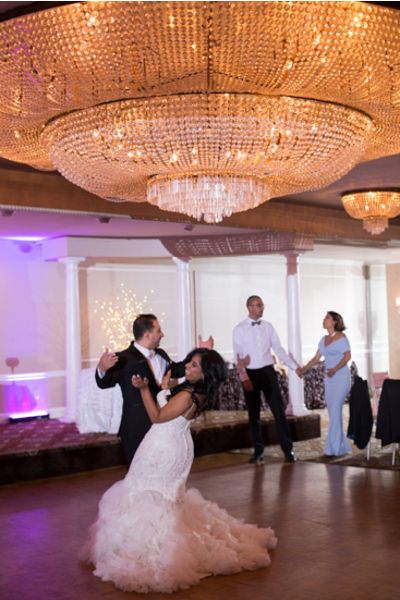 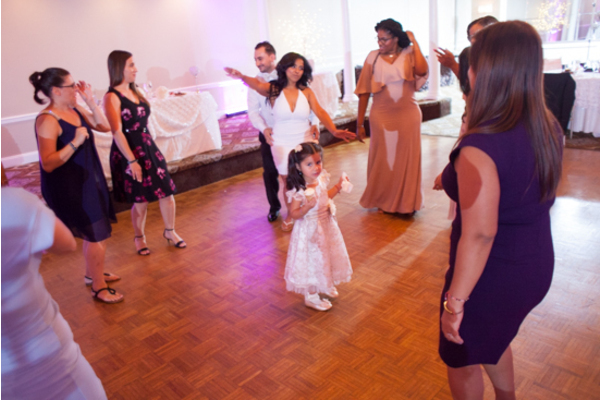 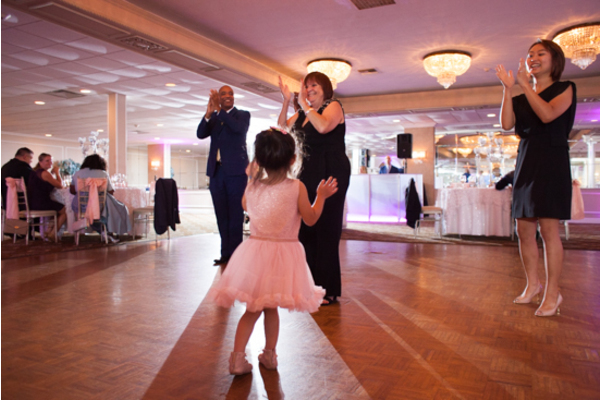 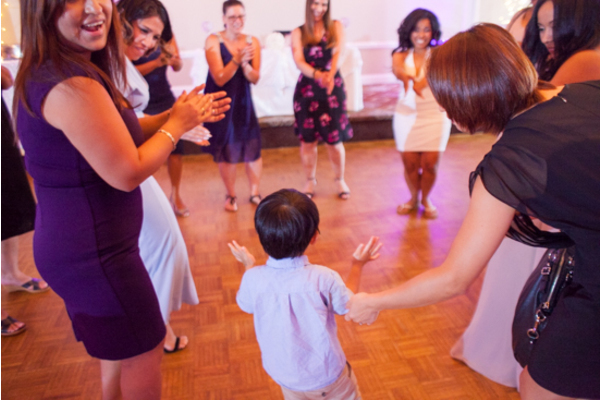 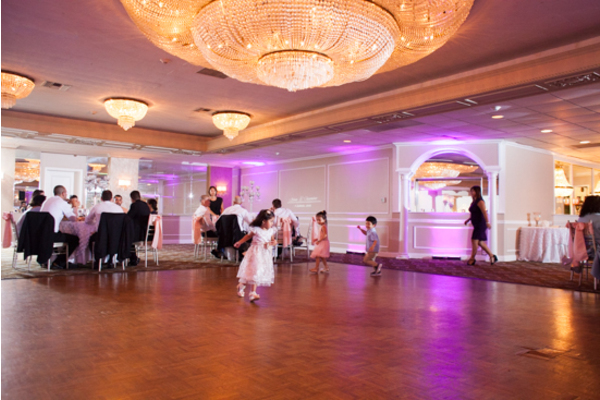 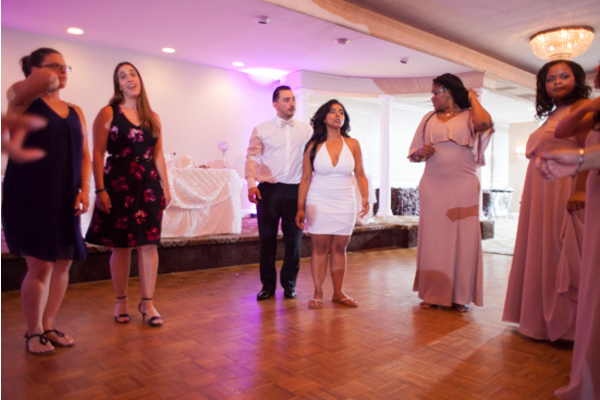 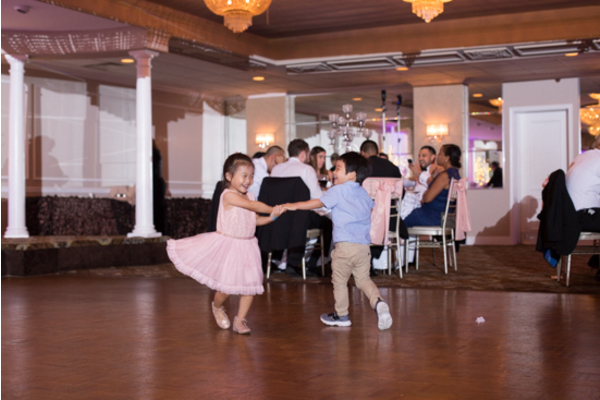 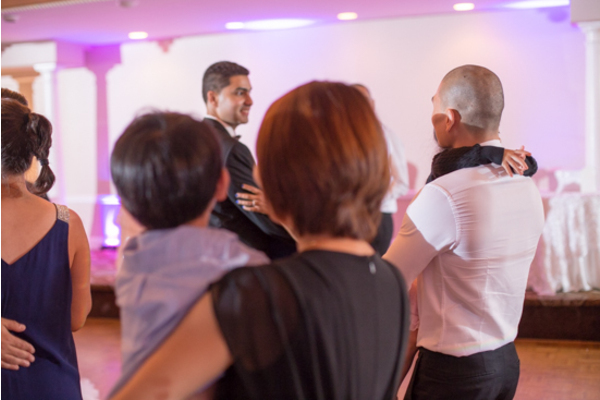 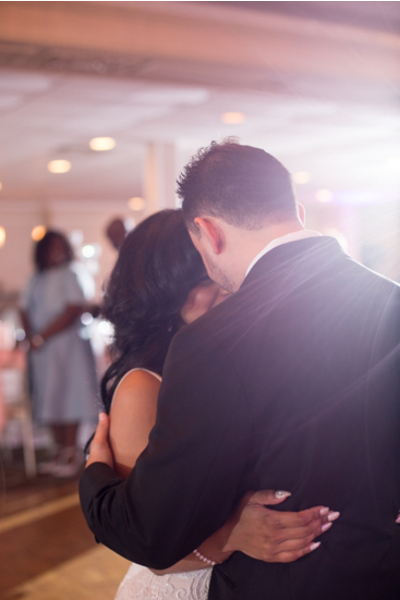 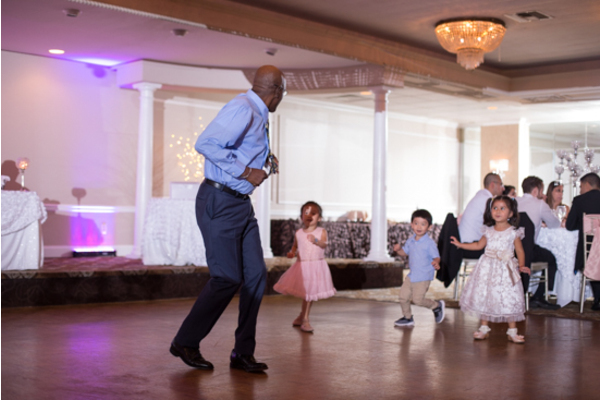 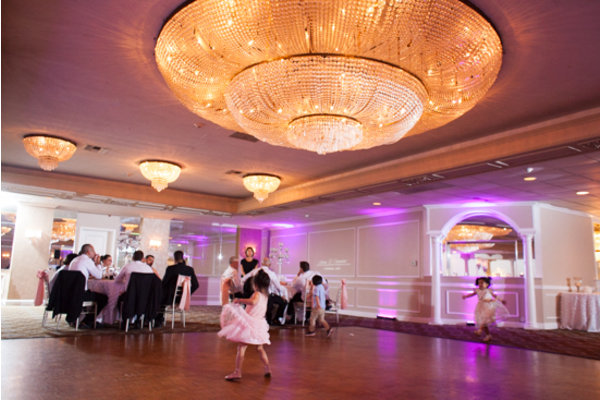 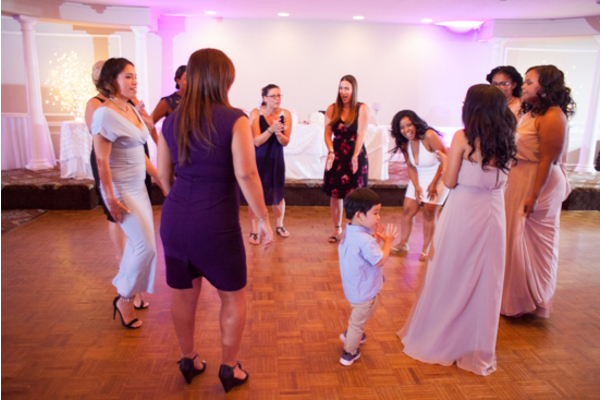 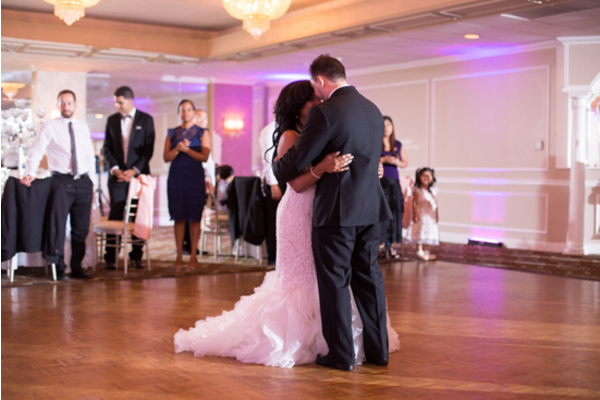 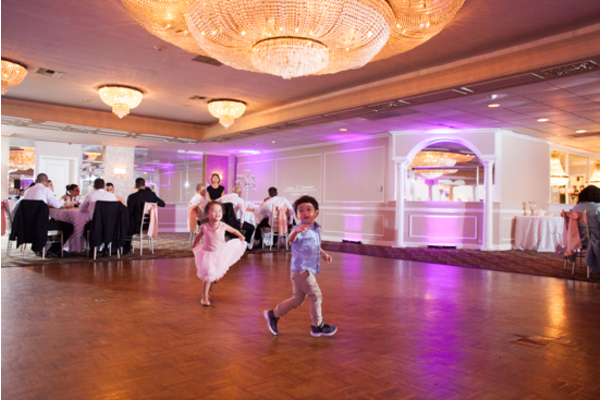 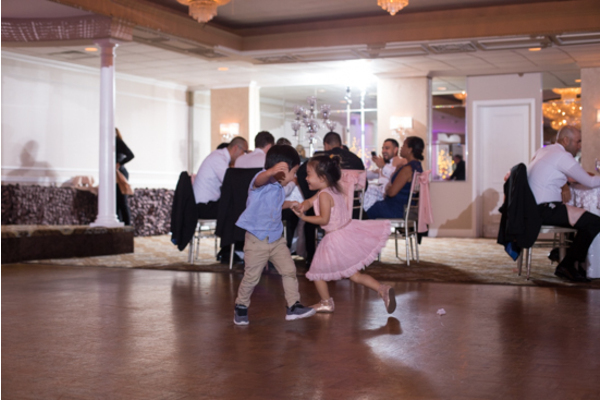 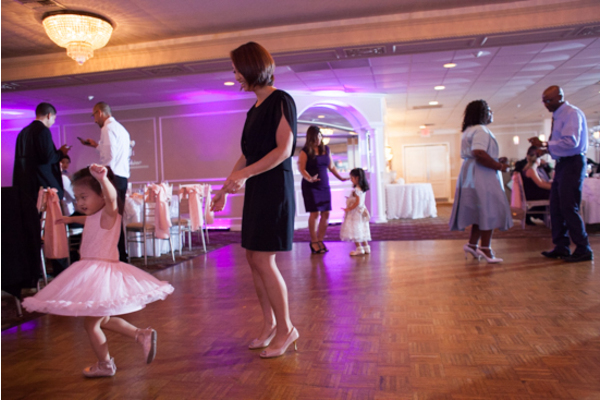 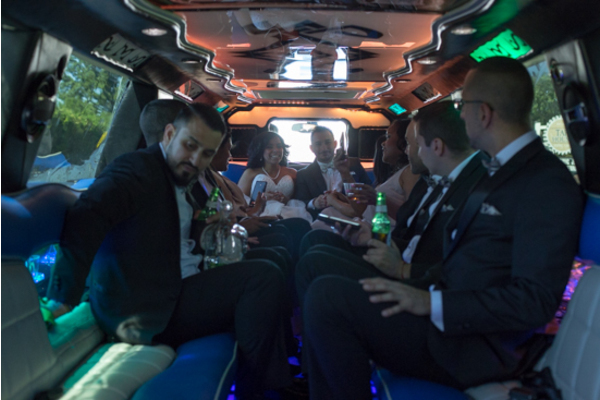 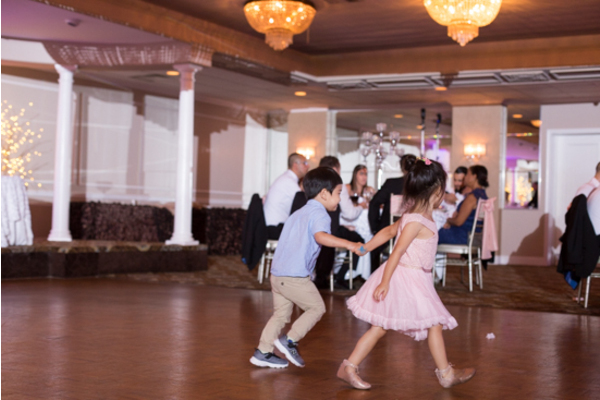 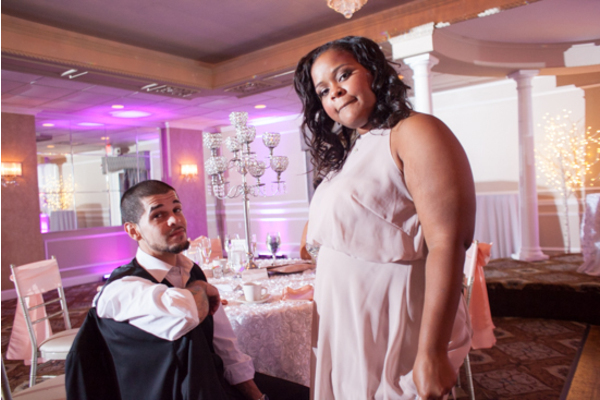 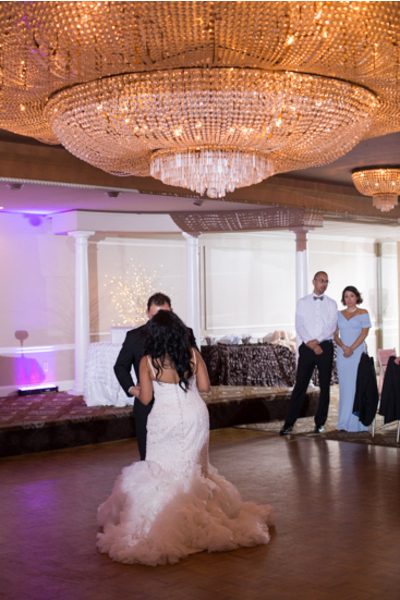 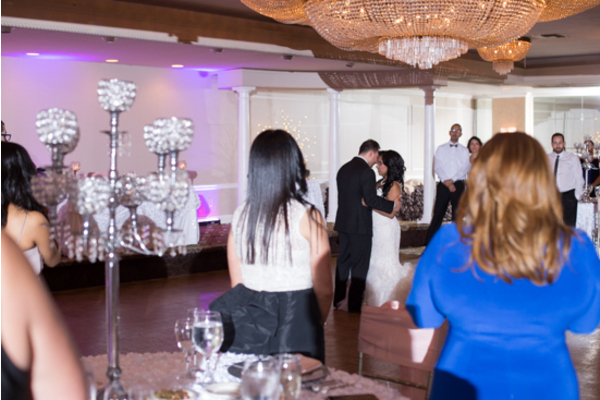 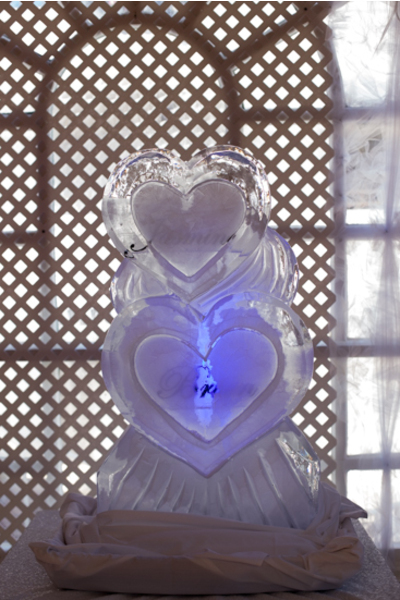 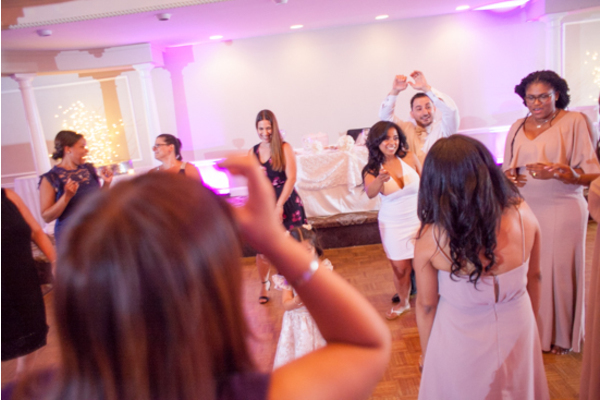 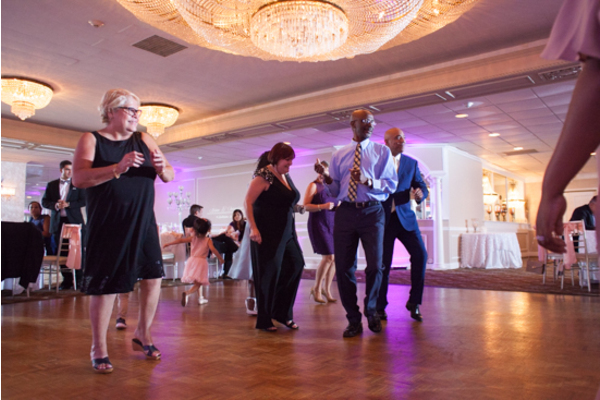 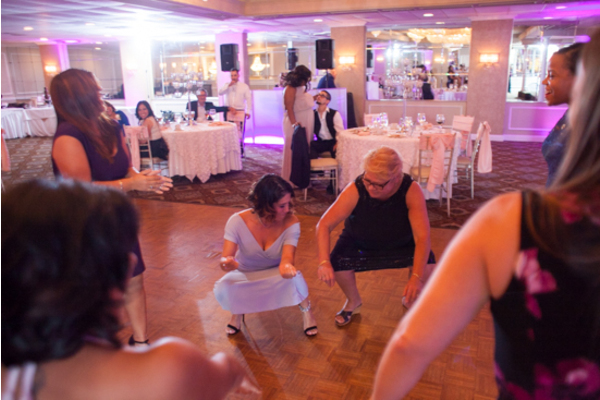 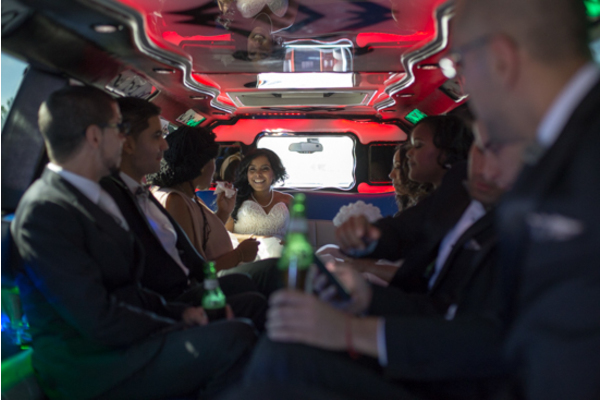 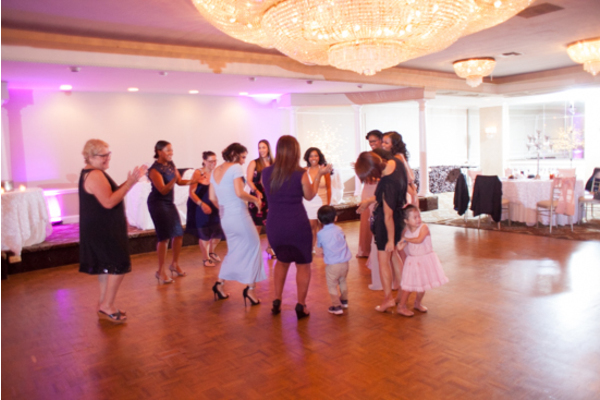 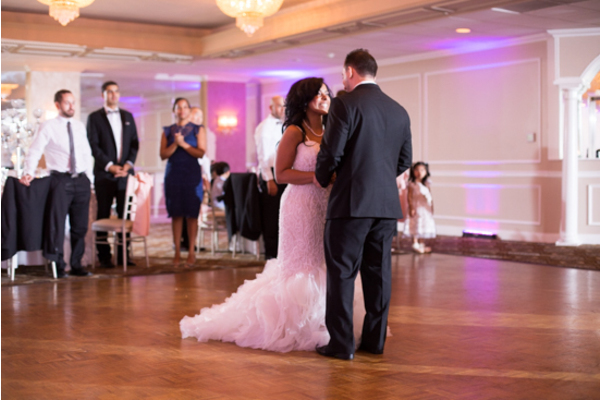 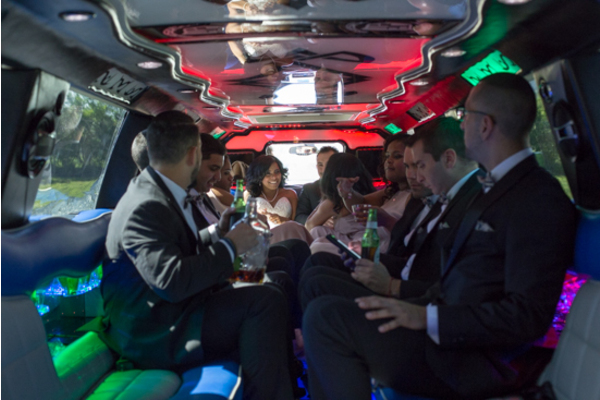 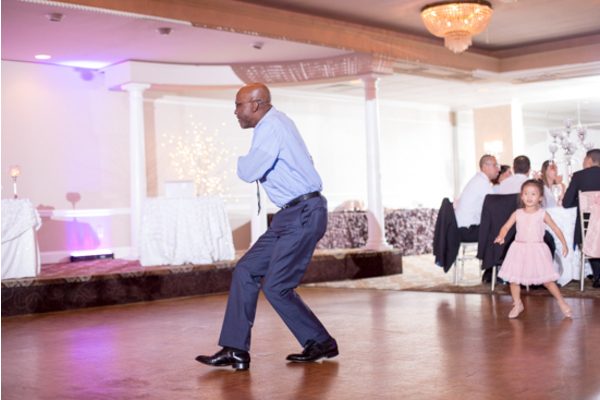 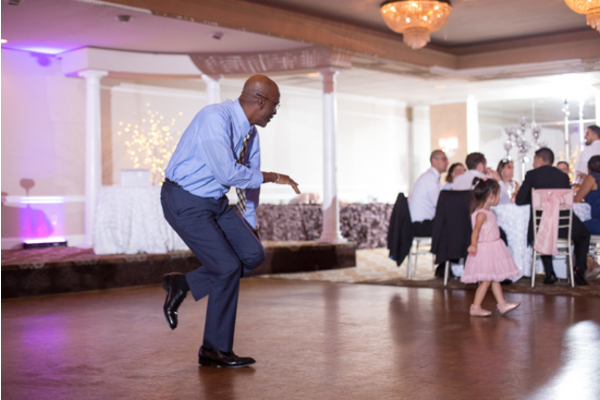 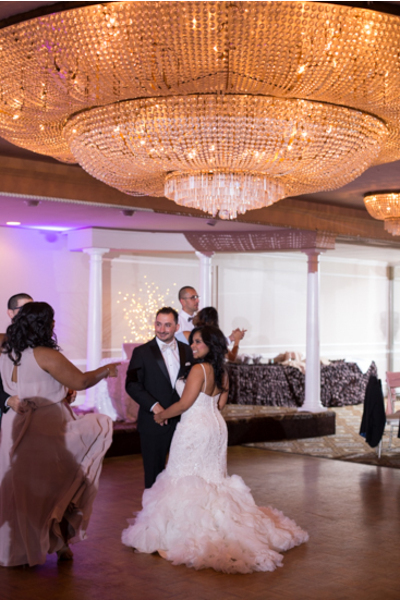 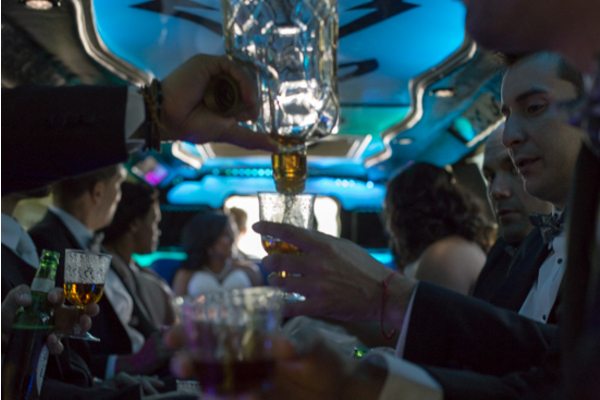 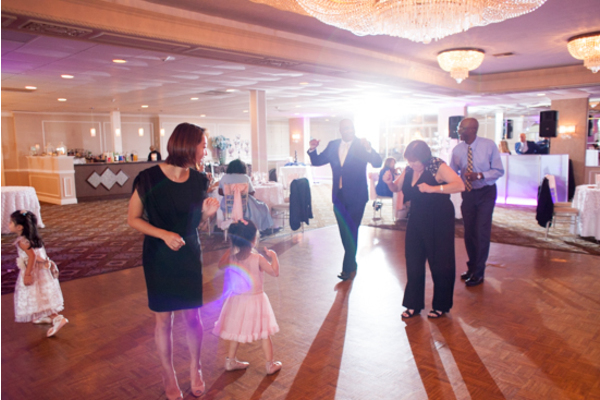 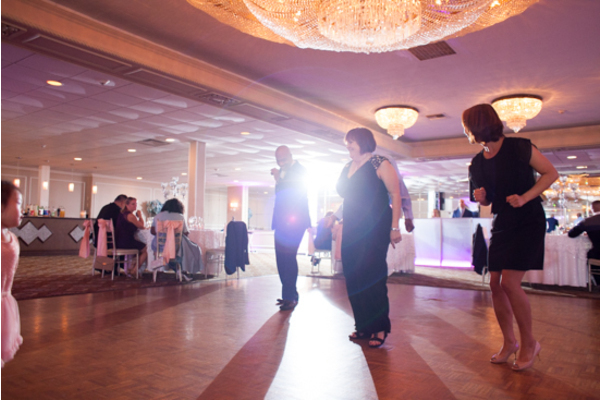 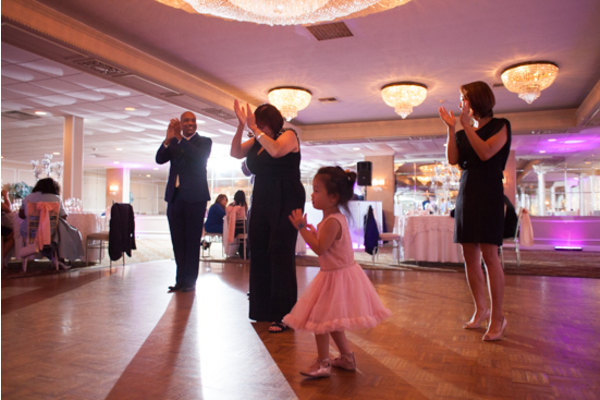 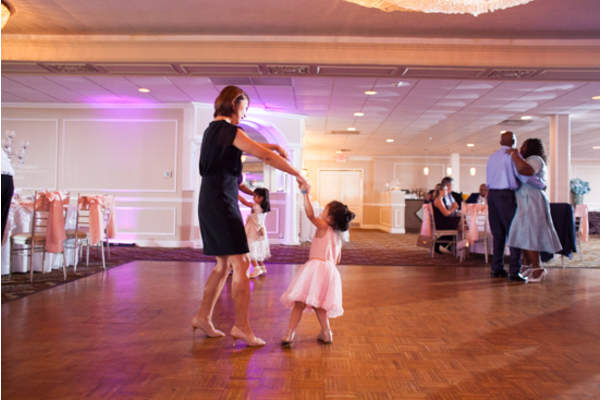 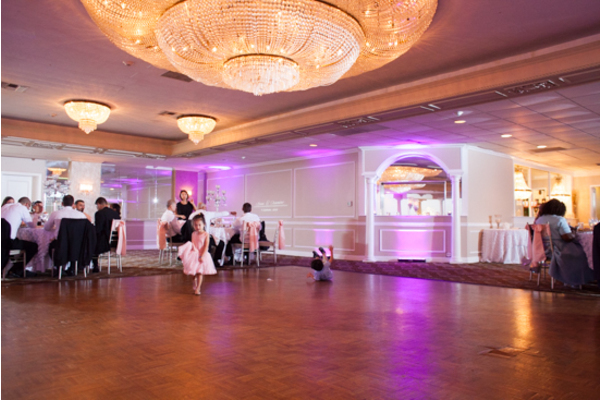 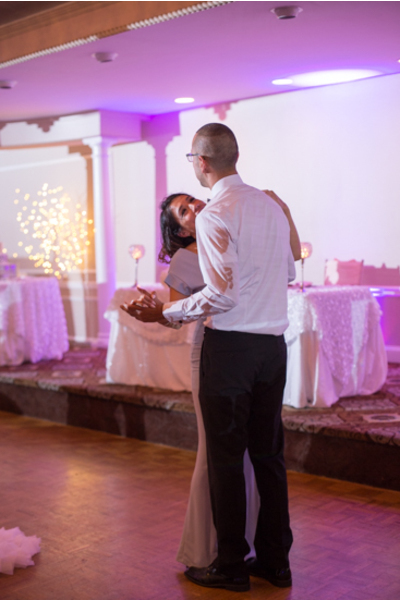 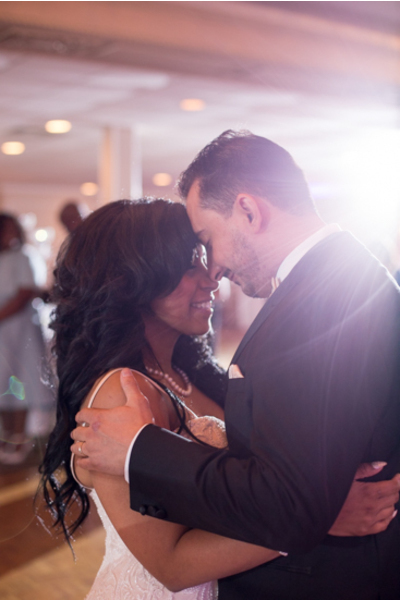 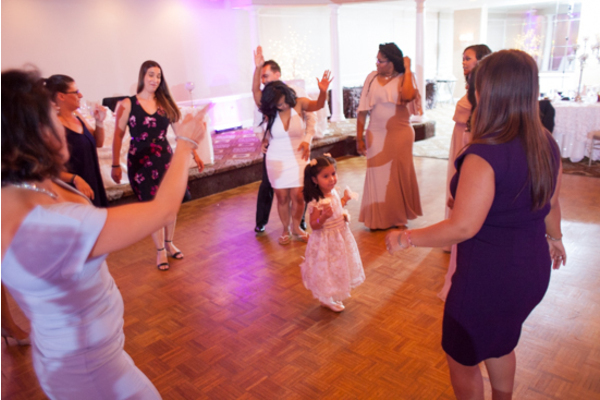 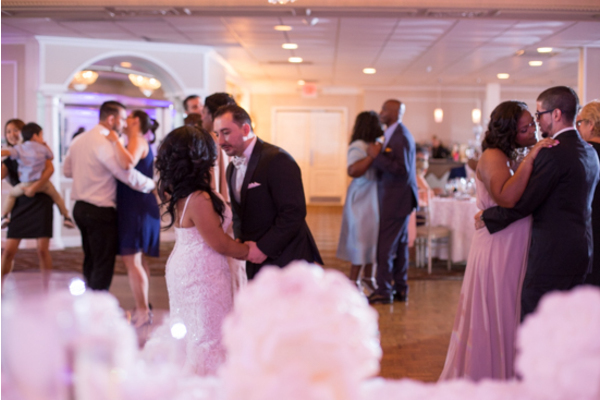 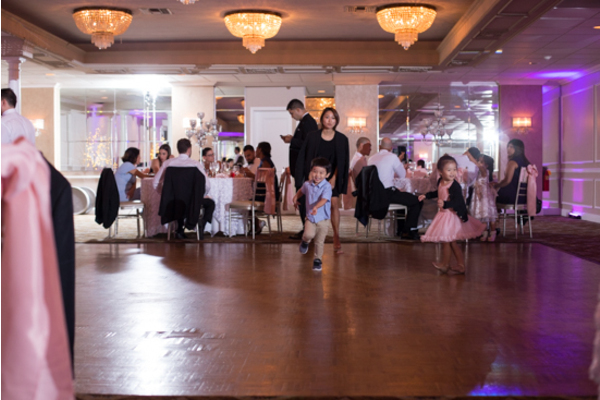 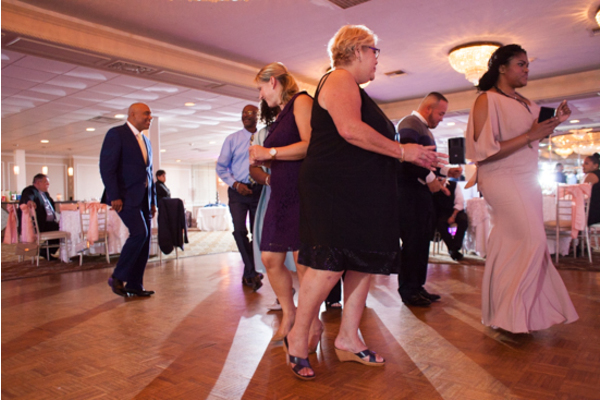 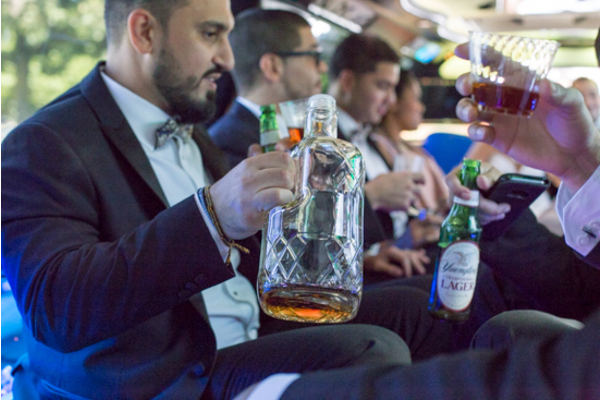 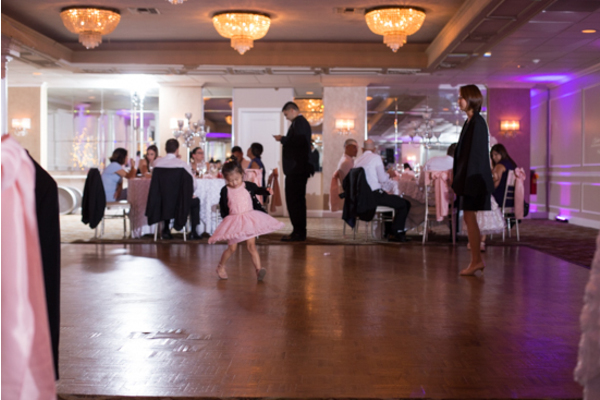 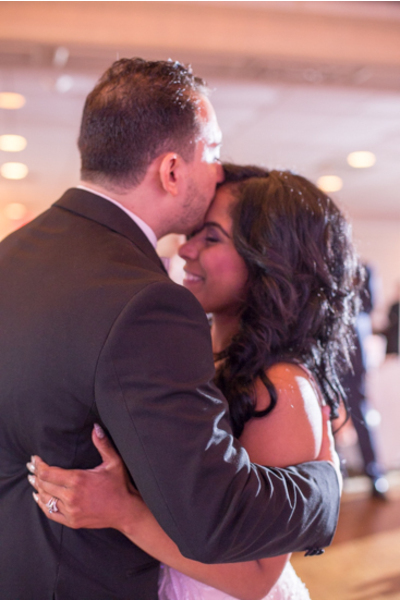 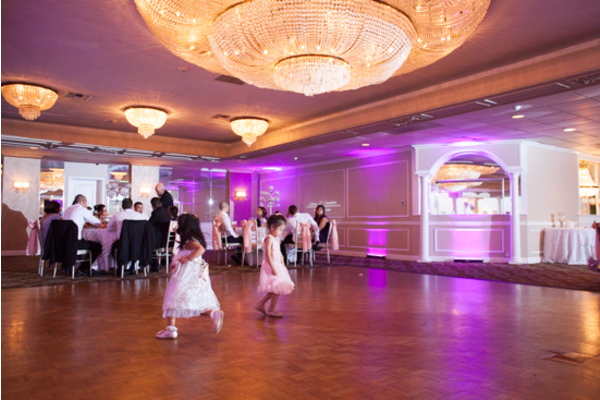 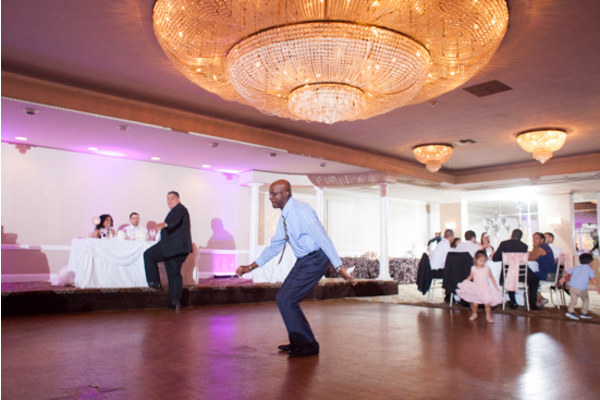 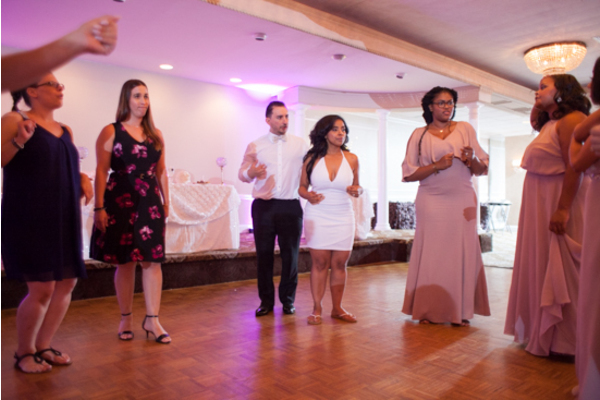 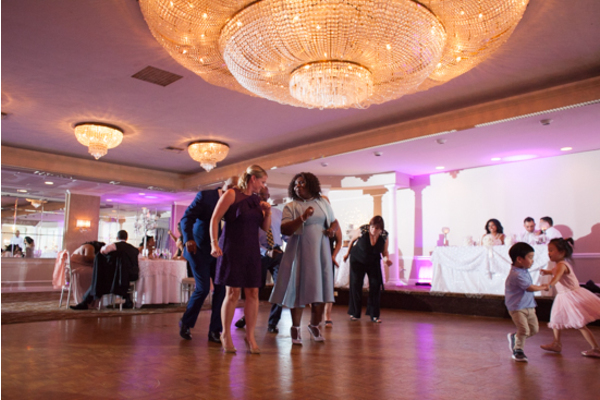 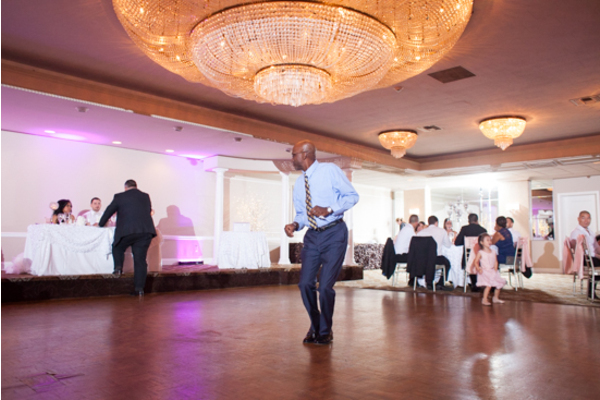 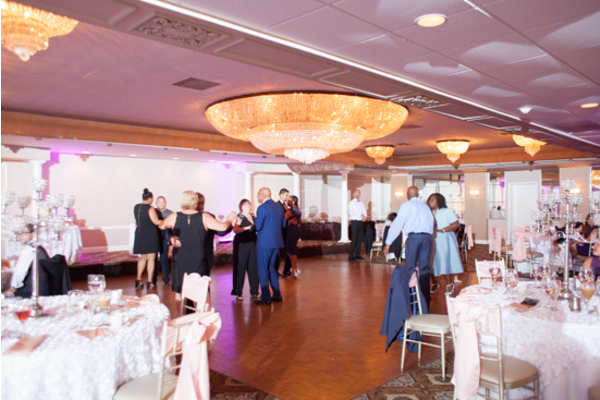 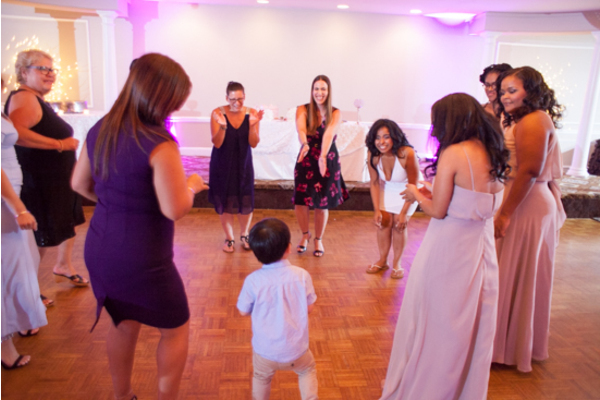 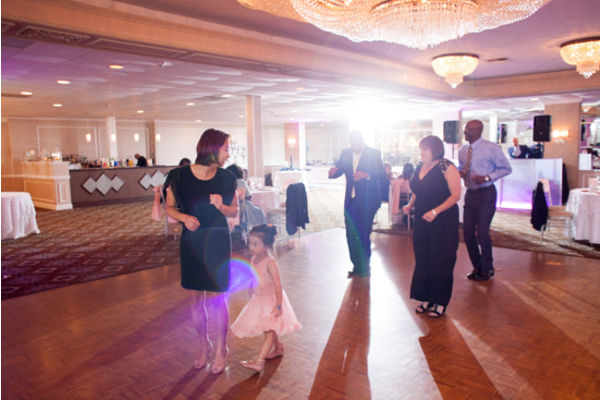 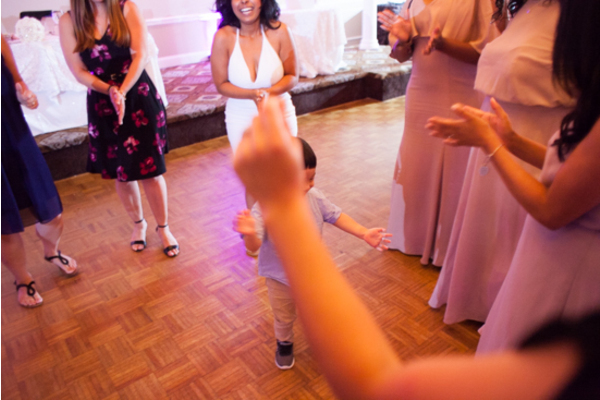 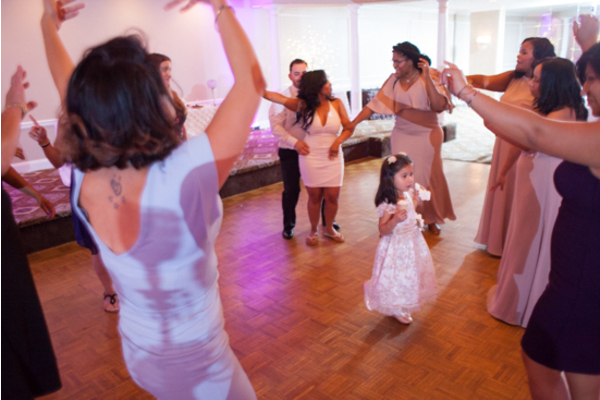 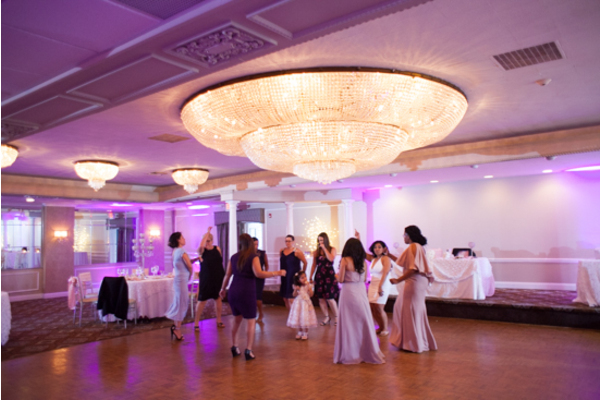 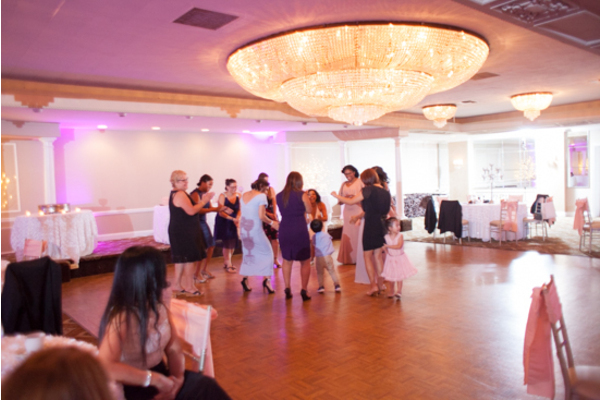 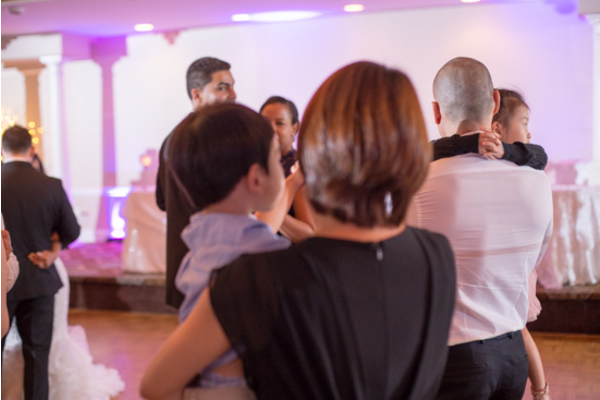 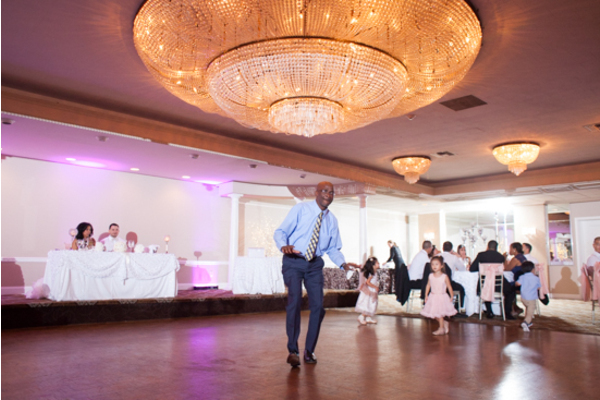 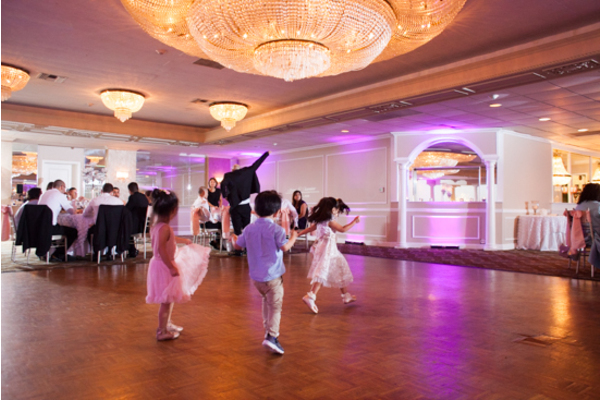 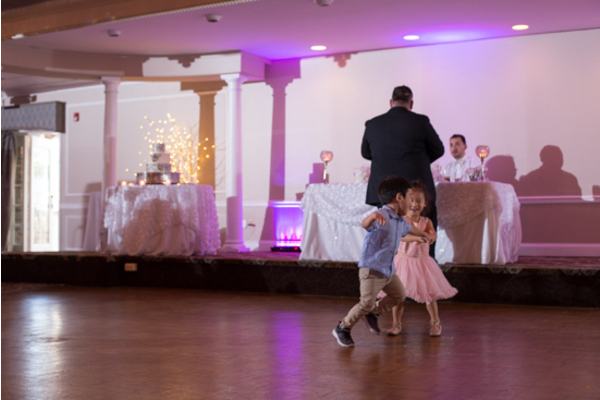 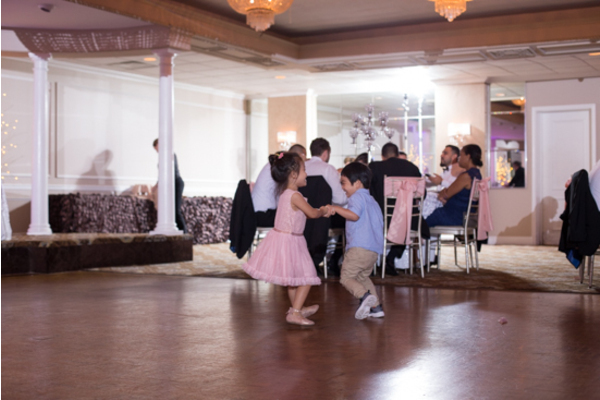 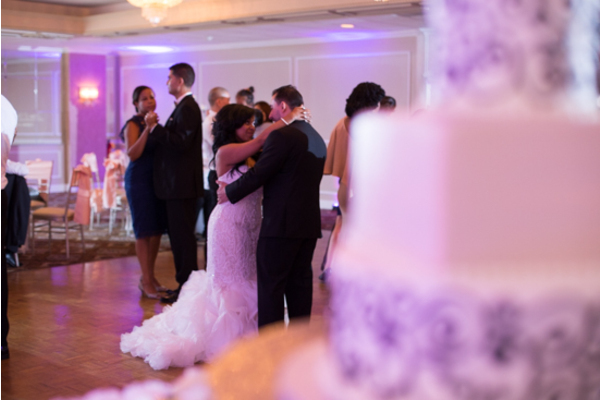 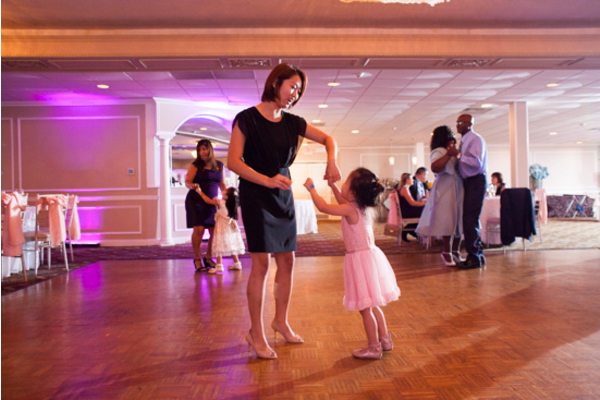 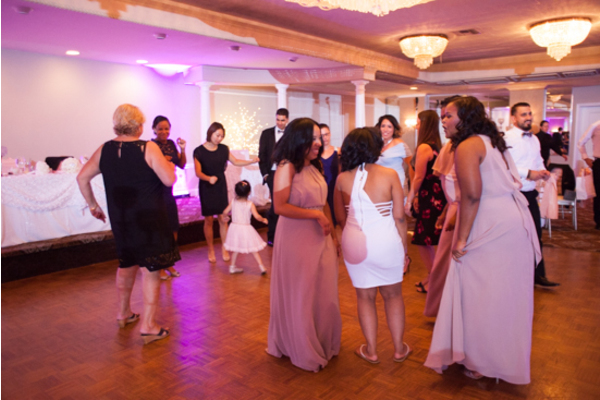 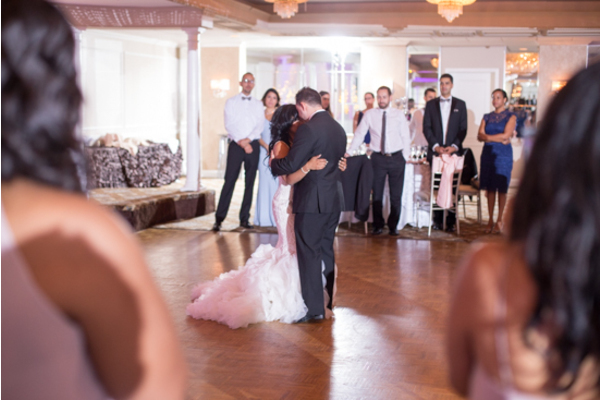 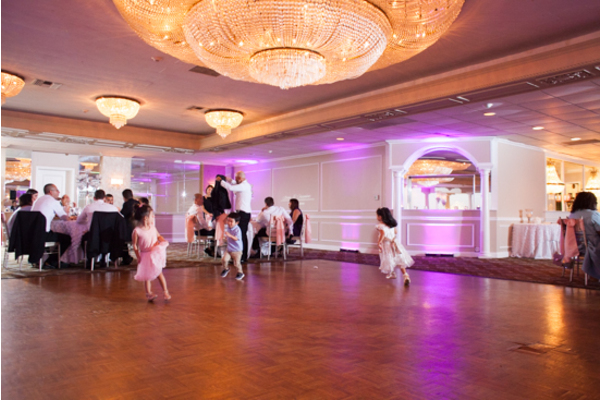 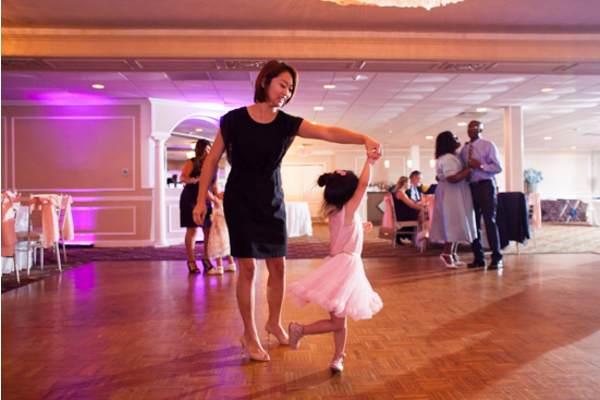 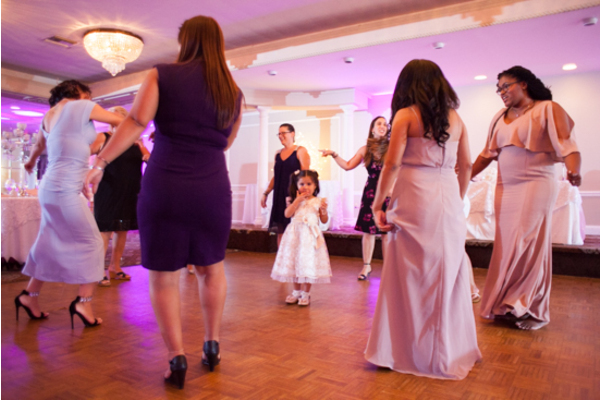 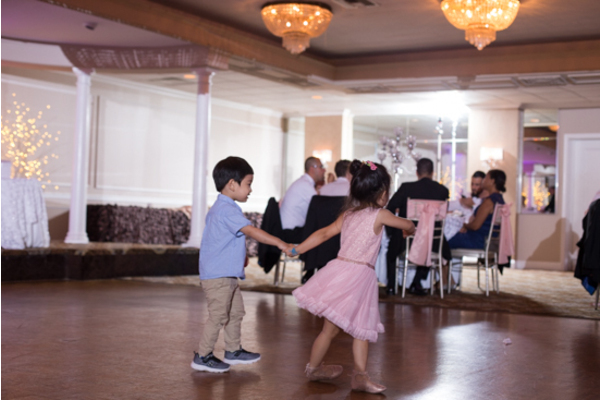 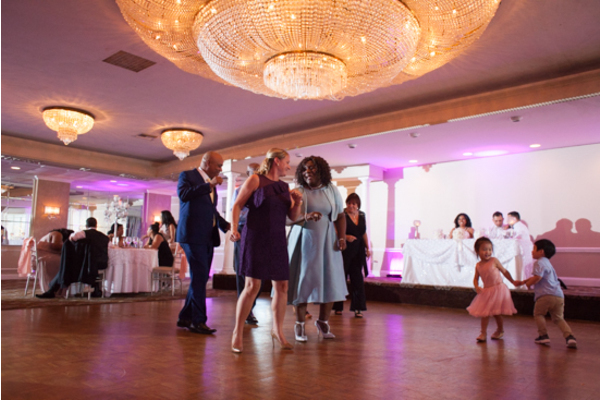 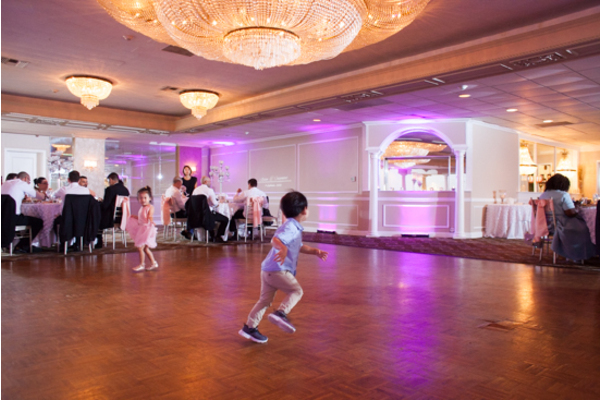 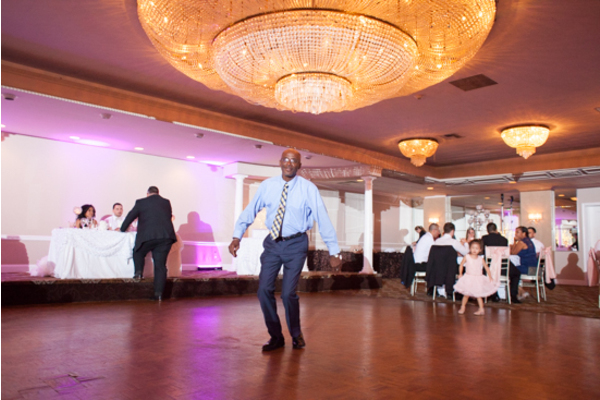 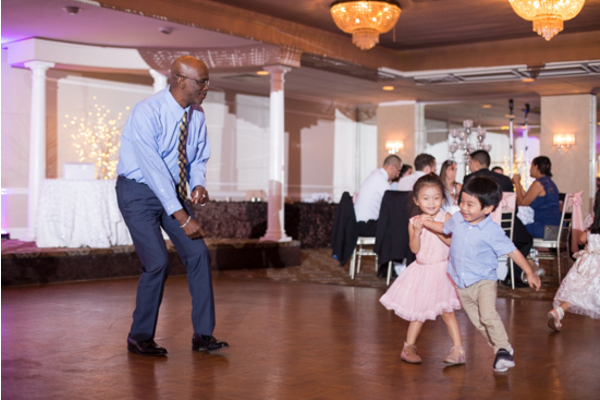 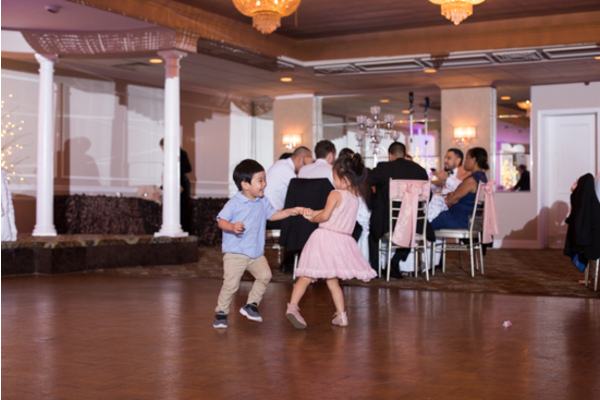 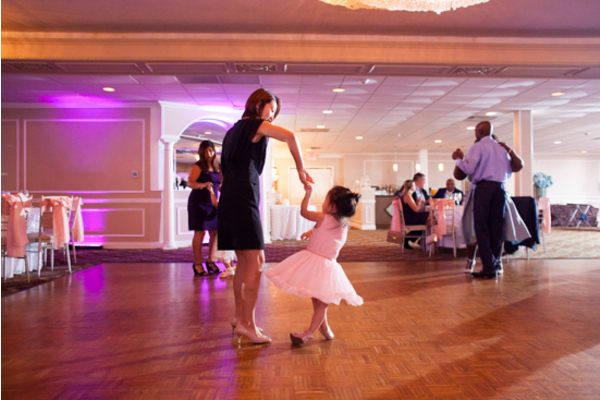 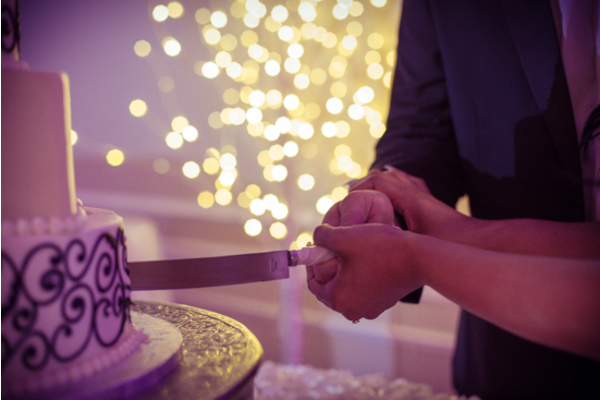 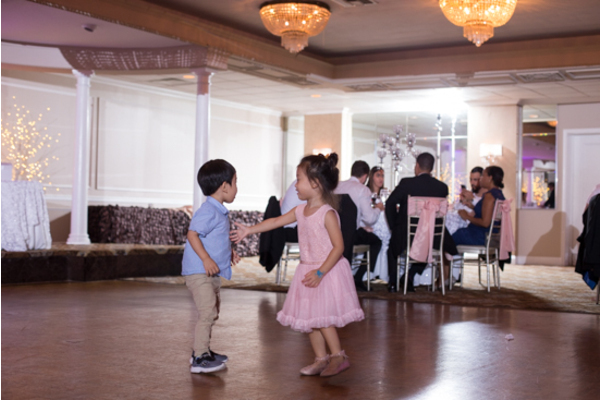 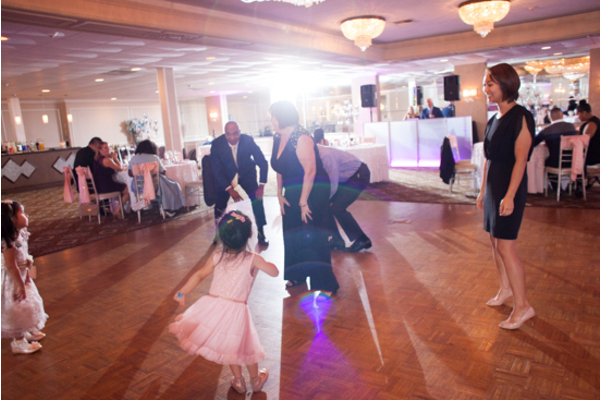 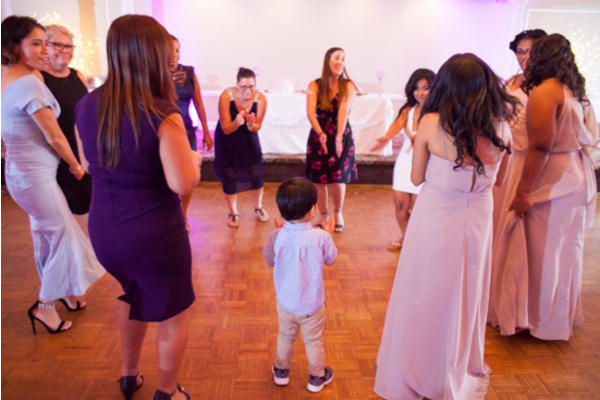 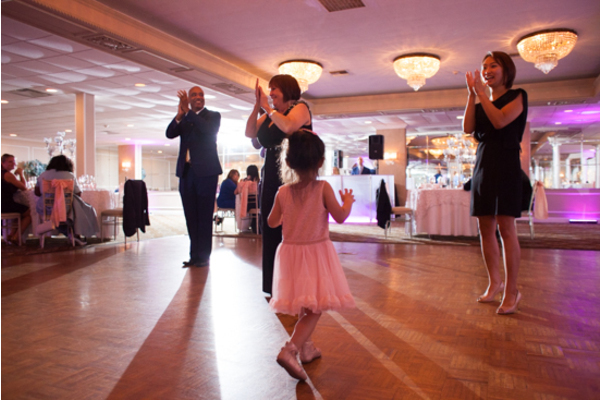 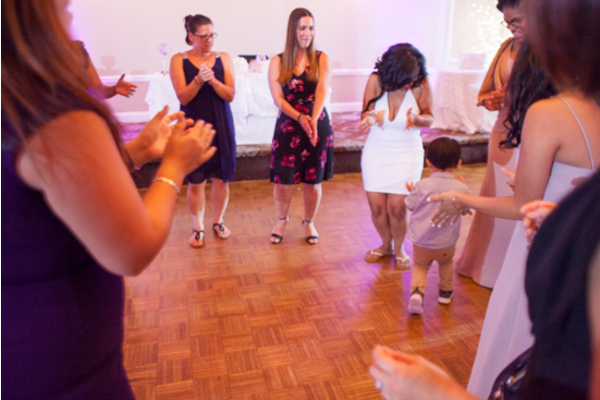 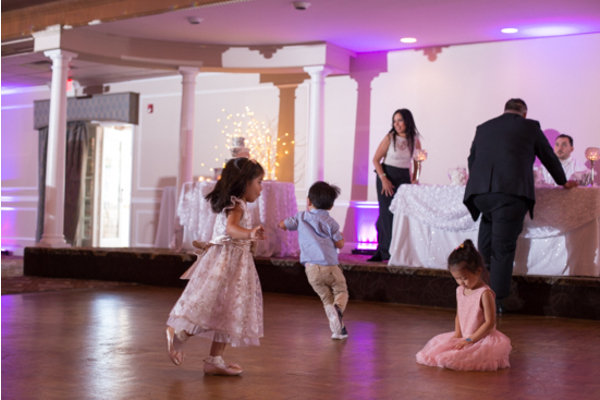 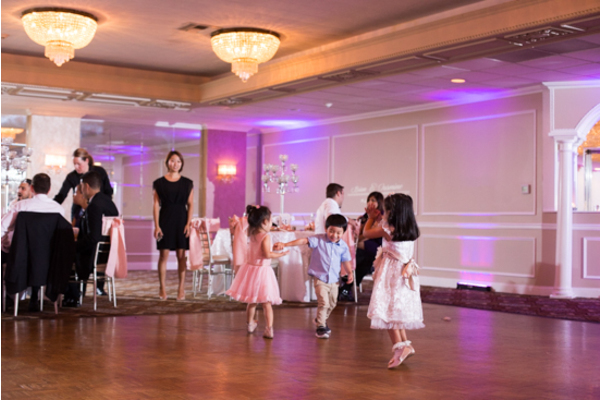 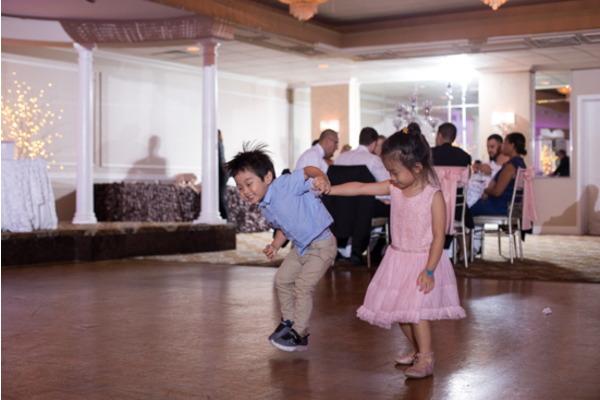 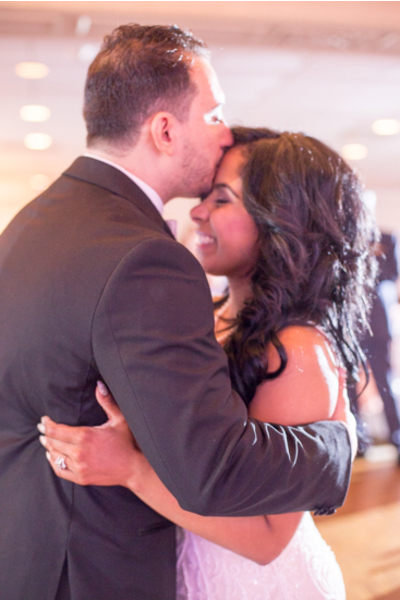 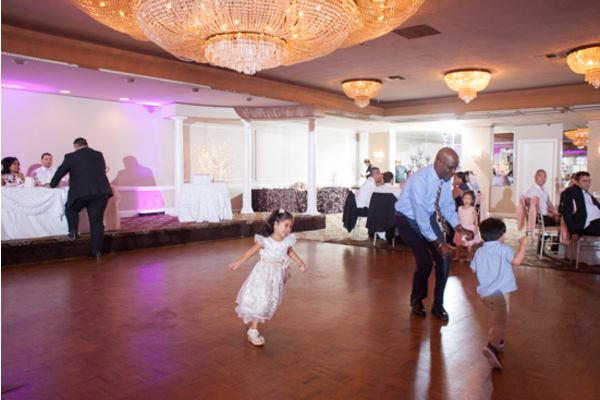 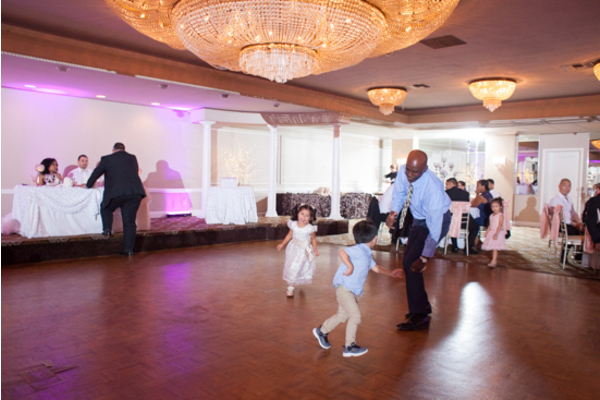 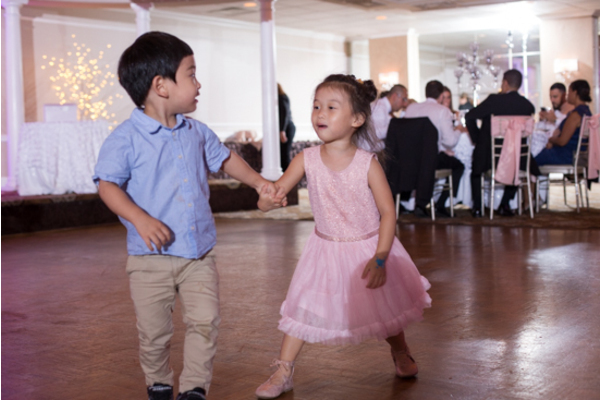 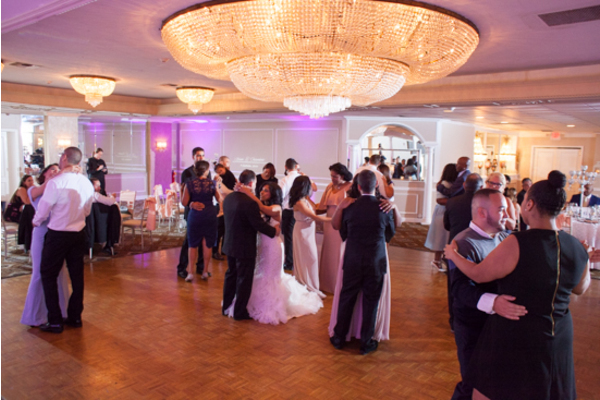 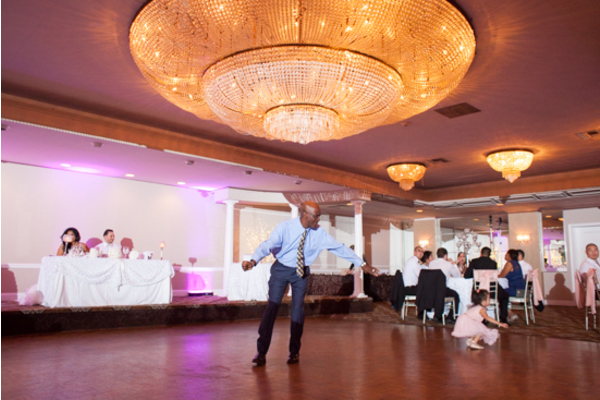 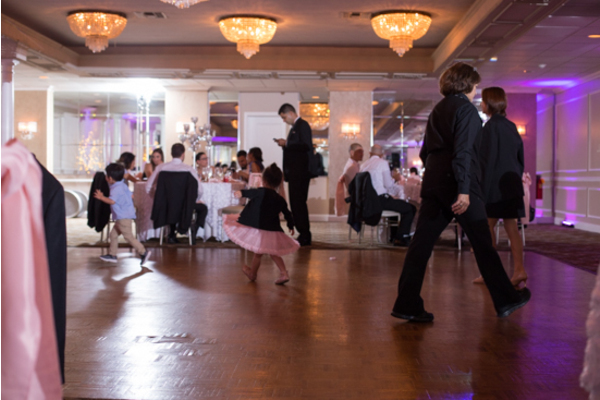 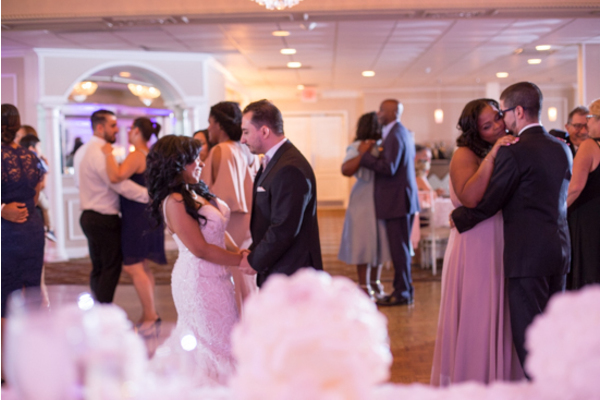 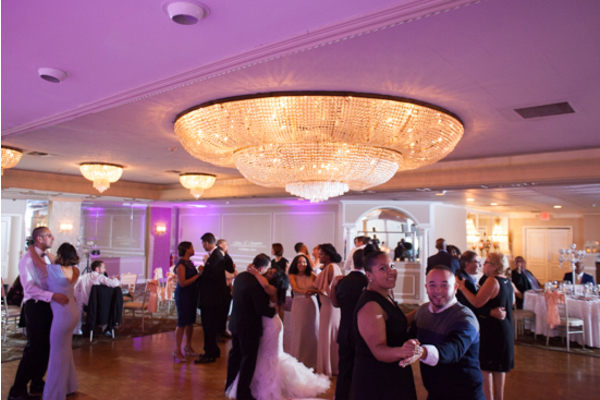 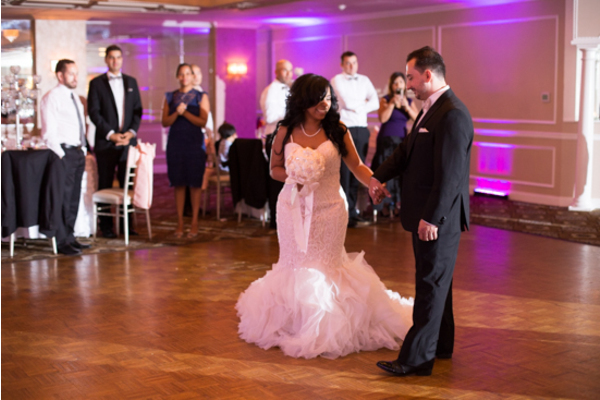 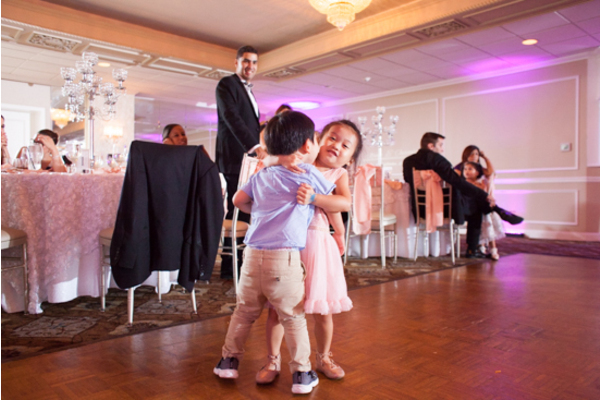 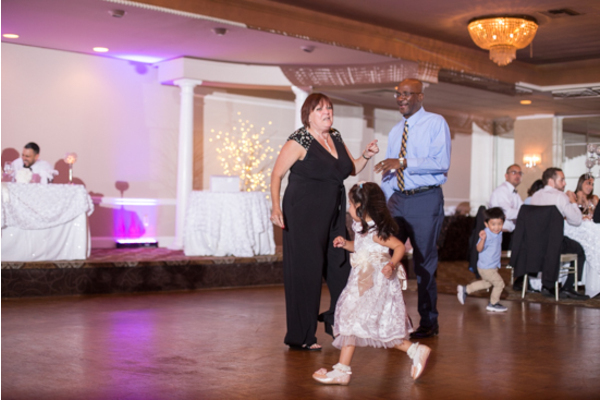 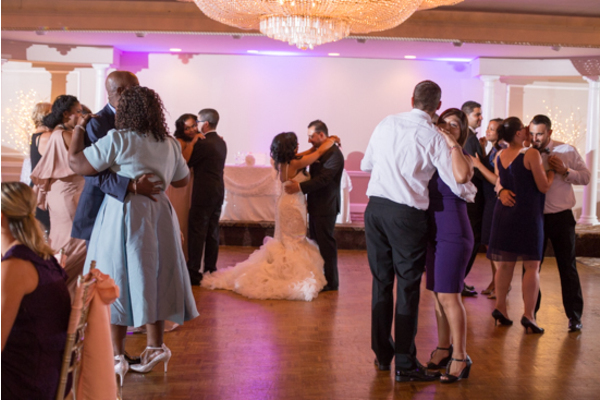 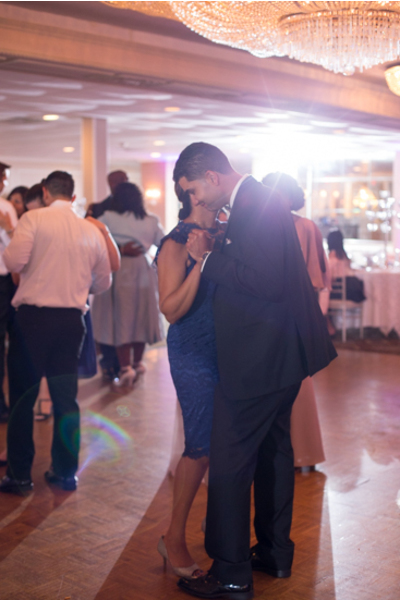 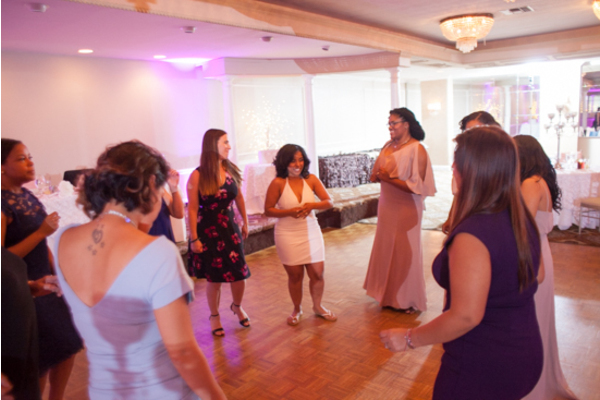 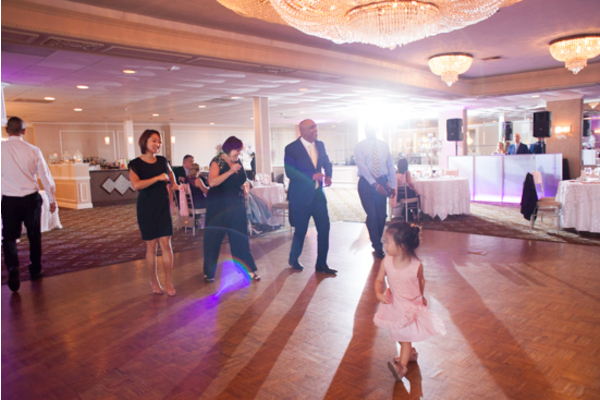 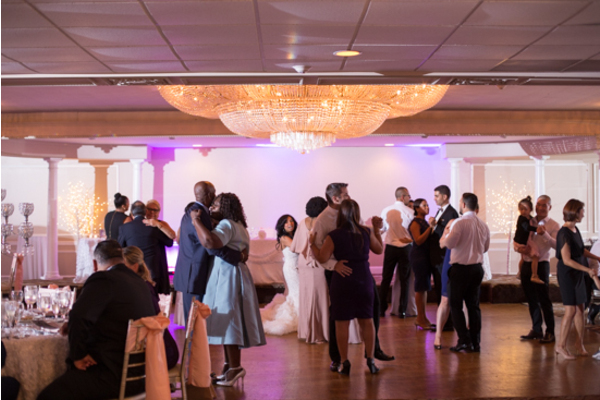 The couple shared their first dance together before their loved ones joined in on the fun. 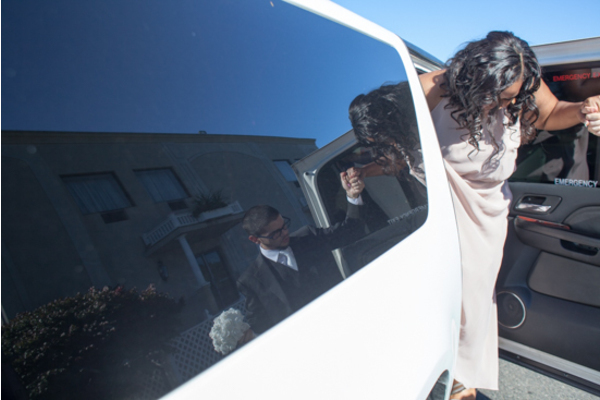 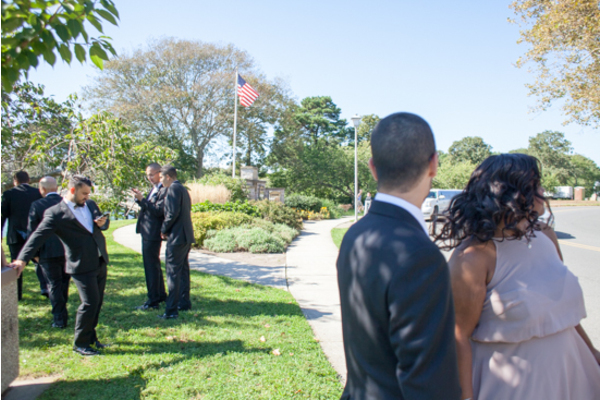 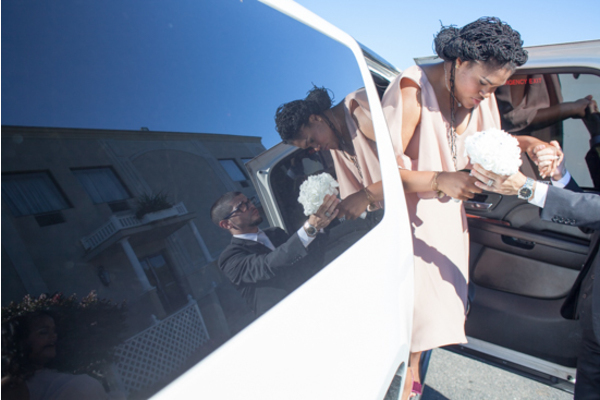 The amount of love these newlyweds shared for one another was truly evident on this beautiful day. 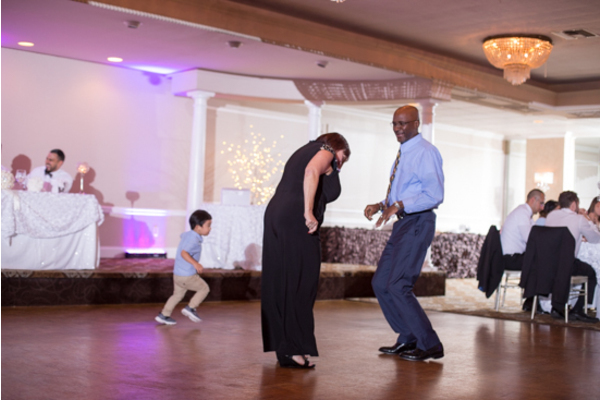 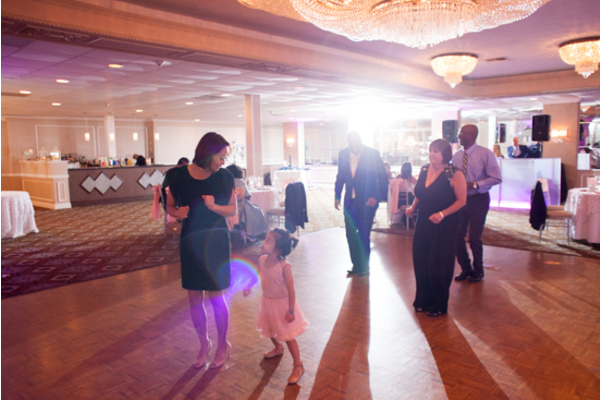 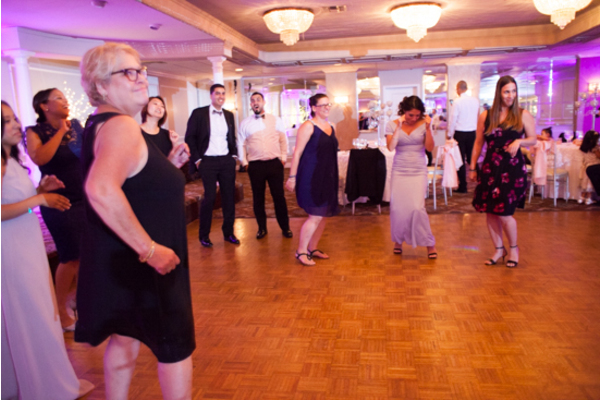 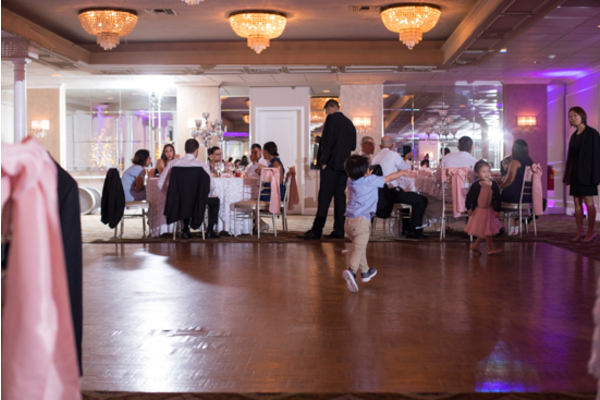 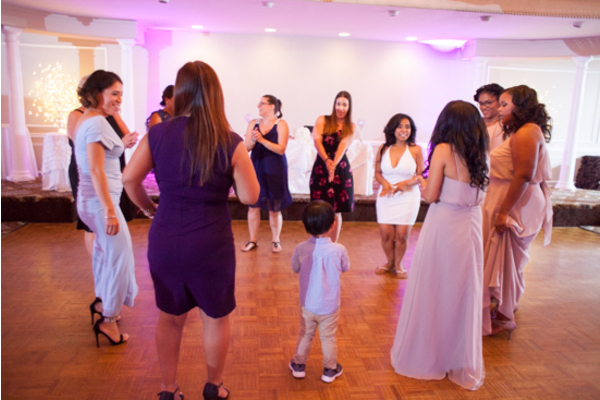 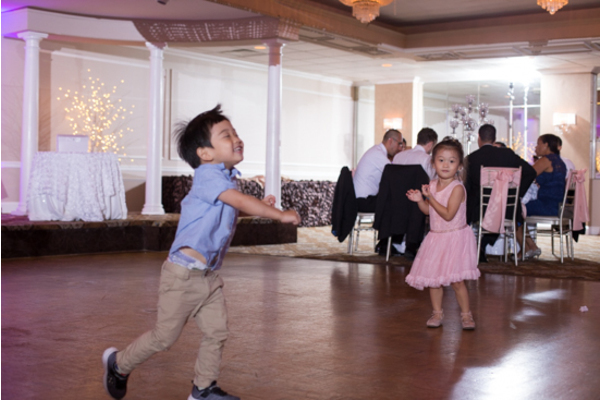 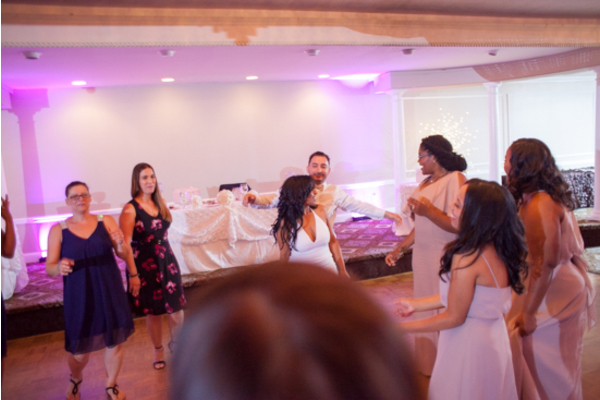 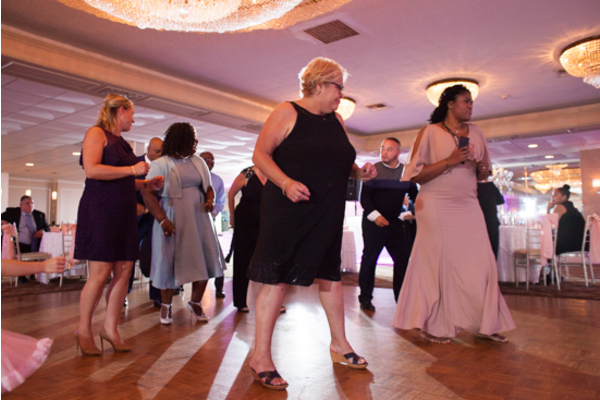 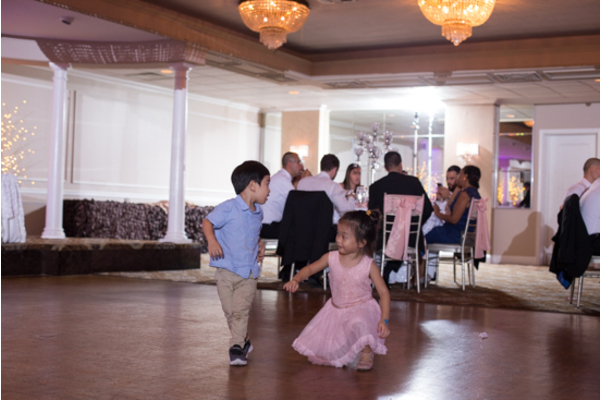 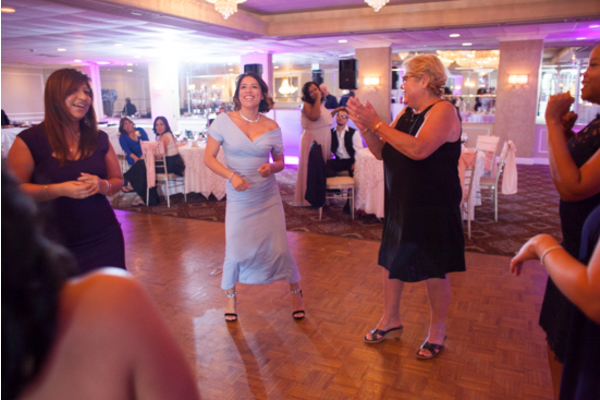 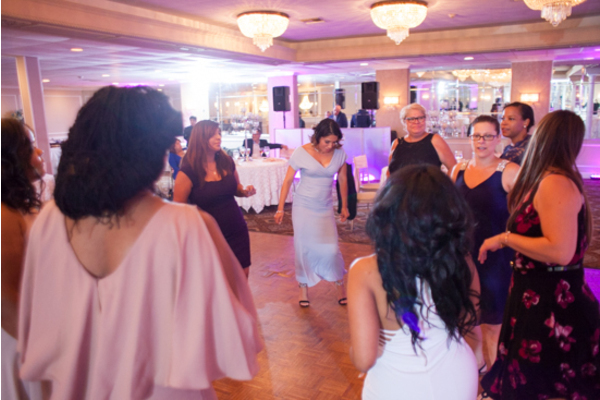 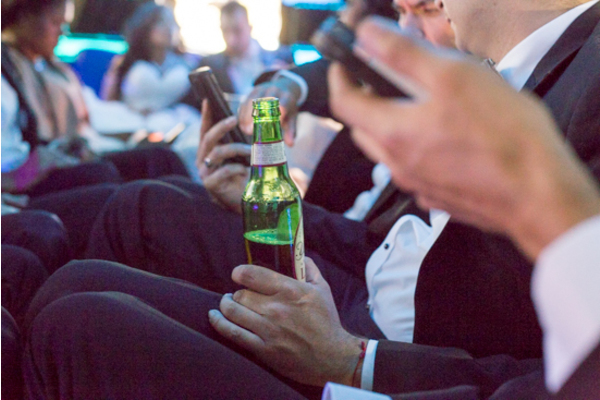 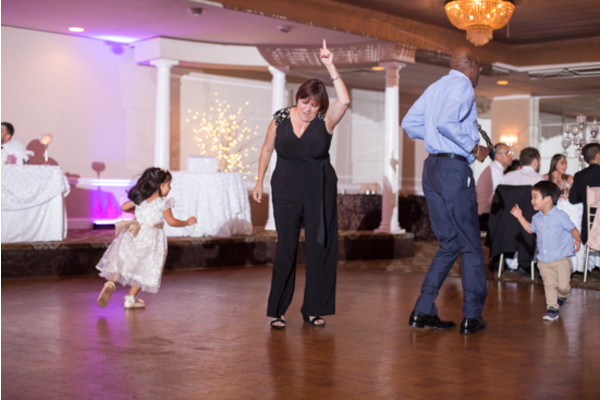 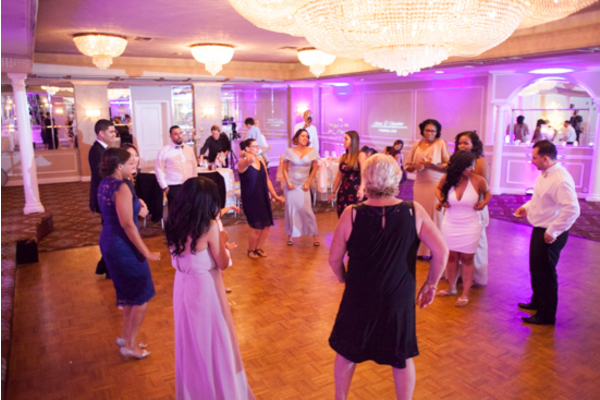 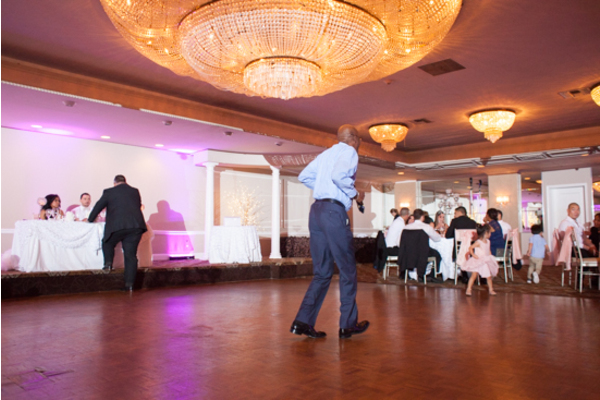 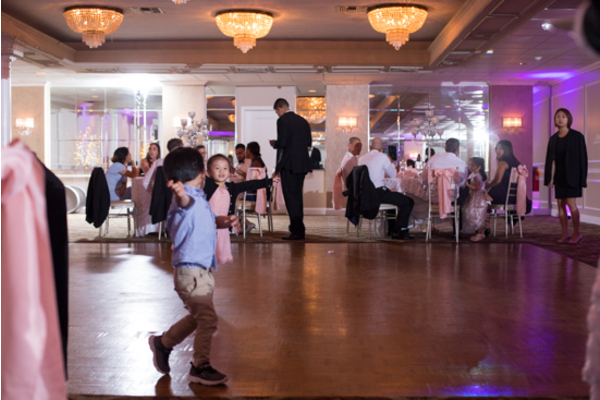 The remainder of the night was filled with heartfelt speeches, laughter and plenty of dancing. We are so grateful to have been apart of this celebration! 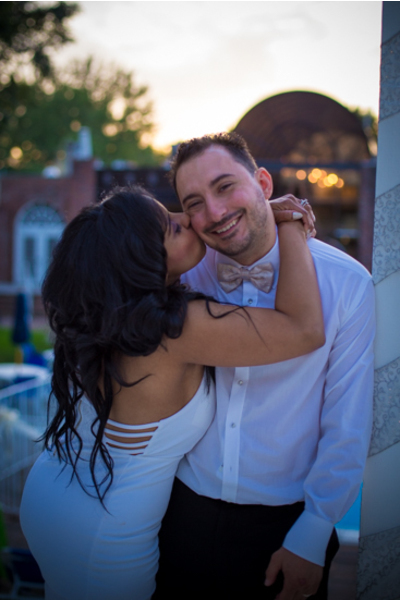 Congratulations, again, to the happy couple! 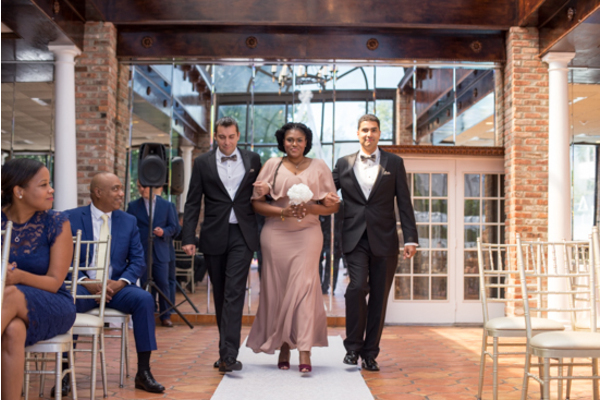 May your journey together be filled with as many smiles and laughs as shared on this special day!